Everyone is Off the Hill! 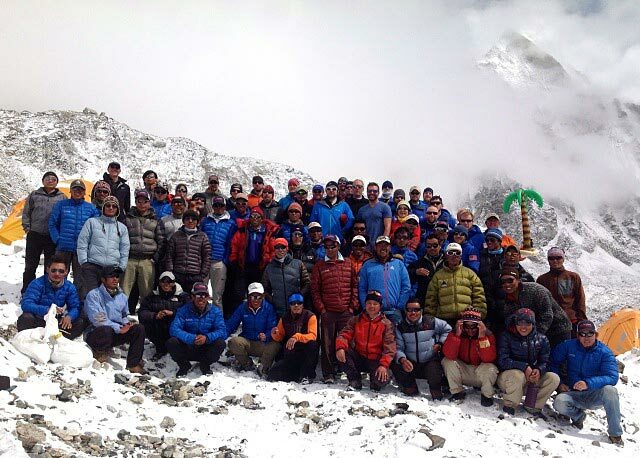 The Sherpas did the last carries this morning, and everyone is safe and sound off the mountain. Well done! 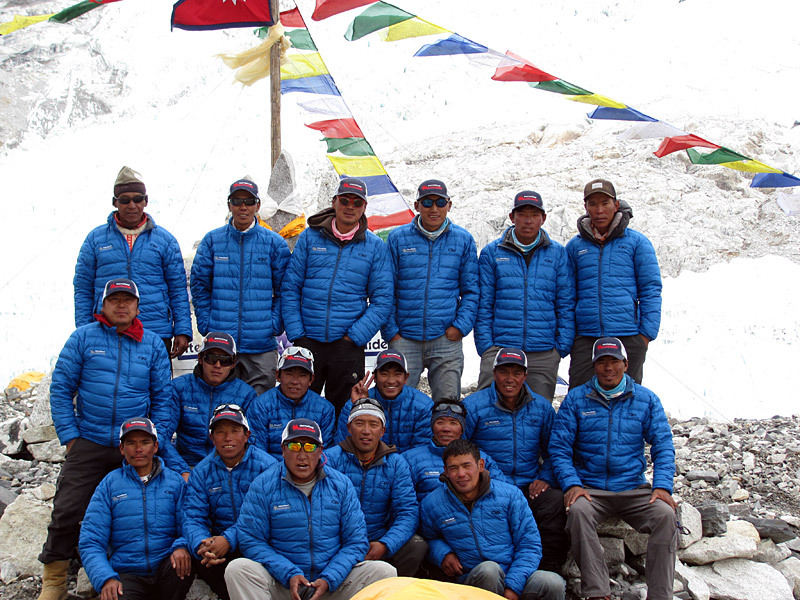 We are pleased to have seen 46 summits from our 2013 IMG team (44 on Everest, 2 on Lhotse). 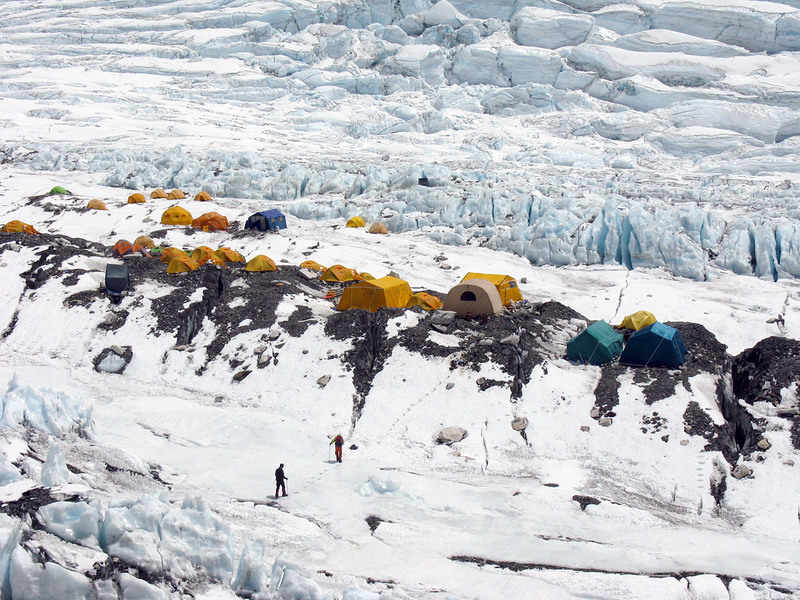 Most of the climbers have now departed Base Camp. Some are hiking and some are catching a ride on a helicopter, so everyone should be back in Kathmandu in the next couple days. Greg and Jangbu will be leaving in the morning, while sirdar Ang Pasang will be staying a few more days, working with his crew to finish drying tents and getting everything packed up for the yaks and porters. 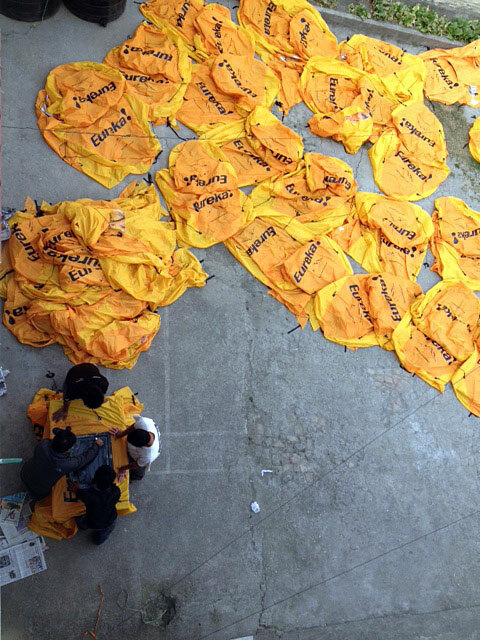 Gear in good shape will go to our storerooms in Gorak Shep and Pangboche, and items requiring repair or dry-cleaning will go back to Kathmandu. Per the rules of our permit, all burnable garbage goes to the incinerator in Namche, all cans and bottles go to Kathmandu for recycle, all human waste goes to the designated burial site (in the soil) down towards Lobuche, and all empty O2 cylinders go back to Kathmandu for re-export. Only after we have fulfilled all these conditions will we get our $15,000 garbage deposit back. 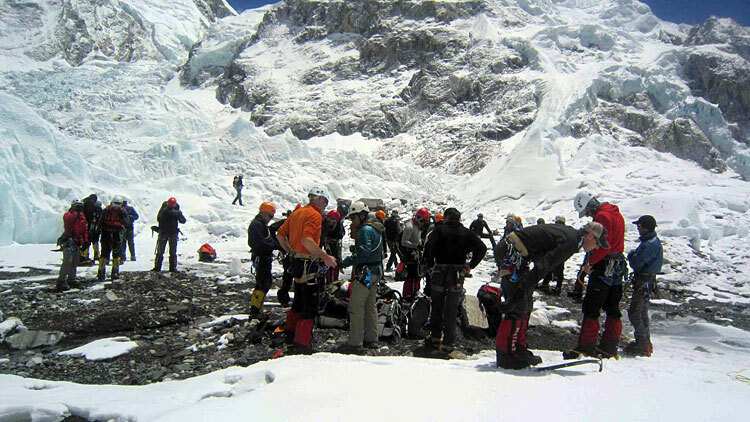 Greg and Jangbu report that all the IMG climbers have now arrived to Base Camp. The sherpa team did a big day today, hauling gear down from Camp 2. Tomorrow we have 37 sherpas going up to Camps 1 and 2 to bring the last loads down... so, one more big day for these guys. We won't be celebrating until the last person walks out of the Icefall tomorrow. Greg and Jangbu report that remaining IMG climbers are at Camp 2, doing well, and will be coming down to EBC in the morning tomorrow. Today we had 20 IMG sherpas climb to the Col from Camp 2, pack up everything, and then they descended all the way to base camp with the loads! Tomorrow morning we will have 43 sherpas heading up from Everest base camp to Camp 2, and bringing loads back down to EBC. The Sherpa team still have a couple more days of deconstruction and down-carries to do before everything is off the hill, but so far, so good. Greg and Jangbu report that yesterday's summit climbers are all doing well, with some of them staying at Camp 4 and some descending down to Camp 2. Phunuru is also still up at the South Col, doing a great job directing traffic and preparing loads. 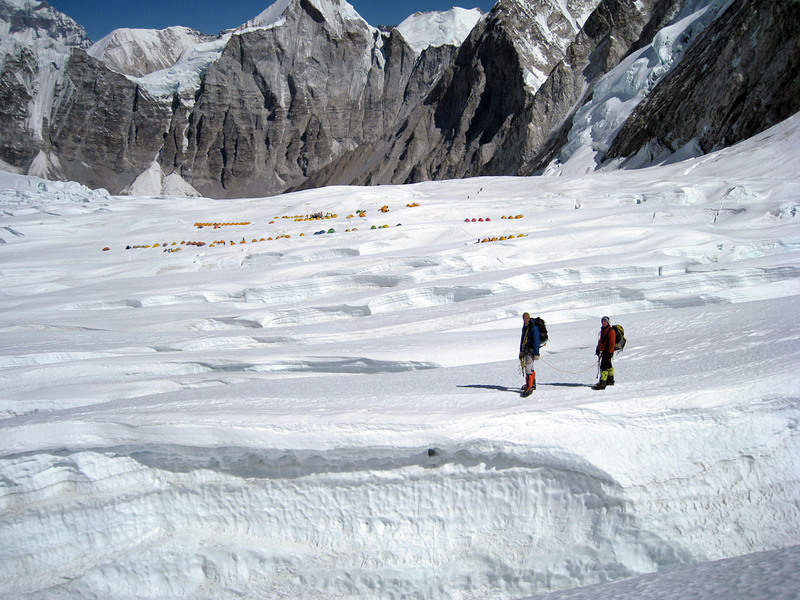 We have a big contingent of Sherpas headed back up to the Col in the morning to carry down the Camps 3 and 4. We'll keep you posted! IMG guide Justin Merle reports that he rappelled down the new descent route at the Hillary Step and says that it is a good option. 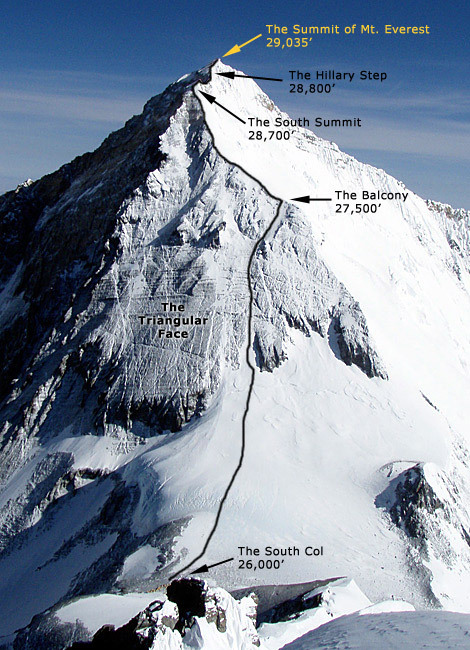 All the IMG climbers are now below the South Summit heading down, so that is good news. As with yesterday, the plan is for them to go to Camp 2 if they feel good, though some may hold up at Camp 4 for another night. We'll just see how everyone is doing when they get down to the Col. The IMG team has reached the summit. The weather is holding, and the climbers have now started the descent. Greg and Jangbu report that the IMG climbers have made their bottle changes at the Balcony and are now moving from there up the Southeast Ridge towards the South Summit. Weather is holding. So far so good! 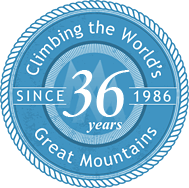 IMG leader Greg Vernovage reports that all of yesterday's IMG climbers are doing well. Most of them went on down to Camp 2, while Aaron is staying at the Col for another night with a few of them. Justin, Peter, and the final team of climbers and Sherpas had a good trip up from Camp 3 to Camp 4 and spent the afternoon eating, drinking and resting. Phunuru, who has been staying at the Col keeping everything running smoothly, reports that the weather is still looking good, and that the team has now departed for the summit. We'll keep you posted! Greg Vernovage reports that all today's IMG summit climbers are now below the South Summit and descending smoothly back to the South Col. We'll see how they feel when they get there and take a rest break... if they are feeling good, it would be normal for them to keep descending this afternoon on down to the thicker air of Camp 2. Guides Max Bunce and Aaron Mainer were busy up on the summit ridge, fixing new ropes for the alternative descent route from the Hillary Step which is now a reasonable descent option to prevent traffic jams. The third and final wave of IMG climbers that left Camp 3 this morning are also doing well, and they are now above the Yellow Band on their way up to the Col.
2nd Round of IMG Summits! 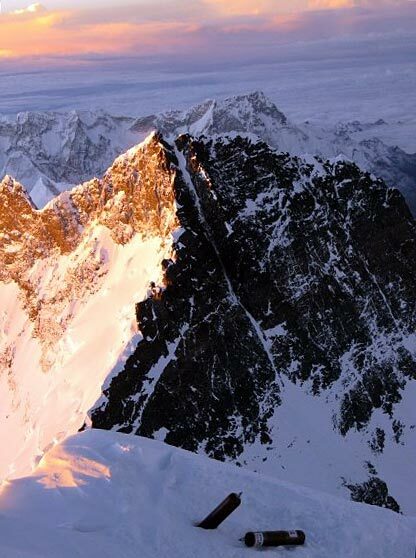 IMG guides Max Bunce and Aaron Mainer called from the top to report that the IMG team has reached the summit, and that the climbers are now on their way back down. Weather is good and the team is doing well. Greg and Jangbu report that IMG team has now passed the Balcony. They did their oxygen bottle changes there, and are now moving on towards the South Summit. Weather is holding! 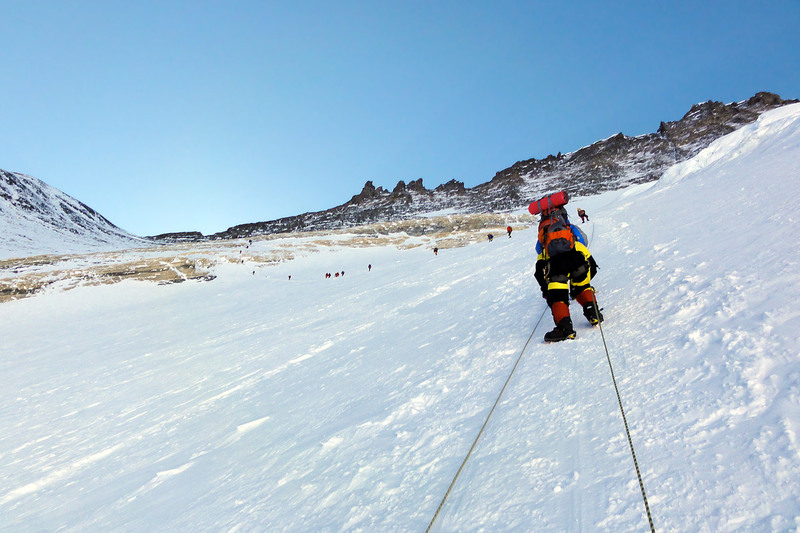 IMG guides Max Bunce and Aaron Mainer report from South Col that our next summit team (including the USAF climbers) are starting the climb to the Balcony. Weather is good, with light wind and clear sky above. 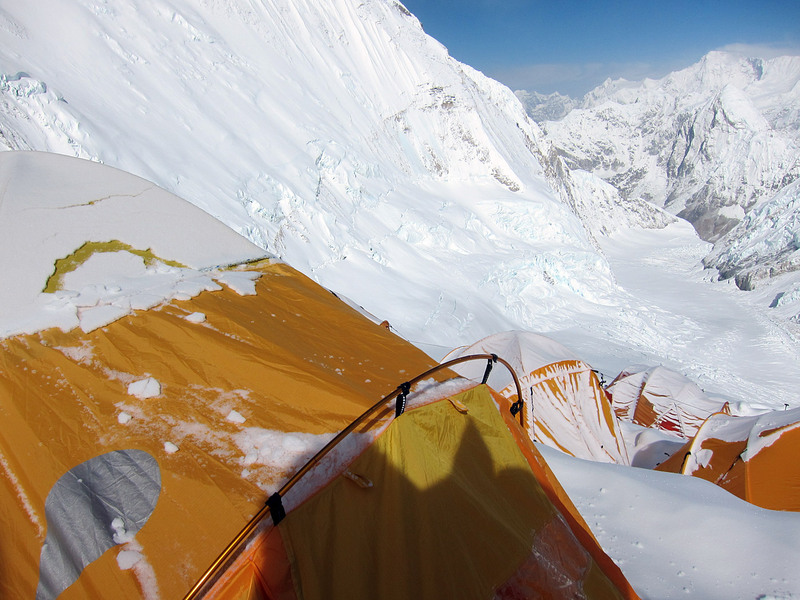 Paul and Chhewang made it back to Camp 2 in the afternoon after descending from Lhotse. 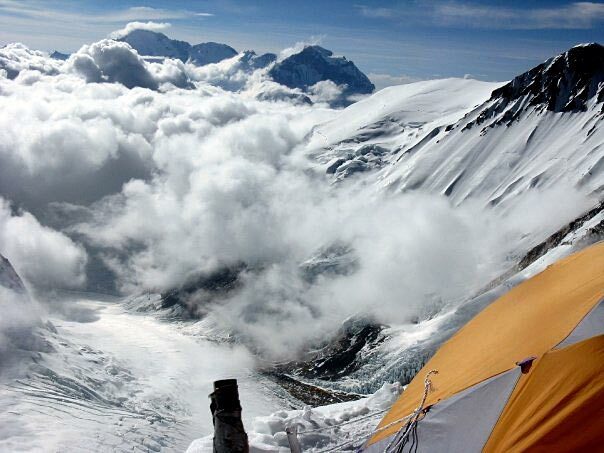 Climbers on the last team are all doing well at Camp 3 and are planning to go to the Col in the morning. We'll keep you posted! 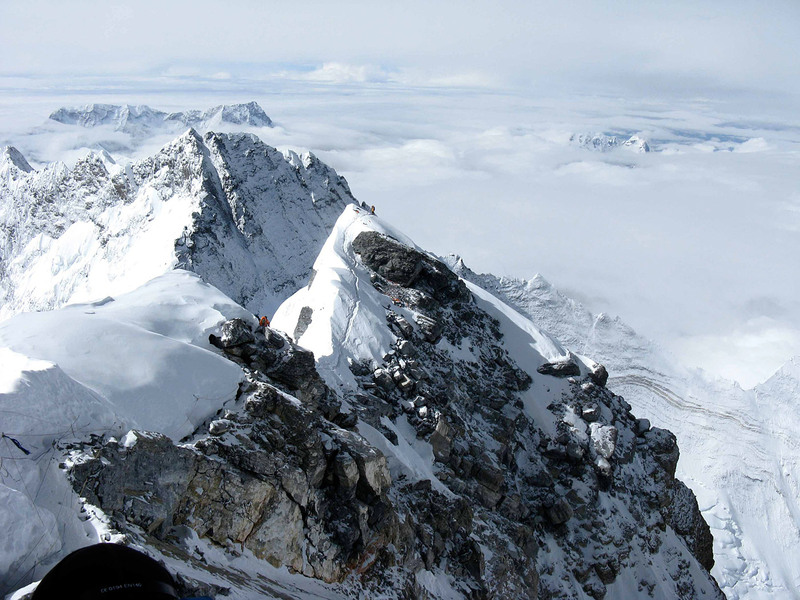 Greg and Jangbu report from Base Camp that Paul and Chhewang left Lhotse Camp 4 at 2:25AM, and reached the summit in just under 5 hours via the very steep and direct Lhotse Couloir. 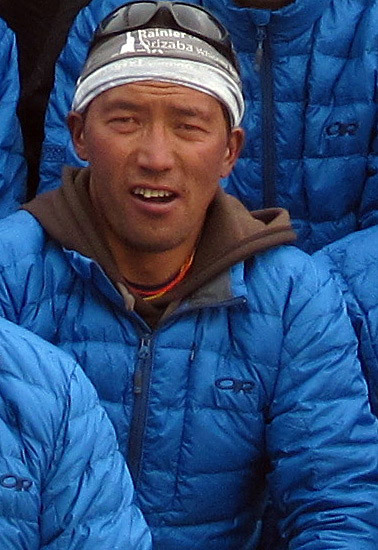 This is Chhewang's 8th Lhotse summit (he is the record holder). They report the weather is good today and the wind is low up high. After a few summit photos, they will be heading down (rappelling the upper part), with the goal to make it to Camp 2. The Classic climbers that were at Camp 3 departed between 5:30 and 6:00AM with their Sherpas, and are making good progress towards the South Col. Also, the third wave of Classic climbers is moving up from Camp 2 to towards Camp 3 and making good progress. They will be joined by some of the climbers from the first attempt, including Peter and Justin, who will give it another shot. So far, so good! Greg and Jangbu report that Paul and Chhewang made it over to Lhotse Camp 4 and are all set to head up the Lhotse Couloir in the morning. 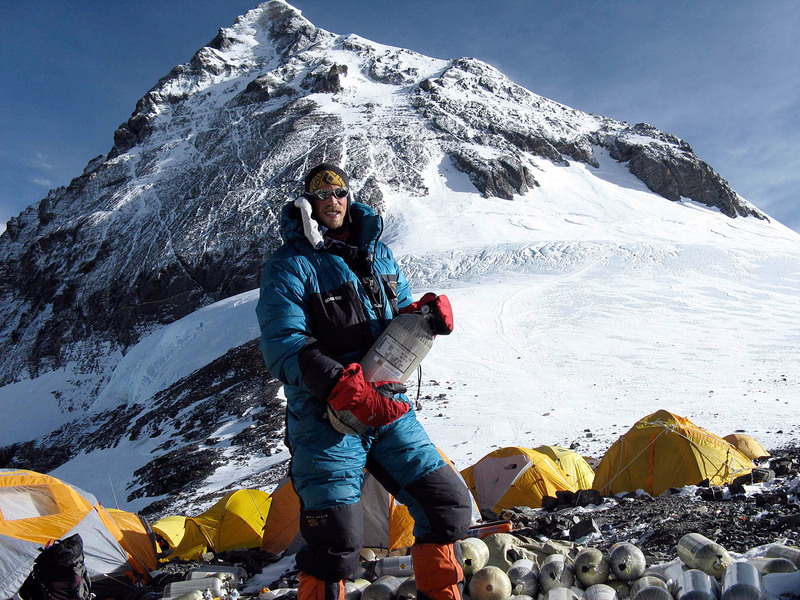 Hamill and the rest of the summit climbers all descended back down to Camp 2 and are well. 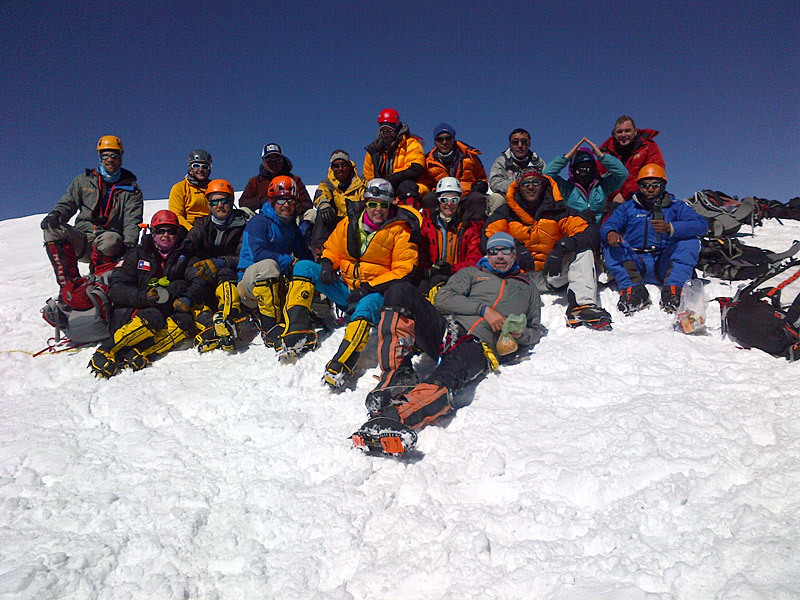 Along the way they met Max, Aaron and some of the Classic team and their sherpas at Camp 3. Sounds like everyone in that group (which includes the USAF climbers) are doing well. Down at Camp 2, the final wave of Classic climbers is preparing to head up to Camp 3 tomorrow, along with some of the team that bailed out from the Col from the first attempt. The weather is good and the forecast looks decent for the next few days, so we are hoping that it holds. 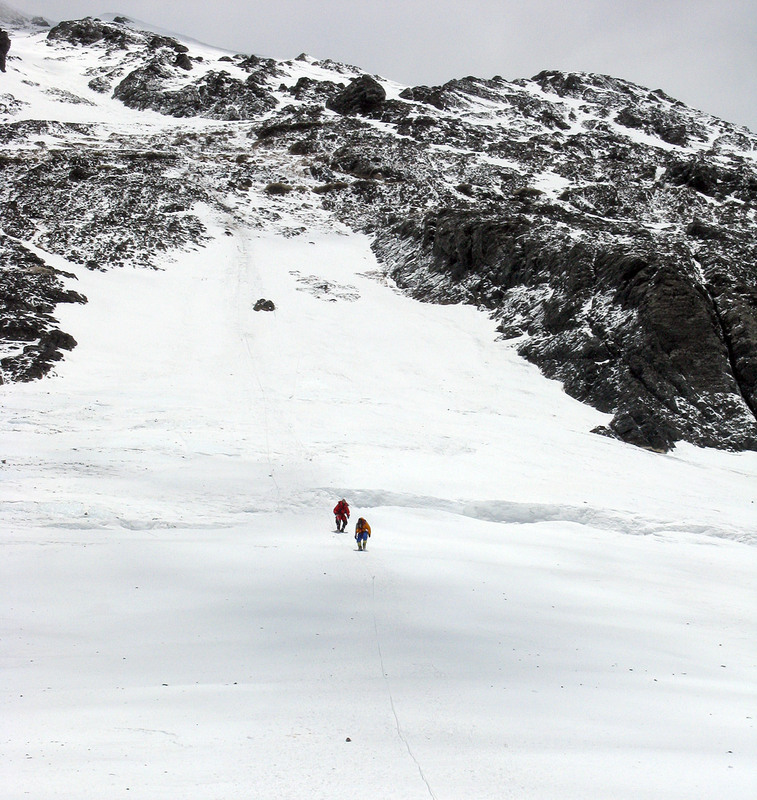 Greg and Jangbu report that today's summit climbers are all back to the Col and doing great. Mike, Mike, and Knut will be leaving shortly for Camp 2 while Paul and Chhewang will be heading over to Lhotse Camp 4, with their plan to climb Lhotse tomorrow. Lower down, the next wave of Classic climbers with Aaron and Max moved to Camp 3 today and are also doing well. Their plan is to go to the South Col tomorrow. So far so good! 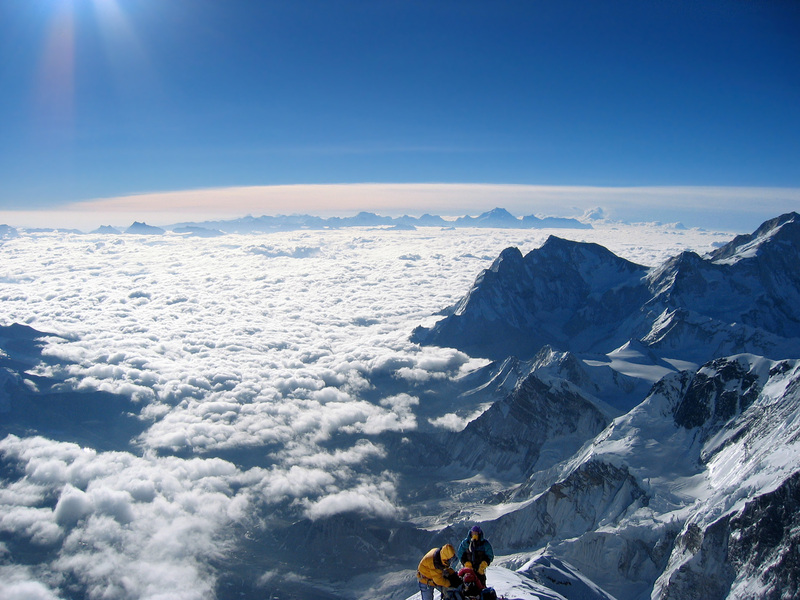 Mike Hamill called from the summit to report that the IMG team had a very nice ascent, reaching the top of Everest on 18 May 2013 between 5:55 to 7:15 AM. It was a beautiful morning to be climbing to the highest point on earth, with no wind up high. What a difference 24 hours makes! 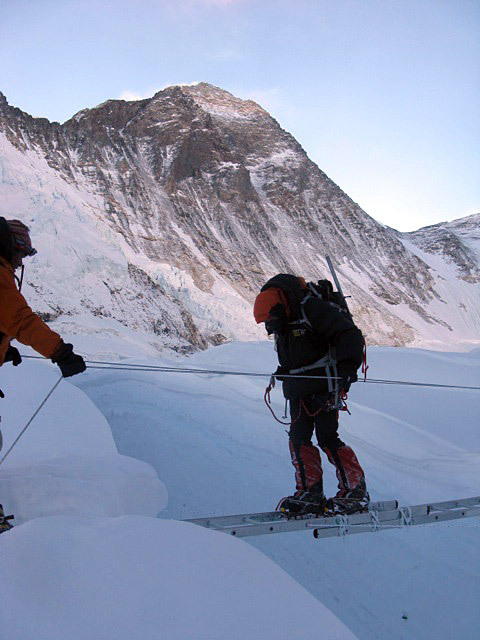 The climbers are now on the way back down to the Col.
Expedition leader Greg Vernovage reports at 2:45am Nepal time that our IMG team is above the Balcony. The team made it up there in 4 hours from the Col and did their O2 bottle changes. Sounds like the weather is not an issue, and they are making good progress ascending the Southeast Ridge towards the South Summit. The weather threw us a curve ball yesterday, with the winds continuing to be strong at the Col through the day (the forecast had them dropping). 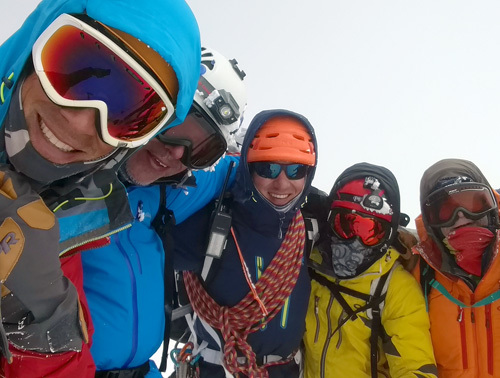 Several other teams did manage to persevere and make it to the summit, but the IMG guides decided it was just not quite good enough for what they wanted for a summit day. So, after ascending partway up towards the Balcony, the IMG climbers descended back to the South Col.
Today, some of the climbers decided to bail and head back down to Camp 2 while some elected to stay up and try again tonight. 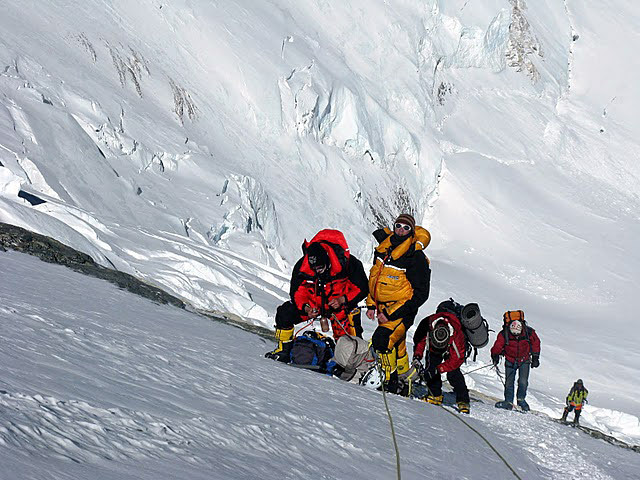 Currently we have Mike Hamill and his crew as well as a couple of the Classic climbers and their sherpas heading back up with Phunuru and the South Col Sherpas in support. They have now left the Col and are heading back up to the Balcony and report less wind and clear skies above, so we'll keep our fingers crossed on the weather for them! 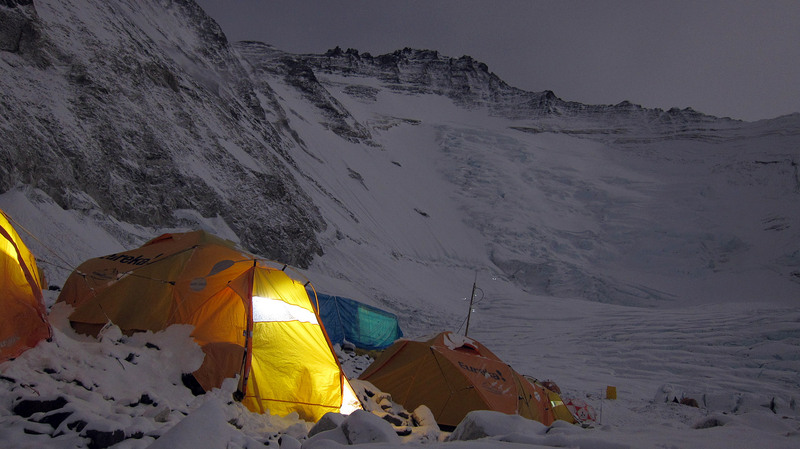 Classic climbers at Camp 2 remain in a holding pattern for now. We'll keep you posted! 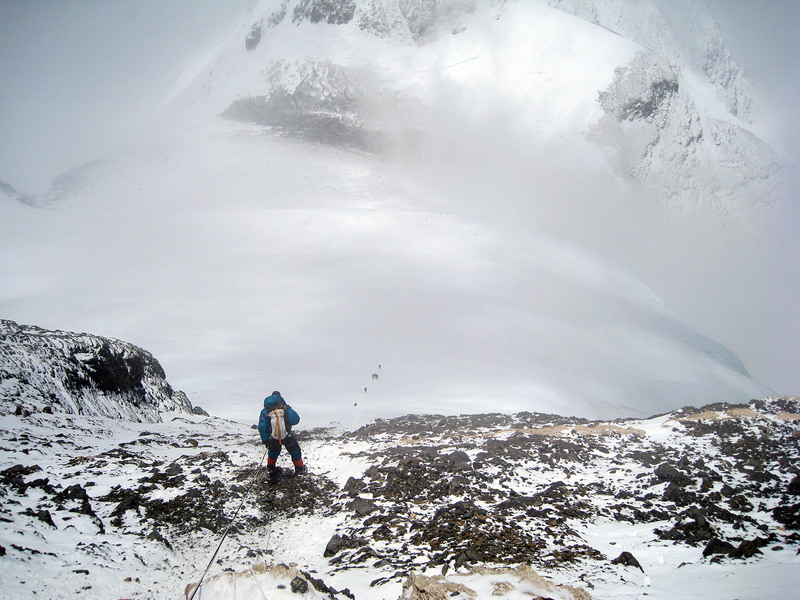 Greg and Jangbu report from Base Camp that the South Col team started out for the summit, but that once they got up onto the Triangular Face, the mountain formed a cloud cap with rime ice and gusty wind that was not looking like good climbing weather. So, they turned and have descended back to the South Col, then headed back into their tents, where they will be taking a rest and making a new plan for tomorrow. We'll keep you posted! Greg and Jangbu report that the IMG first summit bid climbers (guided, hybrid, and a few classic) are all doing well at South Col. They all did a good job on the Lhotse Face getting up through the Yellow Band and Geneva Spur, arriving up there at Camp 4 (on the South Col) before noon. This afternoon they spent the time resting, eating and hydrating. Winds were gusty when they got up there, but have died through the afternoon and are now getting pretty calm. 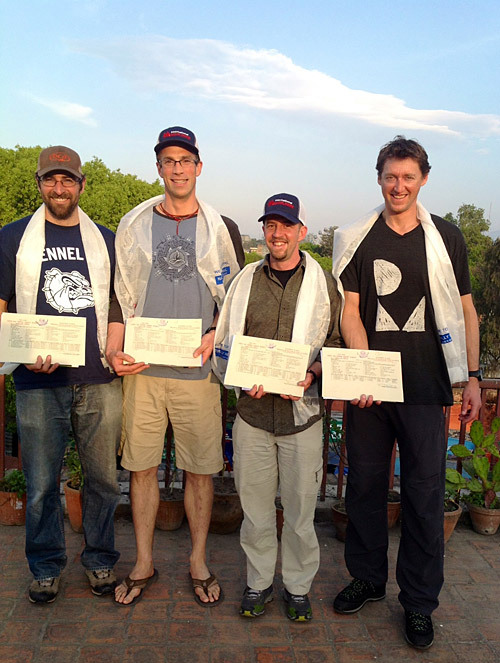 Everyone will be leaving for the top about 9pm Nepal Time (8:15am Pacific Time). Sounds like there are a few other teams up there but no big traffic jam problem to be expected thanks to Ang Jangbu, Dawa Steven, Gyanendra and Ang Temba who talked to all the different teams at Base Camp on the 12th. This year we know ahead of time exactly when the different teams will be climbing, so no surprises (like last year, when so many climbers all went up to the Col at the same time). At Camp 2 the remaining Classic climbers are all doing well. Tomorrow we have the first part of that group heading up to Camp 3, with the others take another rest day (they will go to C3 the following day). We'll keep you posted! 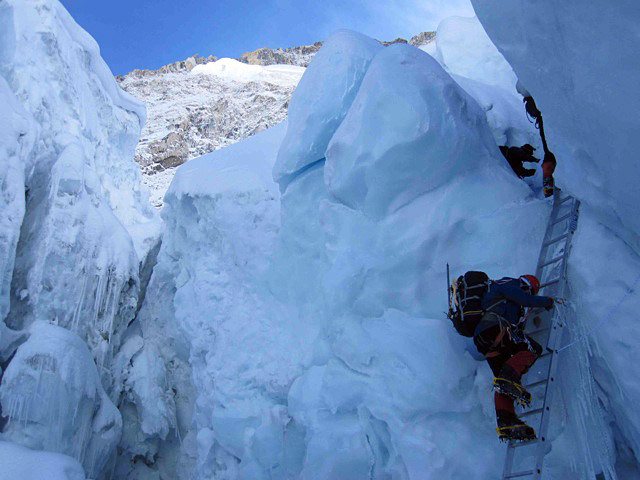 IMG leaders Greg and Jangbu report that Hamill, Merle, Anderson and the Guided and Hybrid teams moved to Camp 3 today, along with a few of the Classic climbers and eight of our top IMG sherpas. Most of the climbers made C3 by noon, so they have all afternoon to refuel and get psyched for tomorrow. Their plan is to get good sleep tonight (on oxygen) and then be ready to leave just after dawn for the climb to the South Col. 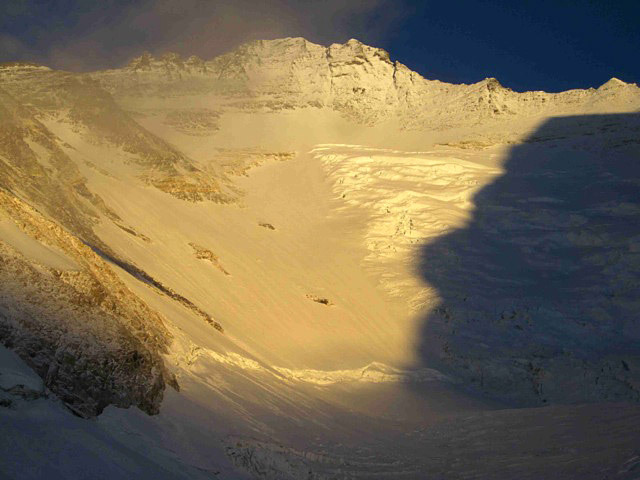 Tomorrow we have 6 Sherpas going to C3 to pick up gear and then move it to the Col. Then we have another 10 Sherpas including Phunuru and cook Pemba Dorje who will go direct to the South Col tomorrow and set up tents before members arrive from Camp 3 and then stay there to support the summit climb. The Classic climbers that went to Camp 2 yesterday are resting there today, while the climbers that went to Camp 1 are moving up to Camp 2. Down at Base Camp the last team of Classic climbers are ready to go, and heading up in the morning. Our weather forecasters confirm that the typhoon track is taking it away from the Everest area. The winds were still strong up high today, but are predicted to start dropping soon as the jet stream moves north. We'll keep you posted! Our weather forecasters are now predicting that the jet stream is starting to move to the north, and the winds are projected to start dropping over the next few days. 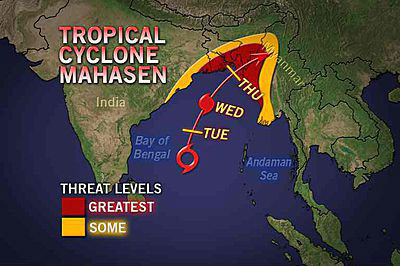 Also, the storm track for Typhoon Mahasen is now predicted to turn to the east. That is all good news for our Everest climbers (but unfortunately is bad news for the people of West Bengal, Bangladesh, and Myanmar). We'll be keeping a close eye on all of these developments and are hoping for the best for everyone. Our current plan is to move forward with our summit bids starting tomorrow. We have Guided and Hybrid groups at Camp 2 and Classic climbers at EBC, ready to go. We'll keep you posted! Greg and Jangbu report that the Guided team moved up to Camp 2, and the Hybrid team moved up to Camp 1 to get in position. Everyone is doing well. 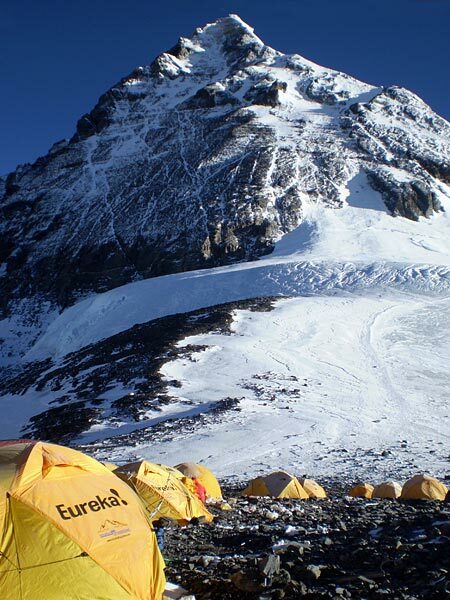 Tomorrow the Hybrid team moves to Camp 2, and the Guided takes a rest at Camp 2. We continue to monitor the weather closely. 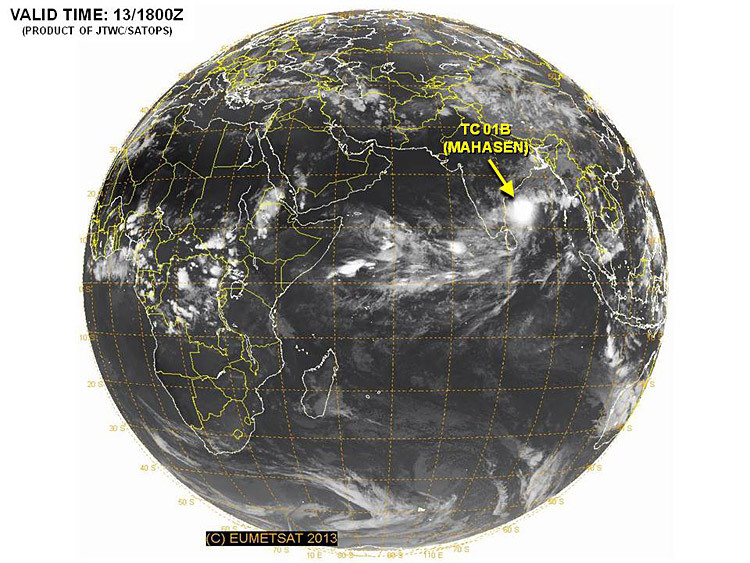 In particular, the depression in the Bay of Bengal has become tropical cyclone (hurricane) number 01B, now named Mahasen. 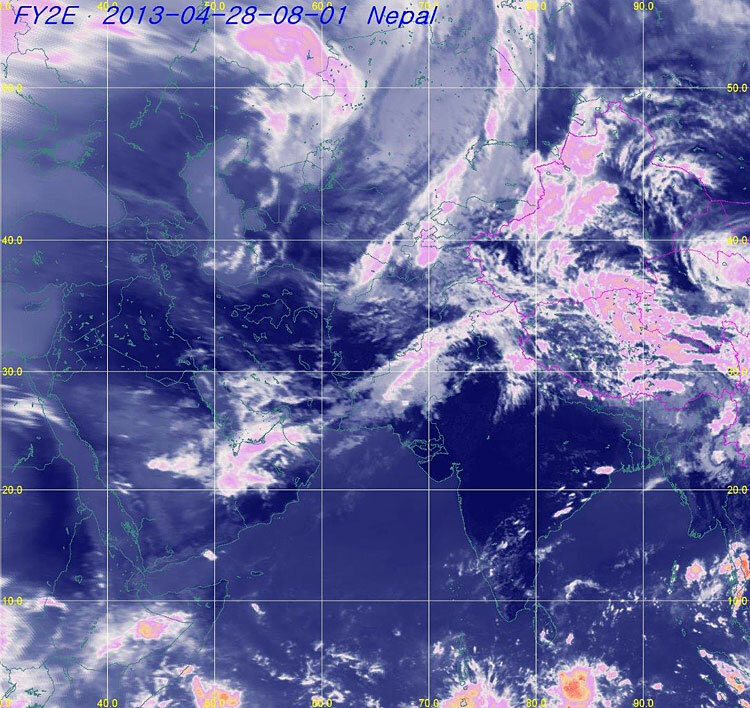 Weather forecasts still have the storm moving to the east, toward Bangladesh, but there is a chance of the Nepal Himalaya getting brushed by some of the winds and moisture associated with it. IMG leader Greg Vernovage reports that the weather moved in overnight with snow at all the camps and strong winds up high. So, all the IMG climbers and sherpas are taking a rest day today. We will evaluate the new weather forecasts and make a final decision later in the day regarding plans for the following day. 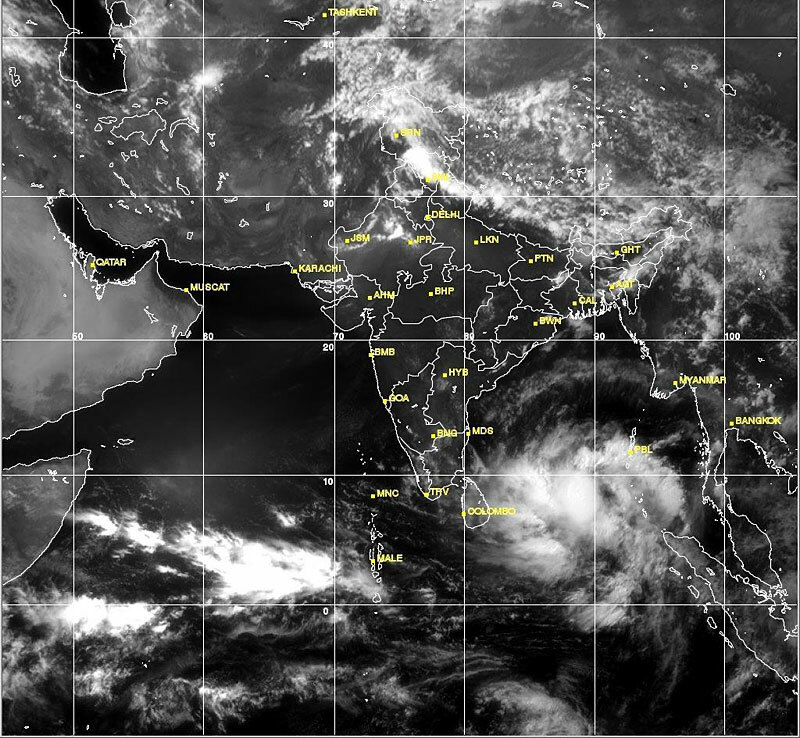 The weather forecast for later this next week is looking better, though there is a depression in Bay of Bengal which our forecasters are watching (we are hoping it does not move north). To keep the options open, we are moving the first team up the hill to start getting in position. For the first attempt we have Hamill and the guided team, Merle and Anderson with the Hybrid team, and several of the Classic team. They will go to Camp 2 tomorrow. Also moving tomorrow we have 15 sherpas carrying to the Col, 7 sherpas moving up to C2 to stay, 1 to Camp 1 and 3 carrying to Camp 3. We'll keep you posted! Ang Jangbu reports that eleven sherpas from the fixing crew reached the summit today including IMG's Pasang Kami (Phortse) and Tsheten Dorjee (Pangboche). Congrats to all these guys for a job well done. Sounds like the winds stayed pretty low and conditions were decent. The sherpas reported knee deep snow across the Traverse to the Hillary Step, so it is good-they broke a good snow trail across there (as opposed to rock slabs). The team was able to establish several additional rock anchors for the alternate descent route (climber's left of the Hillary Step), so that will enable the second rope to be put in place up there. 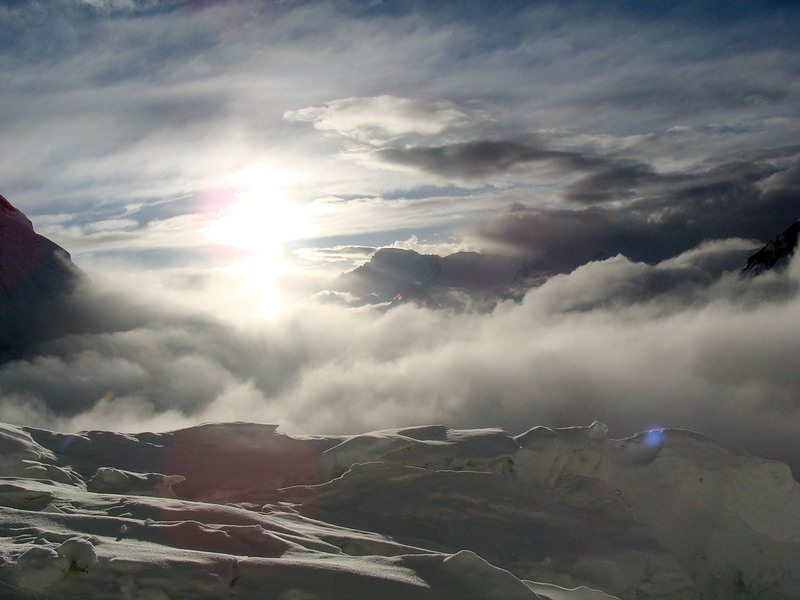 We are hoping to send the first wave of climbers up from BC in the next couple days, depending how the forecast looks. Good news from up high. 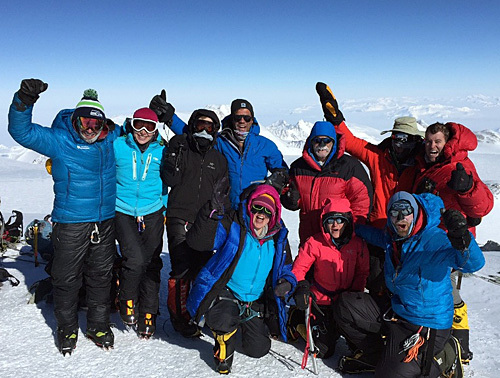 The wind dropped, and the rope-fixing team with our IMG sherpas made it to the South Col. 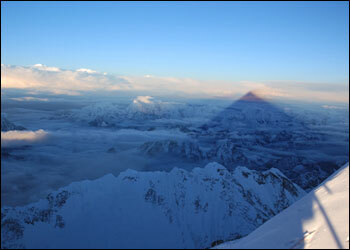 While some of the sherpas prepared Camp 4, the others managed to get the route fixed up the Triangular Face to the Balcony. Now the fixing crew are ensconced back at Camp 4, planning to head out at 3am for continuing the fixing up the Southeast Ridge above the Balcony. 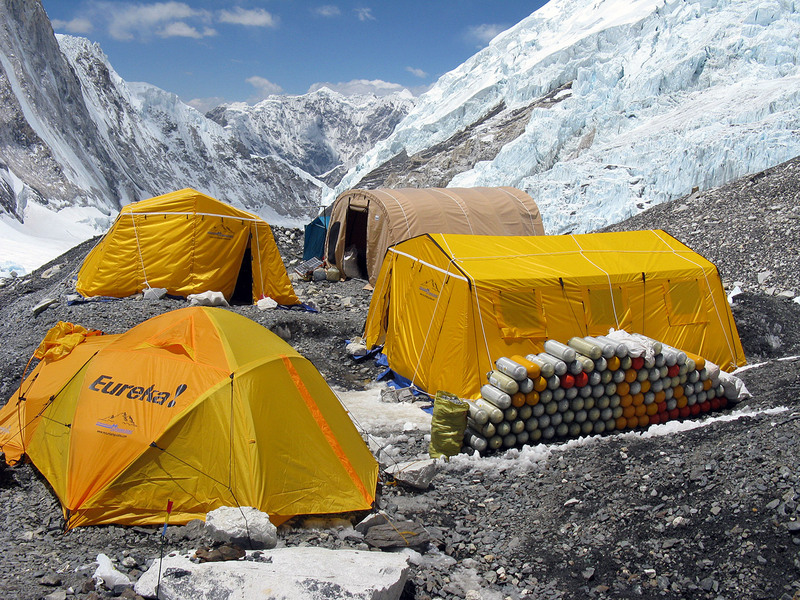 At Camp 2 we have 22 sherpas ready to carry more supplies up to the South Col tomorrow. 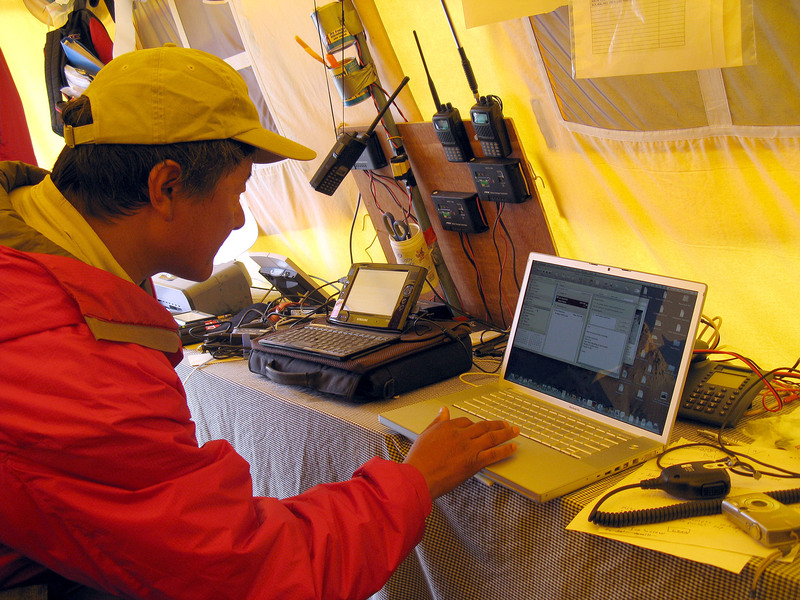 At Base Camp, the IMG climbers are all doing well and continue to keep a close look at the weather forecasts. As soon as the route is fixed and the weather forecast looks reasonable, they will be ready to start the summit attempts. 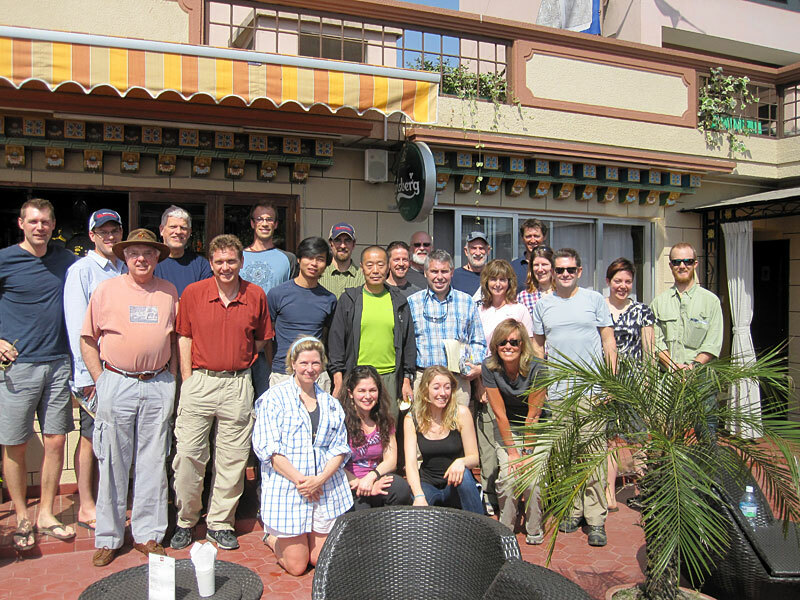 For the first time in the entire expedition, we now have all the IMG climbers and guides together at Base Camp! Today they were practicing with their oxygen tanks and masks, to get ready for the summit bids. 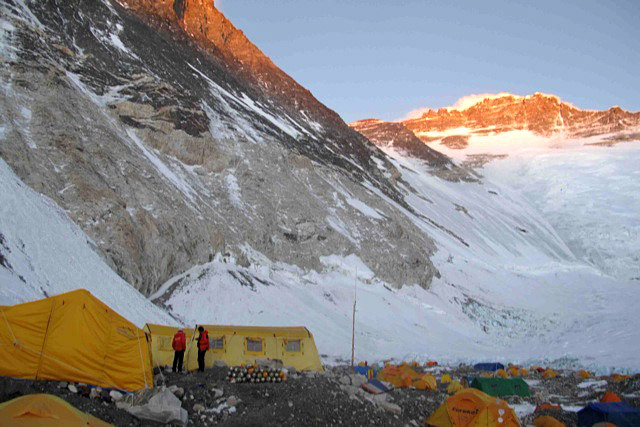 The climbers will start using supplemental oxygen at Camp 3, and the sherpas will start using it at Camp 4. It is super important to practice for the cylinder changes up high, and also get familiar with the oxygen masks to ascertain a good fit with the hats, goggles, and hoods. IMG leaders Greg and Jangbu report that the rope fixing plan has been agreed upon with ten teams (IMG, AAI, JG, Global Adventure, Arun, Peak Freaks, Himex, Astrek, Miura, Seven Summits) working together to carry 13 loads to the Col (11 loads of rope with 2200 meters total and two loads of hardware). Then we have 14 sherpas from 6 teams staying up on the Col to start fixing (IMG: Pasang Kami, Tseten Dorje, Damai Sarki; AAI: Thapke, Phura Kancha; Himex: Phurba Tashi, Nima Tenzing, Nawang Tenzing, Gyalzen Dorje; Astrek: Shera Gyalzen, Pemba Tshiri; Seven Summits: Lhakpa Thundu, Mingma Dorji; AC: Kami Rita). Tomorrow we also have 19 IMG sherpas carrying more oxygen and supplies to the Col from Camp 2 to finish getting all our gear up there for summit bids, and we have another 22 IMG sherpas carrying up to Camp 2 from EBC to keep the logistics flowing up the hill to support these efforts up high. So... all the pieces are in place, and we'll be keeping a close eye on the weather for the next few days. IMG guide Max Bunce reports from Camp 2 that the last group of Classic climbers had a successful acclimatization climb on the Lhotse Face, reaching Camp 3. Also today, Max and some of the sherpas adjusted the fixed ropes to improve the route low on the Face. Max said the wind was really ripping up high on the mountain, with the "freight train" on the South Col audible all the way down at Camp 2! The latest weather forecast has at least one more windy day coming, with a drop still predicted for the 9th/10th/11th. Down at Base Camp Greg reports that the rest of the climbers and sherpas had a good rest day today, enjoying the good food and thick air. Tomorrow morning Ang Jangbu is sending 20 sherpas back up to Camp 2 to support the summit fixing push, and the Classic climbers at Camp 2 will be coming back down to Base Camp. 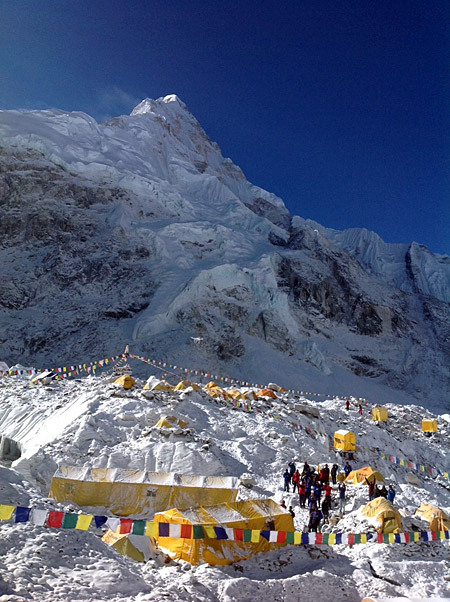 IMG leaders Greg Vernovage reports that the Classic climbers who had reached Camp 3 descended to Base Camp. Up at Camp 2 IMG guide Max Bunce and the third group of Classic climbers took an acclimatization hike today, and for tomorrow their plan is to head for Camp 3. Along the way Max and some of the sherpas will take a look at adjusting the fixed ropes farther to the climber's right, to further mitigate the chance of rockfall. Down at Base Camp everyone is doing well and was reported to all be in the big IMG BC tent this evening watching the movie Anchorman. Today at Base Camp the various expedition leaders had a big rope fixing meeting to discuss the strategies for above the Col. If the winds up high diminish as predicted, the tentative plan is to start on the 9th with 14 fixing sherpas heading to Camp 4. From there, half the group will continue on to fix up to the Balcony that afternoon, while the other half of the team sets up the Camp 4 and starts melting water, etc. They will spend the night at the Col, and then on the 10th, they will head up to fix the upper part of the route to the summit and then return back to Camp 2. 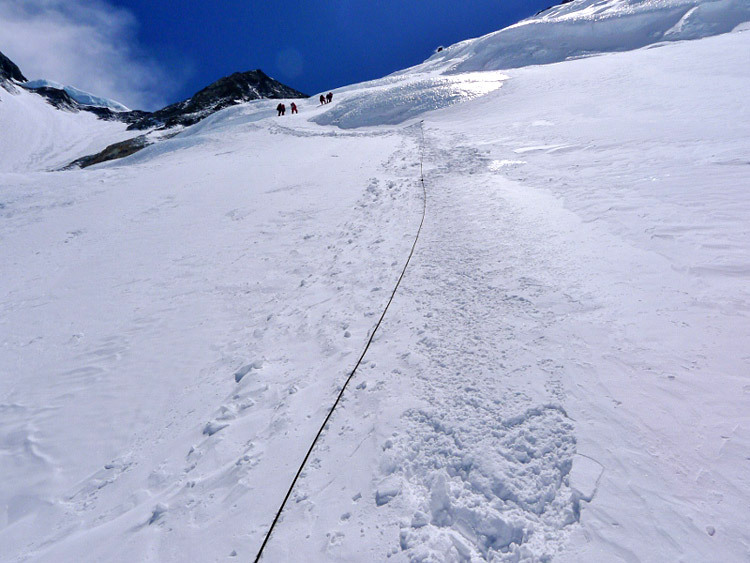 This year we are using 10mm rope all the way to the summit which are stronger but heavier to carry. 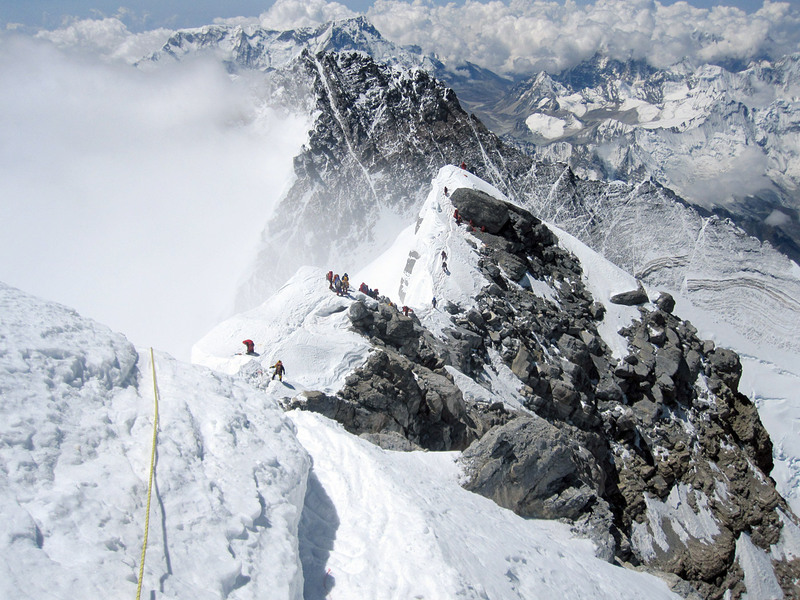 The goal will be to get double ropes on the Hillary Step and summit ridge to avoid the traffic jams that occurred last year. 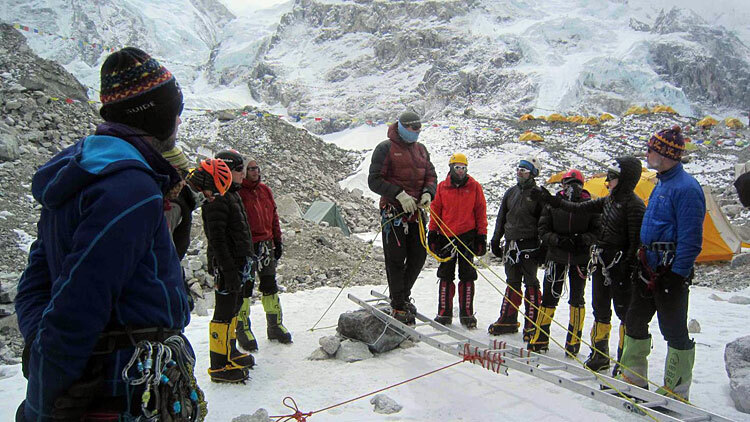 A number of the senior sherpas including Phunuru (IMG), Lhakpa Rita (AAI), Phurba Tashi (Himex), and others are working together to identify the best places for anchoring the additional ropes. 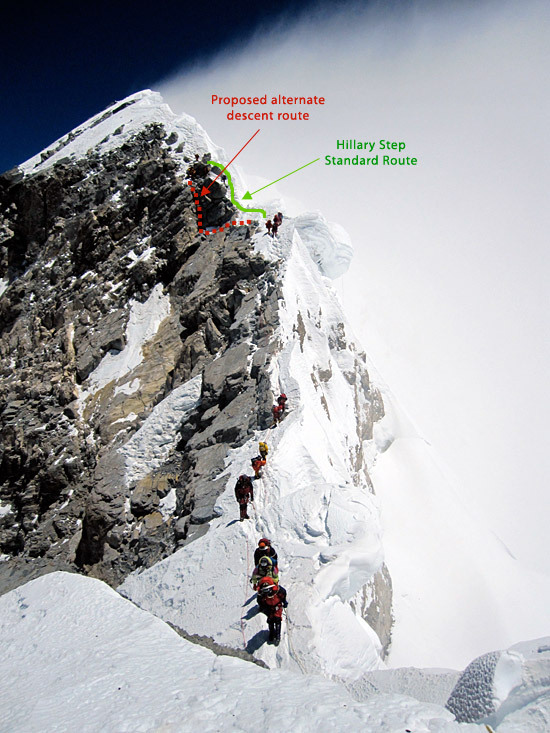 Sounds like they will try to add a descent rope to the climbers' left of the Hillary Step, so descending climbers can rappel down the rock without having to wait for ascending climbers. IMG has lost a member of our Sherpa family today. 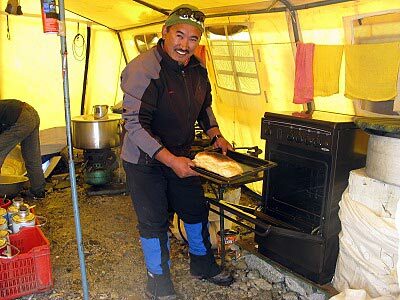 DaRita Sherpa from Phortse reportedly spent the night at Camp 3 without any problems. In the morning he was up, had breakfast, was fully dressed, boots on, preparing to descend back down to Camp 2 when he suddenly felt dizzy. He lay down in the tent and stopped breathing, and despite CPR efforts by his teammates, died. The HRA doctors at Base Camp think that this was probably either a sudden cardiac or cerebral event. His remains were evacuated by sked stretcher by the IMG Sherpa team to Camp 2, from where they were flown by helicopter to Base Camp. At Base Camp his father-in-law Dasona and brother-in-law Mingma Tsering got onboard the helicopter and flew with his remains to Phortse, where the family will do the puja for him. Da Rita was 37 years old and is survived by his wife and two children. He was an Everest summiter and veteran of many expeditions including three with IMG. The whole IMG Team is very sad today after the loss of our good friend and great teammate. 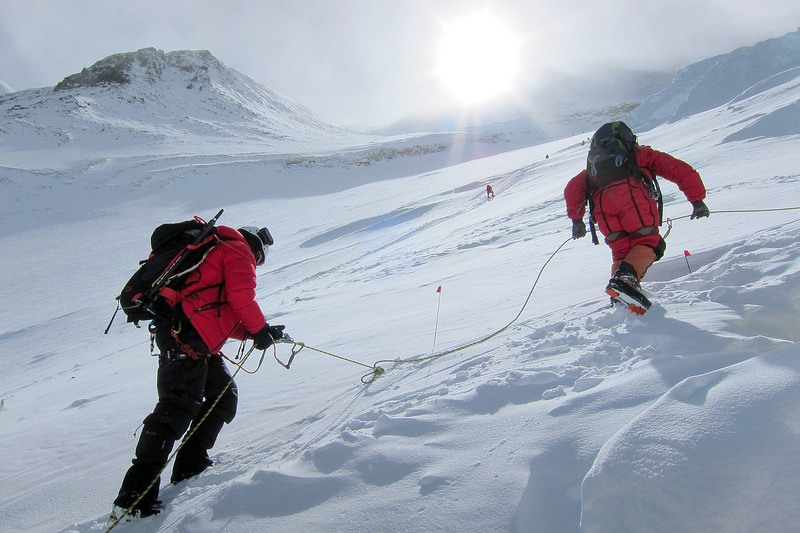 The winds continued blustery today, but not unreasonable, allowing 19 IMG sherpas to again climb to the South Col. Now we have almost enough supplies up there for the summit bids. 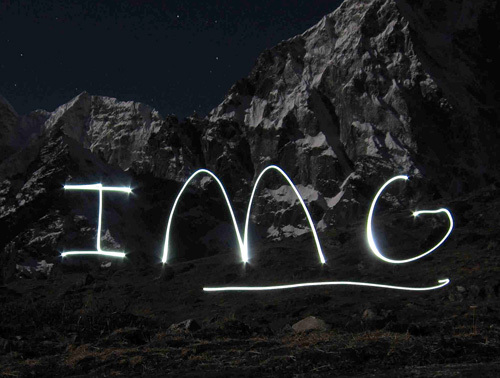 IMG's first team Classic climbers spent the night at Camp 3 and descended safely to Camp 2. 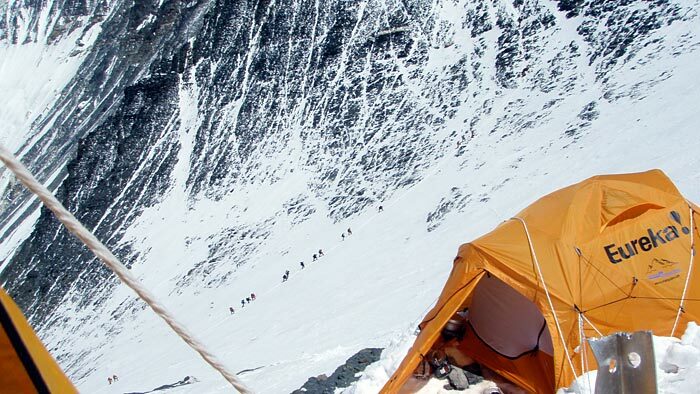 The second group of Classic climbers, including the USAF team, also ascended to Camp 3 for acclimatization, but due to a deteriorating weather forecast for tomorrow, they also descended to Camp 2. 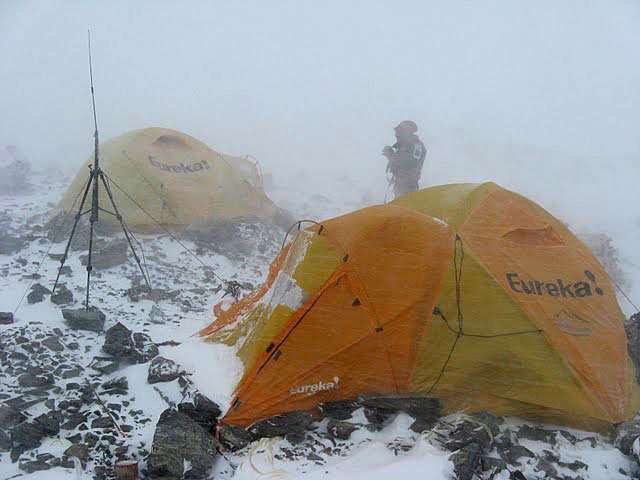 The weather forecast has high winds predicted for the next few days, so the tents at Camp 3 were collapsed by the descending South Col sherpas to prevent that camp from being destroyed. Sounds like we have a couple days of high winds coming up, as the jet stream will be passing over the top of Mt. Everest. 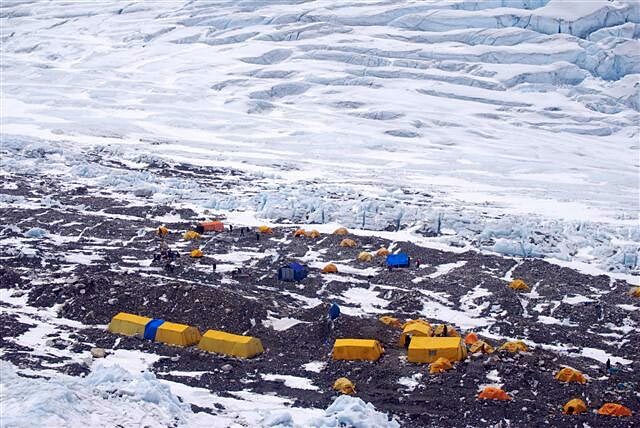 We had 19 IMG sherpas make it to South Col this morning with loads of tents and oxygen to start establishing the Camp 4. They reported that it was windy, but not terribly strong. If the weather is OK tomorrow, they will go up to the Col again. The first group of Classic climbers moved to Camp 3 today for their acclimatization rotation, and the Hybrid team descended to Base Camp. 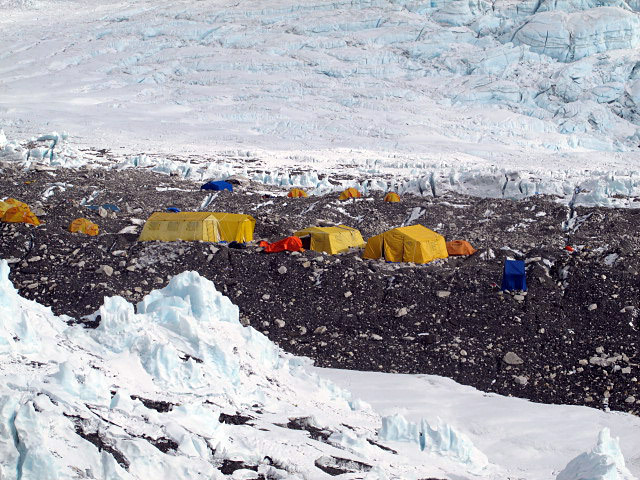 The second group of Classic climbers is taking a rest day today at Camp 2 and the third group of Classic climbers moved up the Icefall (some went to C1 and some to C2). IMG leader Greg Vernovage reports the Hybrid team had a breezy night at Camp 3 and are now back to Camp 2, while the Hamill team are back to Base Camp. Today the Sherpas at Camp 2 decided not to attempt the big carry to the South Col, due to the wind up high, so they are holding at Camp 2. Also at Camp 2 now are both the first and second groups of Classic climbers who did a good job getting up there. For tomorrow, the weather reports suggest that the jet stream may move away a bit with a drop in winds. 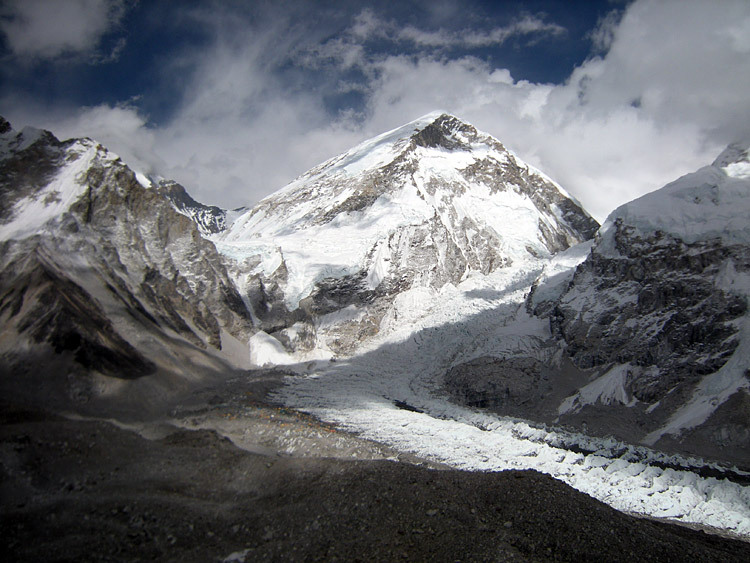 So, if it does improve, the Sherpas will carry to the Col, and the first Classic group will move up to Camp 3 for their acclimatization rotation. 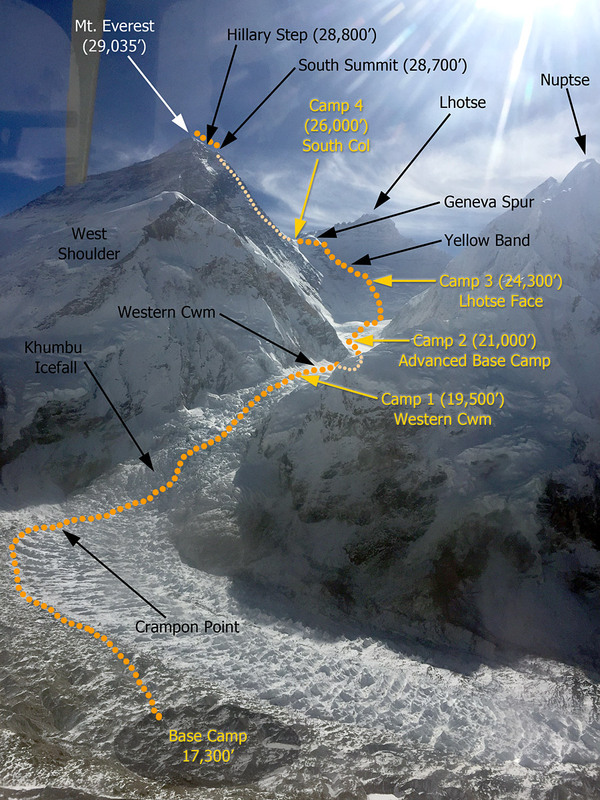 The second Classic group will take a rest day at Camp 2, and the third group of Classic climbers will move up to Camp 2 from Base Camp. So far so good! 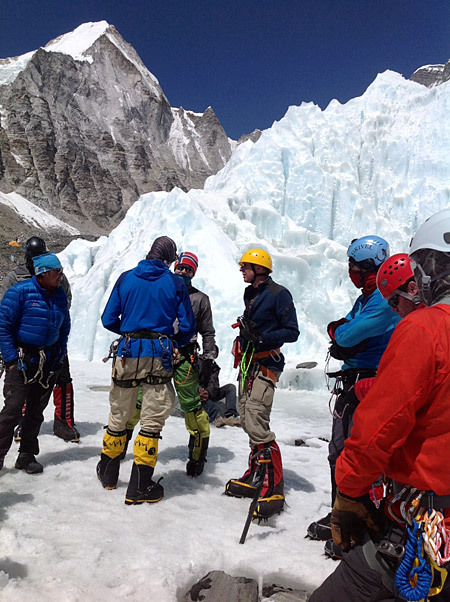 Hamill and his team came back down to Camp 2 today, after spending last night at Camp 3. 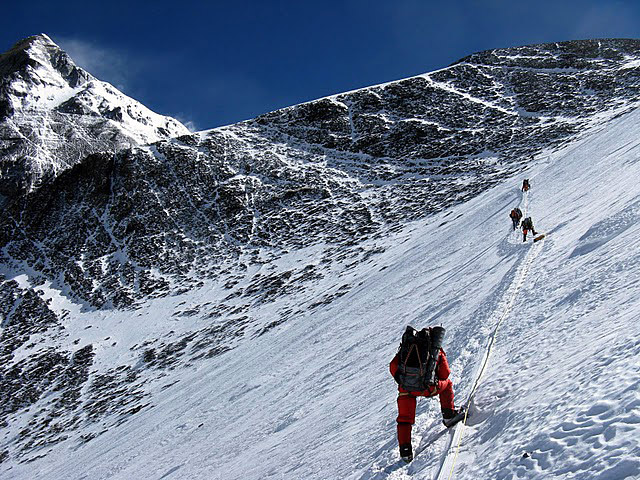 This is generally regarded by most climbers as one of the toughest day/nights of the trip, with a strenuous climb up the fixed ropes followed by the climbers' first night at 24,000 feet without supplemental oxygen. It's all great for acclimatization, but it is a tough couple of days for the climbers. The payoff will come on their next rotation, when they will find that it is a lot easier the second time up there. Now, the Hybrid team is up at Camp 3 and are spending the night. They report that the wind is blustery but not too bad. Also today, the first wave of Classic climbers moved to Camp 2 successfully (most climbers will now start skipping Camp 1, as they are getting stronger and better acclimatized). For tomorrow the Hamill team comes down to BC, and the Hybrid team will come back down to Camp 2, while the second wave of Classic climbers and their sherpas will move up to Camp 2. Also, we have 32 sherpas ready to go at Camp 2 planning to carry to the South Col tomorrow if the weather is OK.
Route to Col is Open! BIG day today. 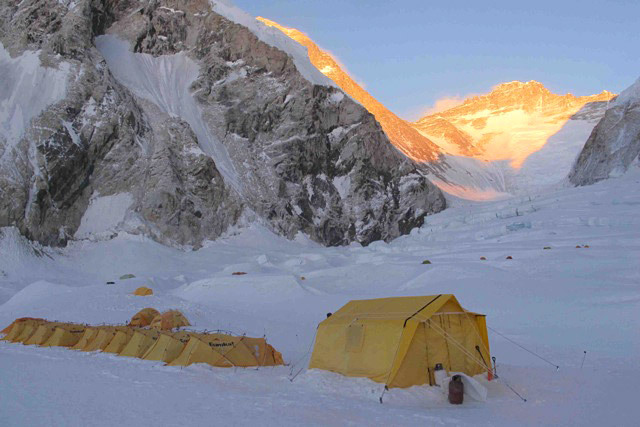 Sherpas put in 17.5 hour day today (Camp 2 to Camp 2) and fixed to the South Col as well as Lhotse Camp 4. Great job by the fixing team (2 from IMG; 3 From Himex; 4 from Seven Summit). The fixing team left Camp 2 at 3:30AM and reached the Col at 3:30PM. 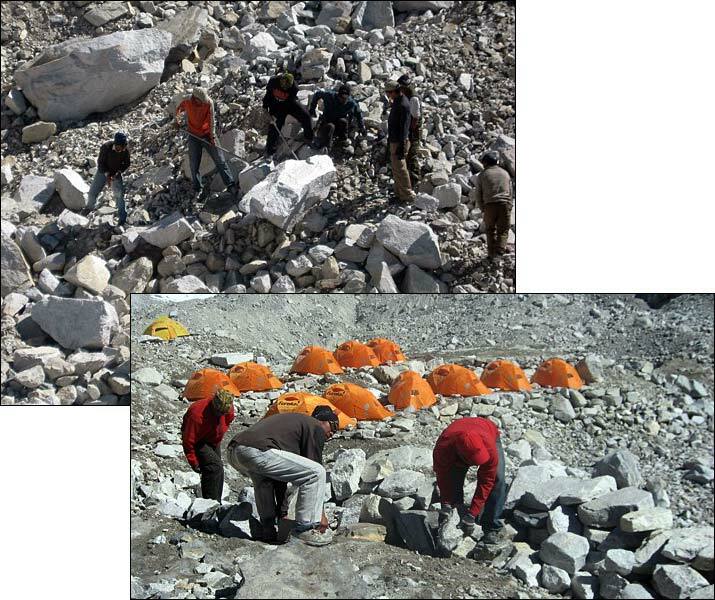 We also had 14 sherpas carry to Camp 3 and set up more tents. 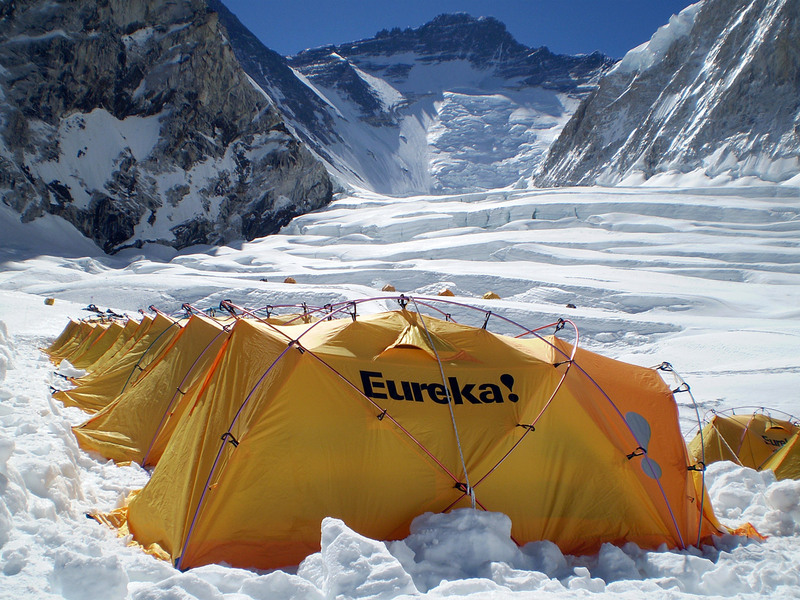 We now have 10 Eureka tents set up at Camp 3, and the camp is well stocked including oxygen bottles. On the way back to Camp 2 the fixing team stopped at Camp 3 and enjoyed some hot drinks with the guided team of Mike, Mike, and Pemba (who are at Camp 3 sleeping tonight). 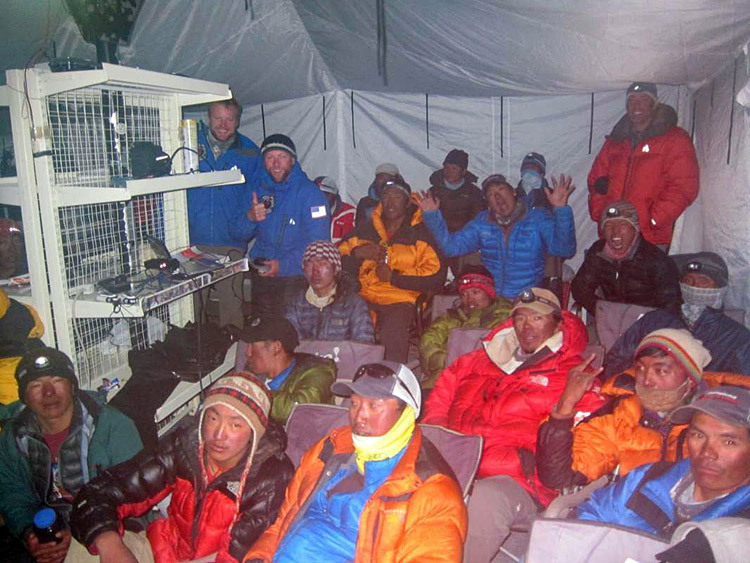 IMG leader Greg Vernovage reports the Classic climbers had a good rest day at Base Camp and enjoyed Movie Night with the Sherpa team in our big Eureka MGPTS tent. Apparently the team watched Zombieland, necessitating teaching the Sherpas what Zombies were. 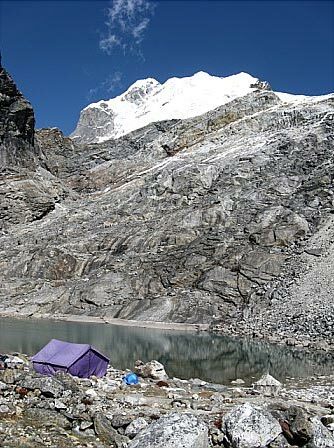 Up on the hill, 14 IMG sherpas made it up to Camp 3 today, chopped platforms, and erected 4 tents. Tomorrow they will go back and chop out 5 more platforms. 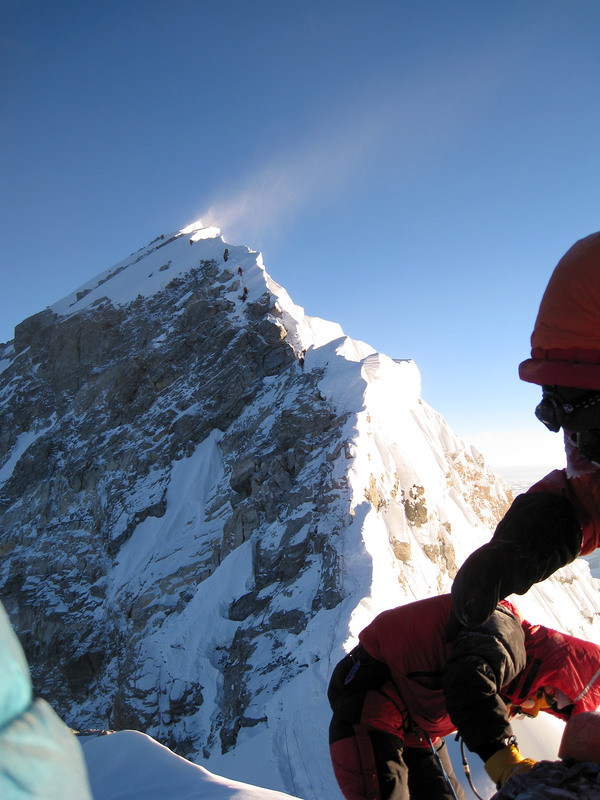 Mike Hamill made it up on to the lower Lhotse Face today and reports that the route looked good. His plan is to move to Camp 3 tomorrow with his guided team. 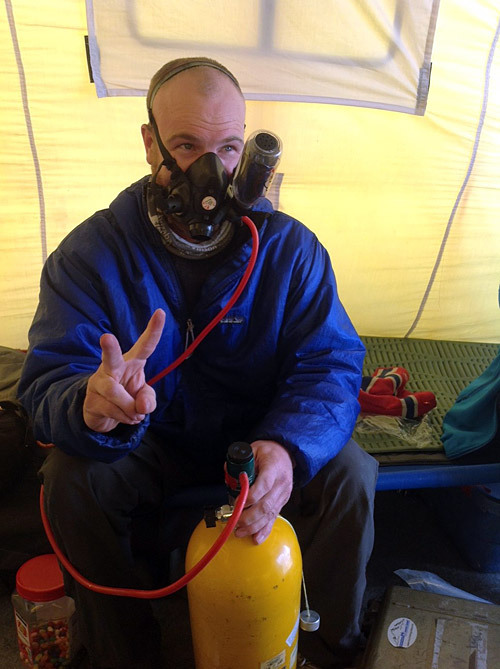 Justin Merle and the Hybrid team are ensconced at Camp 2 now, and are doing well. The Lhotse Face fixing will continue tomorrow with fixing Sherpa team (including 3 from IMG) heading for the South Col and also another sherpa team fixing up to Lhotse Camp 4 (turning right at Lhotse Y). Hopefully the weather will cooperate. Our weather forecaster Michael Fagin at Everest Weather reports that the jet stream is still very near, so there is always the chance of getting blasted, especially as climbers get onto the upper Lhotse Face. Ang Jangbu reports that all the IMG oxygen and supplies for the summit bids have now been carried to Camp 2. Once the route to the South Col is put in, we are in perfect position to start working on the Camp 4 and preparing for going high on Mt. Everest. 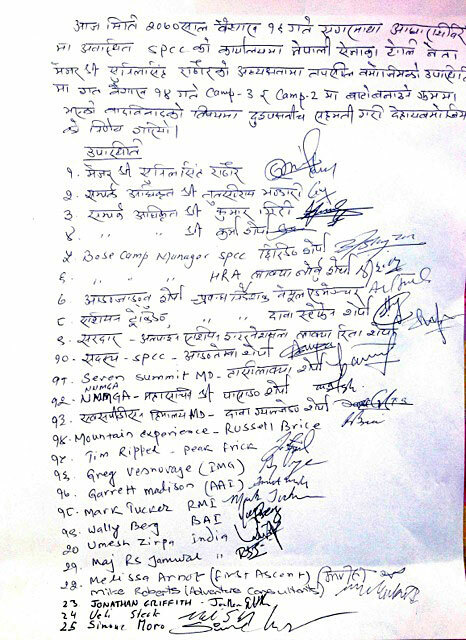 This is the translation of the first paragraph: Today, on 2070 Bhaishak 16 (April 29, 2013) at Everest base camp at SPCC office, with the presence of the Chief of Nepal Army team leader, Major Sunilsingh Rathor and the following attended personnels agreed to do the following decisions regarding the arguments between the two groups on April 27 while fixing ropes between Camp 2 and Camp 3. IMG leader Greg Vernovage reports that Hamill and the guided team moved to Camp 2 today while Justin, Peter and the Hybrid team moved to Camp 1. Everyone is doing well. Down at Base Camp, the Classic climbers had a good rest day today. The route on the Lhotse Face was fixed today 200m beyond Upper Camp 3, and it is looking good. The word from the fixing sherpas is that the final route was put in to the climbers' right of the " direct", staying closer to the seracs. The worries of rocks melting out and falling (as happened in 2012) does not appear to be a big problem this year, as all the rocks are well frozen into the face this year. We have 14 sherpas heading to Camp 3 tomorrow to start putting in that camp. 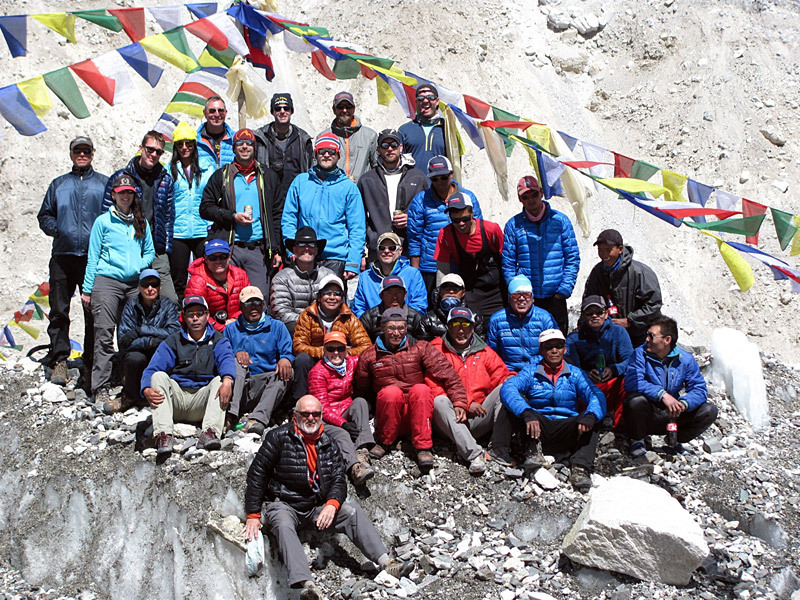 The Classic climbers and their personal sherpas, along with IMG's Greg, Max, and Aaron all descended to Base Camp after their Camp 2 rotation (note: most of the Classic climbers had come in with the 2nd and 3rd teams from Kathmandu). 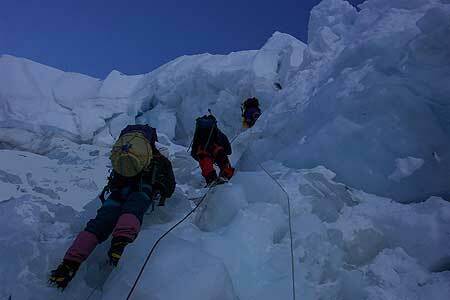 Meanwhile, Mike Hamill and his guided team climbed to Camp 1 today. 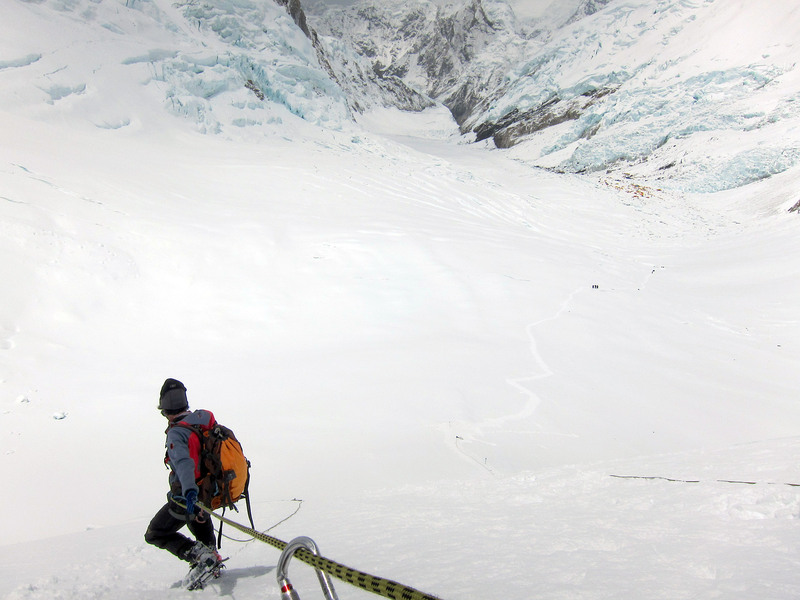 Early tomorrow morning Justin, Peter and the Hybrid team will head up the Icefall to Camp 1. So, the second acclimatization rotations have begun. 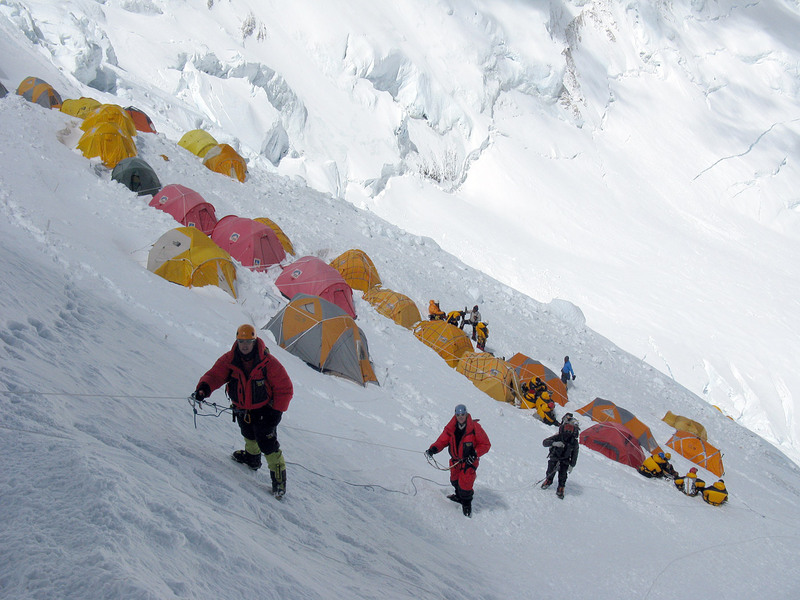 The climbers' goal for their second rotation is to spend a few more nights at Camp 2, and also a night at Camp 3 without oxygen. Also, do a good job getting up and down to Camp 3 in reasonable time. This will be a hard rotation for the team, but it really helps a lot for the acclimatization process and getting ready for the summit bids. We are monitoring the weather closely. Right now there is no more snowfall forecasted for the next few days, but the jet stream remains very close, and there is a chance for higher wind speeds. 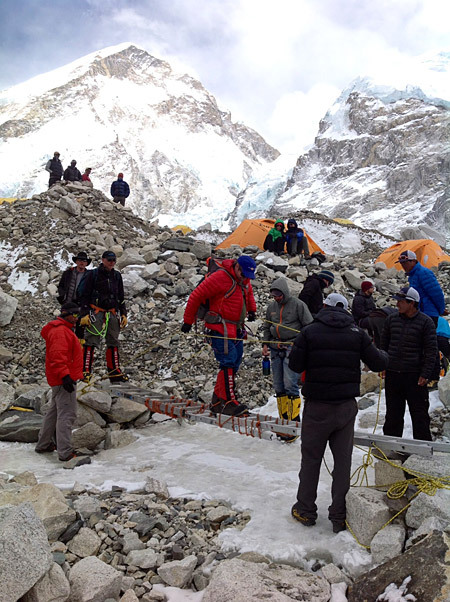 IMG Leader Justin Merle reports from Base Camp that the rope-fixing team managed to get two ropes up to Lower Camp 3 today via the direct route. 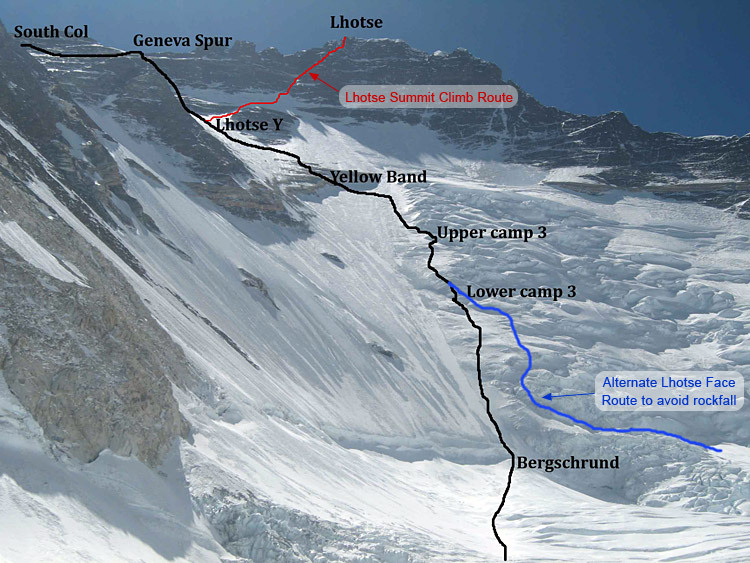 They will take a rest day tomorrow, then go back up the next day to finish fixing into Upper Camp 3. Up at Camp 2 the Classic climbers had a good acclimatization day today, and a number of them went for a hike up to the base of the Lhotse Face. Their plan is to come down to Base Camp tomorrow. 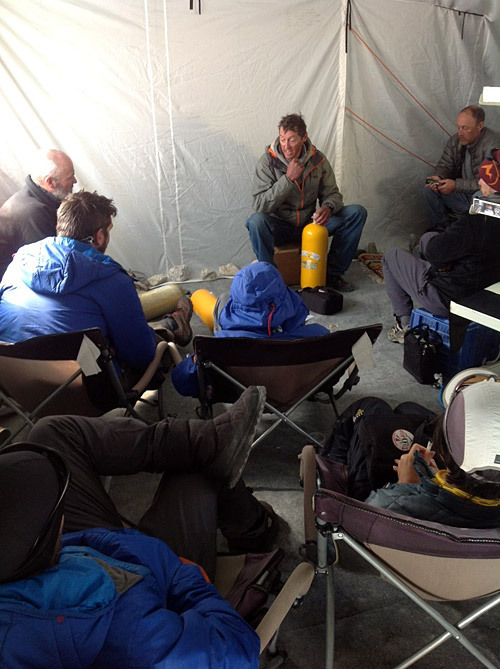 Down at Base Camp, Mike Hamill and the guided team are planning an early morning departure to go up to Camp 1 tomorrow, with the Hybrid team taking one more rest day and heading back to Camp 1 the following day. Ang Jangbu says he is sending 15 sherpas up to Camp 2 tomorrow to get in position to start building IMG's Camp 3 as soon as the ropes are finished. The IMG Classic climbers made the move from Camp 1 to Camp 2 in good time and they are all doing well. 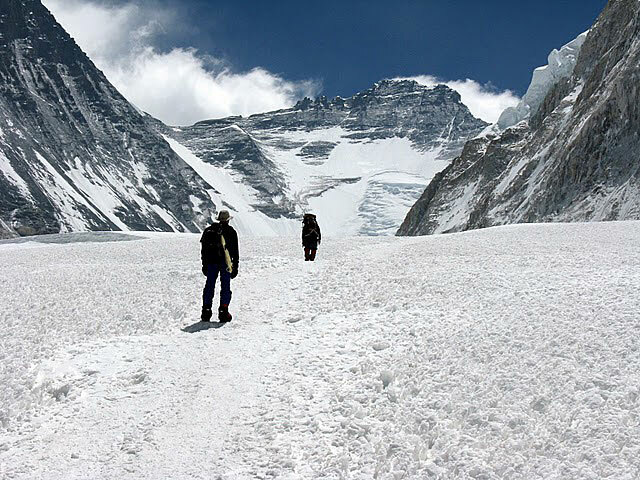 They will now take a couple days up there for acclimatization and may hike up to the base of the Lhotse Face to stretch their legs. Well done, team! 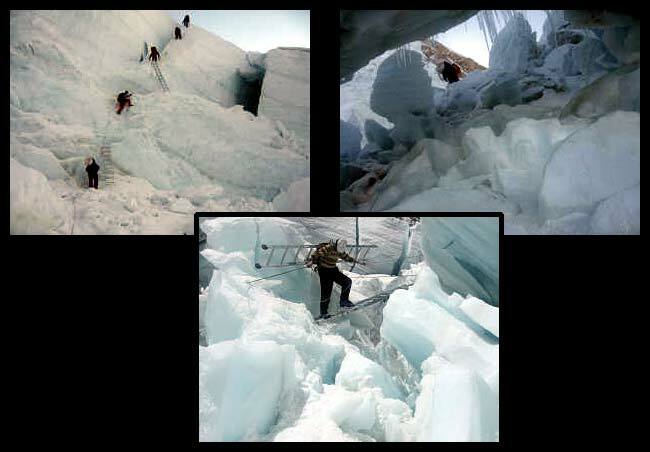 Ang Jangbu reports "the fixing crew explored the original 1953 route on Lhotse Face, which is further to the climbers' right and meanders through the ramps and seracs on the lower part of the face (this was the route used in 2012). However, they ran into a lot of small crevasses on the lower part and a large crevasse near lower Camp 3 that are problematic. So, the fixing crew decided that it would be better to revert to the direct route, which climbs straight to Camp 3, to the left of the seracs. They returned to Camp 2 and will head back up tomorrow to get the direct route fixed to Camp 3. Phunuru walked around the different camps at Camp 2 this evening and we have commitments from these teams for the fixing tomorrow: Himex: 4 Sherpas; Astrek: 2 Sherpas; AAI: 2 Sherpas; AC: 2 Sherpas; JG: 2 Sherpas; Miura: 2 Sherpas; IMG: 4 Sherpas for a total of 16 Sherpas. 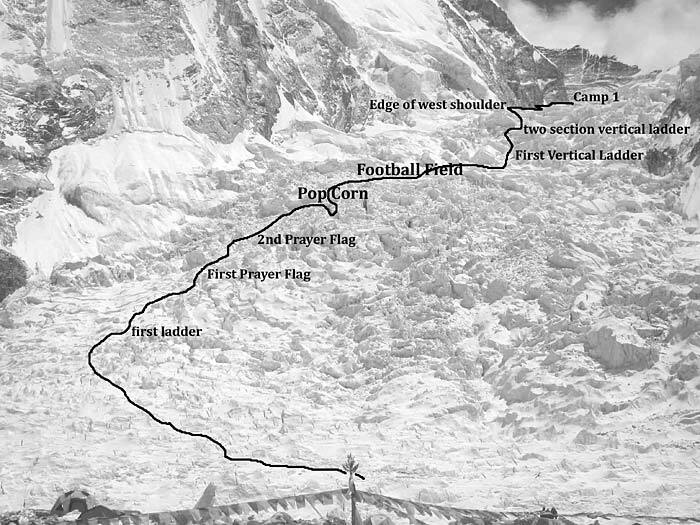 They are planning to leave Camp 2 at 6:30 AM, split into 2 teams, and try to fix two lines all the way to Camp 3. We will see how it goes and keep you posted. All our Sherpas carried to Camp 2 today and are taking a rest day tomorrow. 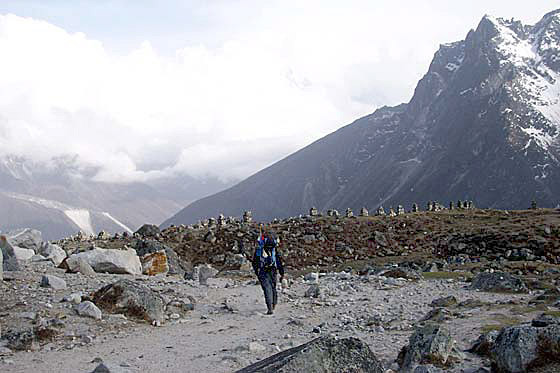 Then, half of the team will move to Camp 2 the day after to stay, and the second half will carry more supplies to Camp 2." Up at Camp 2, Greg and Phunuru coordinated a meeting at our camp among the various teams that are helping do the fixing. For tomorrow we have 15 climbers heading up to start working on the Lhotse Face: IMG: Chewang Lendu + Nima Karma; AAI: Fura Kancha + Karma Serki; AC: Sange Dorje + Kami Rita; HIMEX: Ang Rita + Nima Tenzing; ASTREK: Shera Gyalzen + Pemba Tshiri; SEVEN SUMMIT: Lhakpa Nuru + Lhakpa Sherpa; JG: Pema Tshering; MIURA: Nima Nuru; PBE: Damian Benegas. 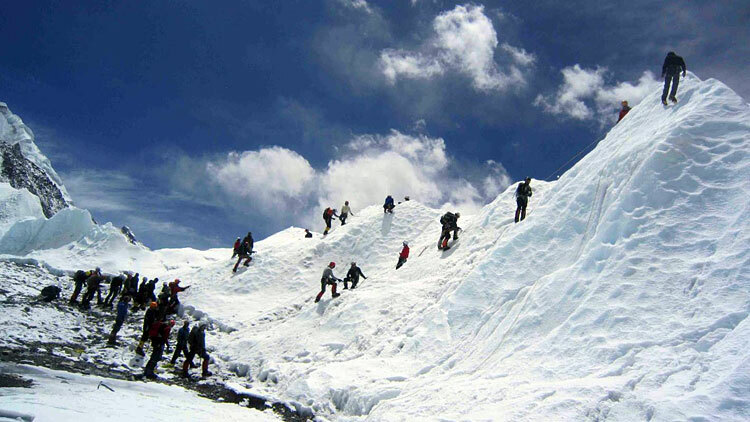 The plan for tomorrow is for all our sherpas to carry to Camp 2 and come back to Base Camp. Once the fixing team manages to fix all the way to Camp 3, we will send maybe half of the Sherpa team to sleep at Camp 2, so they can start working on Camp 3. Today was very nice in the morning with a little afternoon snow and clouds (normal!) this afternoon. It is now clearing up again and the moon is out, so looking good for tomorrow. Greg, Aaron, Max, and the Classic climbers did well on their first trip up the Icefall yesterday with the first of the climbers making it to Camp 1 in just 4 hours! 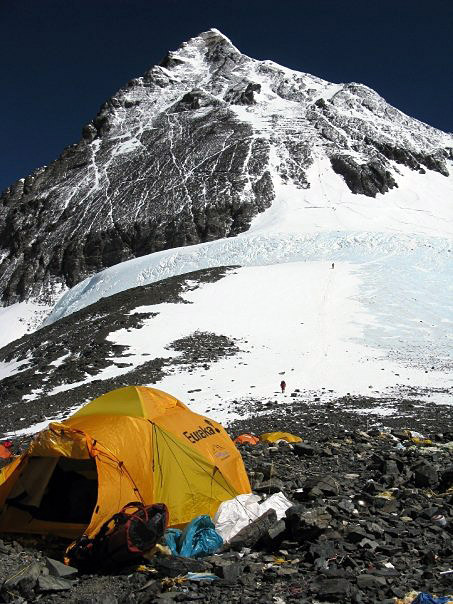 Greg and Phunuru will continue up to Camp 2 tomorrow while the Classic climbers take an acclimatization hike in the Western Cwm, and then spend a second night at Camp 1 before moving to Camp 2 the following day. Tomorrow we have 11 sherpas carrying to Camp 2 with the other sherpas taking a rest day at BC. 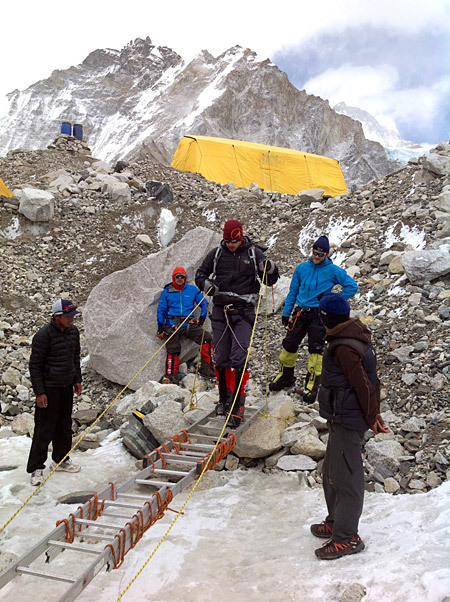 The various teams on the mountain have been working to haul the fixed rope and hardware to Camp 2 for the Lhotse Face fixing. The plan is for the fixing crew to all meet up at Camp 2 on April 26. 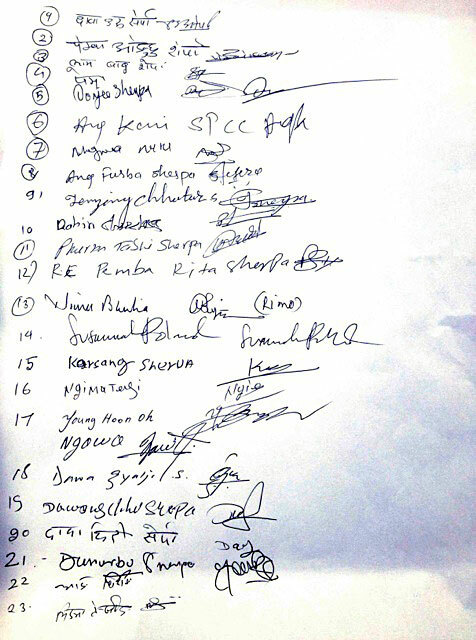 Sherpas participating are: 2 HIMEX, 2 AAI, 2 AC, 1 JG, 2 IMG plus Phunuru. I think I will send some of the regular Sherpas to Camp 2 to stay on the 26th to start carrying to Camp 3 from the 27th or 28th. IMG leaders Merle, Hamill, and Anderson report that the guided and hybrid climbers made it back down to Base Camp from Camp 2, and that everyone is doing well. During the day the weather improved, and a number of teams managed to get out on the route and get the trail packed back in, so everything is looking good. Early tomorrow we have a big IMG wave heading up, with IMG leaders Vernovage, Mainer, Bunce, all the Classic Everest climbers (including the USAF team), the Lhotse climbers, and all their Sherpa guides, too. IMG leader Greg Vernovage reports that there was more intermittent snowfall today. 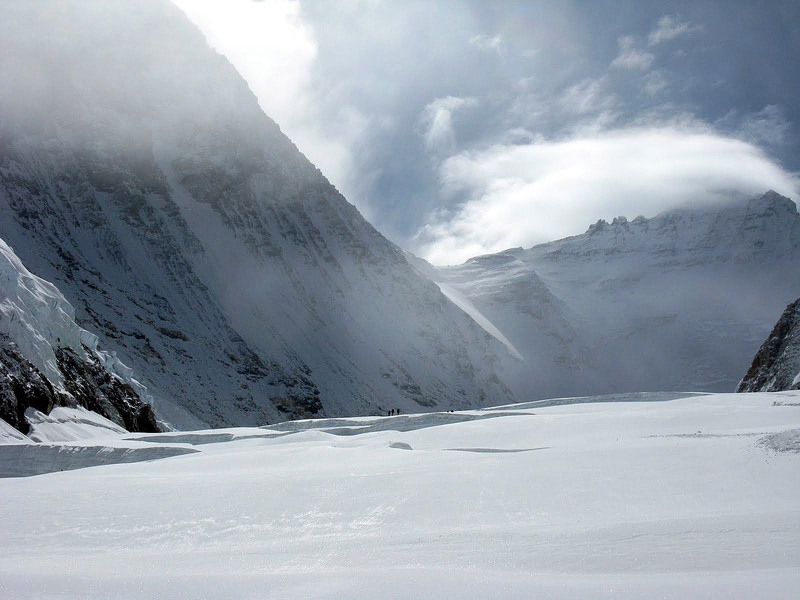 The first group of Classic climbers went partway up the Icefall but decided that with the fresh snow it was too slow and sloppy for their liking, so they put it in reverse and went back down to Base Camp to wait for better conditions. There was less snowfall higher up, and the guided and hybrid groups are all up at Camp 2 and doing well. Satellite imagery still show some clouds moving into the region but our weather forecasters predict that snowfall rates should become less intense during the next 24 hours. Greg Vernovage reports that the snow continued on and off today, prompting the decision for the whole team to stand down and take a rest day today. It tapered off later in the day, allowing some climbers and sherpas from other teams to move this afternoon between the camps, so the trail has now been broken out and is ready to go for tomorrow morning. The Hamill team remains up at Camp 2 and Hybrid team remains at Camp 1. For tomorrow Aaron Mainer and the first group of Classic climbers will head up to Camp 1 while the second group of Classis climbers will head partway up the Icefall for their shakedown. Greg and Jangbu report that it was a relatively quiet day today. The Sherpas took a rest day, and it snowed all day today. Higher up, the Hamill team at Camp 2 and Hybrid team at Camp 1 both report about 6 inches of accumulation. The Classic climbers finished their preparations and are ready to head up to Camp 1 early in the morning tomorrow but may decide to stay put at BC if the snow continues. IMG leader Greg Vernovage reports that the Team 3 climbers are back to Base Camp after their successful climb of Lobuche Peak. 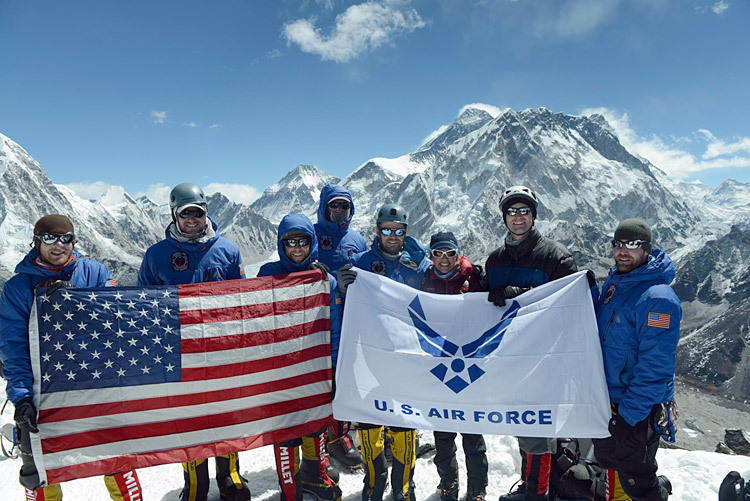 Congrats to the climbers and the members of the USAF 7 Summits Team! 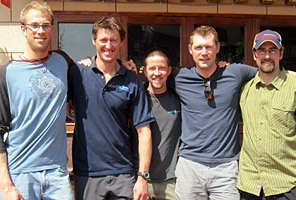 Now all the Classic and Lhotse climbers (from teams 2 and 3) are together. 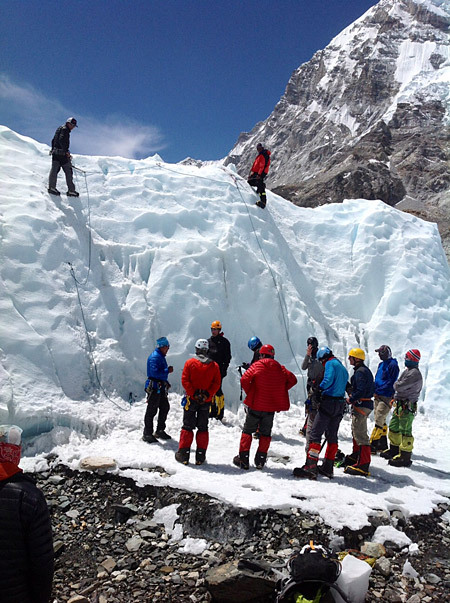 The Team 2 climbers are wrapping up their training and preparations at BC with their sherpas and are getting ready for their Icefall foray. IMG guides Justin Merle and Peter Anderson report that the Hybrid team had a good trip up to Camp 1 today. They will take an acclimatization day tomorrow, then go to Camp 2 the following day. Mike Hamill and his team took an acclimatization hike today in the Cwm. They are also at Camp 1 tonight and planning to go to C2 tomorrow. We had a handful of sherpas carry loads today, but for the majority of them it was a rest day. 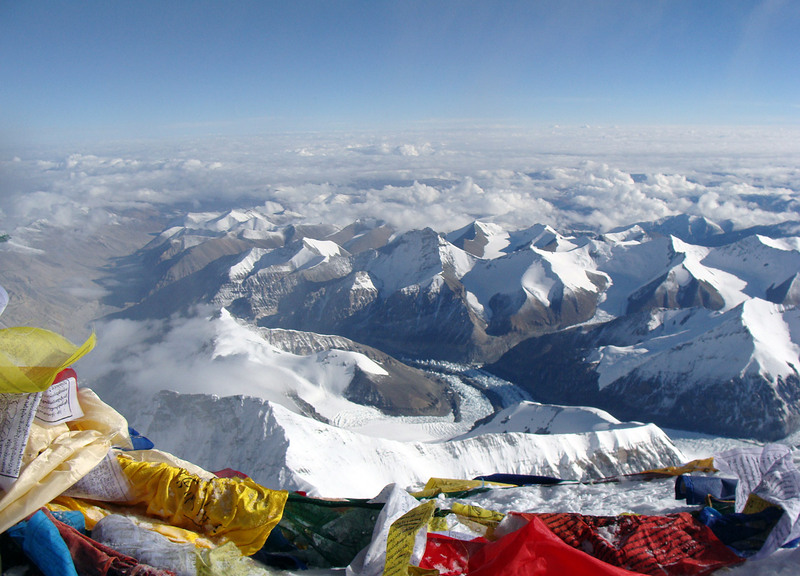 The weather remains cold, with the jet stream just to the south of Everest. IMG guide Max Bunce reports that Team 3 had a good climb of Lobuche Peak today, with everyone reaching the summit. Congrats! They plan to head back up to Everest BC tomorrow, while guide Jenni Fogle and the Lobuche climbers will head out to Lukla. Up on Everest, Greg reports that today we had 32 Sherpas reach Camp 2 with loads, and Mike Hamill and his team reached Camp 1. Tomorrow we have Justin, Peter, and the Hybrid climbers heading to Camp 1 and another 32 Sherpas heading back up to Camp 2 with more supplies. 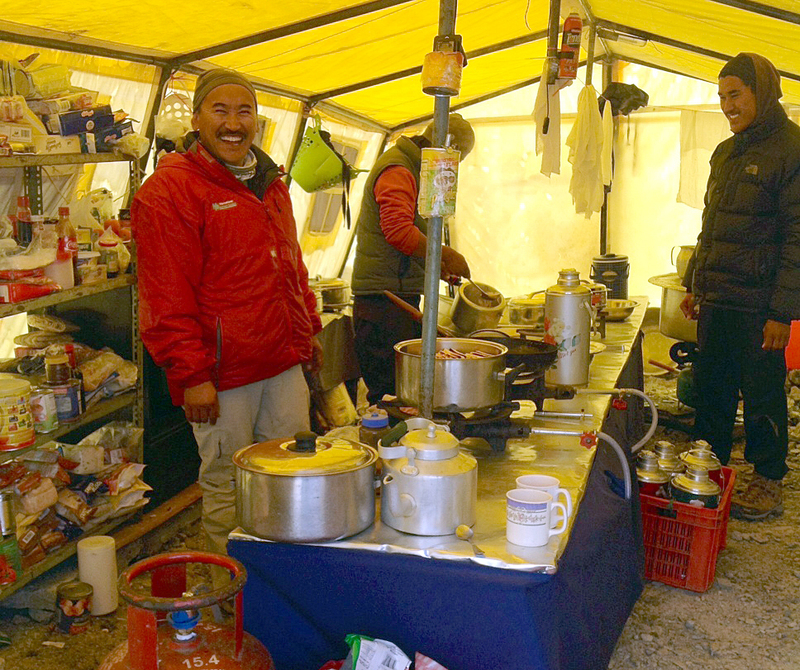 Today at Base Camp Ang Jangbu and Greg had a big meeting in the IMG Sherpa dining tent with the various climbing teams that will work to do the fixing on Lhotse Face and above. 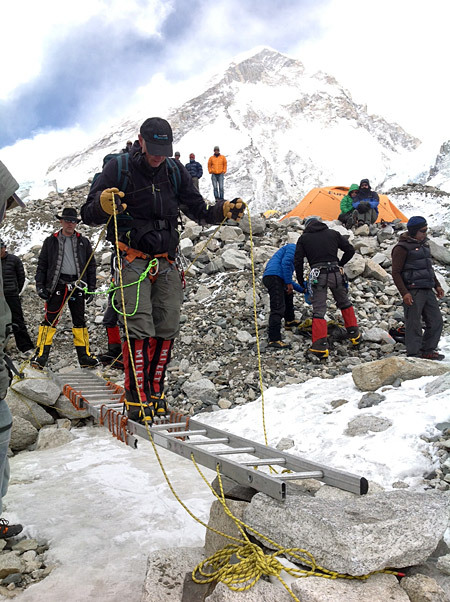 The first task is to move the 9200m of fixed rope and hardware up to Camp 2, and a number of teams are pitching in to haul these supplies up there. Thanks to all the teams that are helping out! 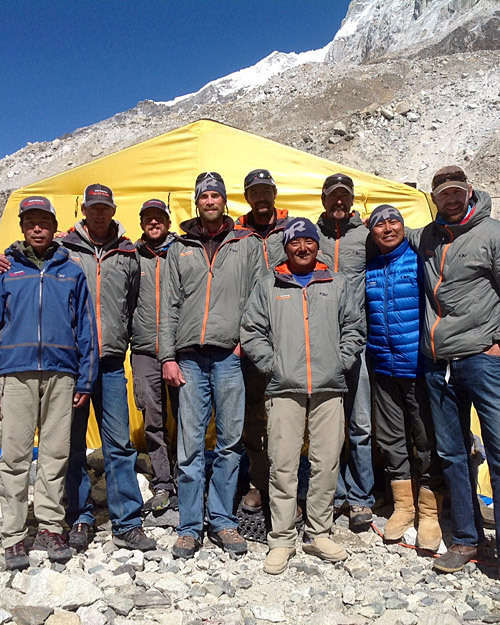 Phunuru Sherpa descended today with his sherpa team, having finished putting up the tents at Camps 1 and 2. 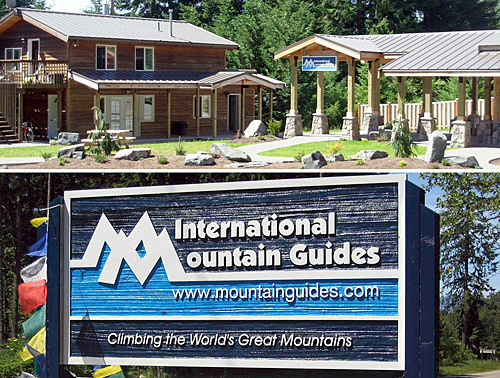 Now these camps are ready for the IMG climbers to occupy, and Mike Hamill and the Guided team will head for Camp 1 tomorrow. Justin, Peter and the Hybrid team took a practice run up into the Icefall today and are planning to go to Camp 1 day after tomorrow. 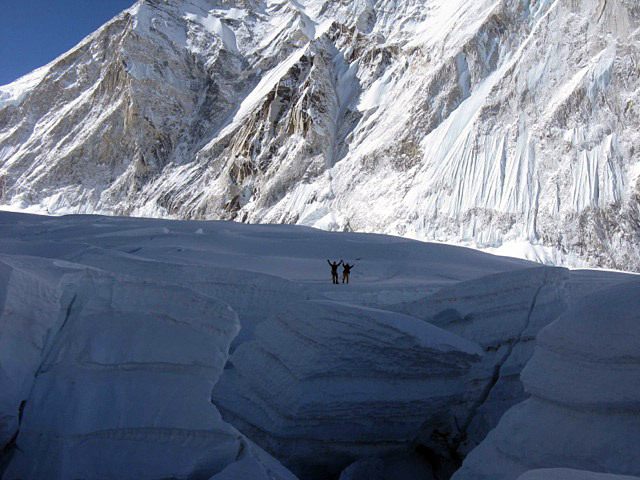 The Classic climbers on Team 2 are back to EBC now and will go into the Icefall tomorrow for their practice run. Also tomorrow we have 32 Sherpas heading up to Camps 1 and 2 to continue the stocking of those camps. Down on Lobuche Peak, Team 3 moved to high camp today and are positioned for their summit bid tomorrow. At EBC there is a meeting scheduled tomorrow with the various teams that will work together on the rope fixing on Lhotse Face and higher. In preparation, the IMG crew has been working to prepare the rope and rope-fixing equipment. To keep the 9+ kilometers of rope from getting miserably kinked during deployment, an axle is placed through the rope spools so they can turn, allowing the rope to be pulled off the spool and stacked directly into rice bags. 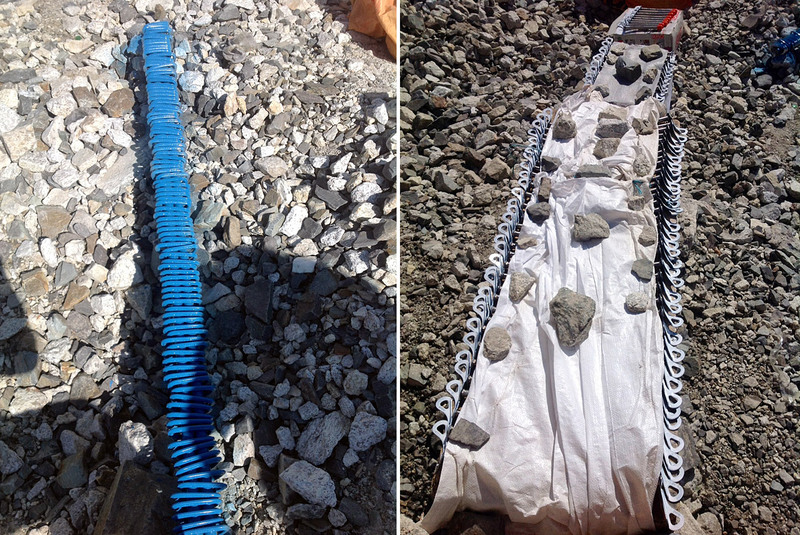 The team has also painted 100 ice screws and 100 locking carabiners to identify them. When it comes time to fix the Lhotse Face, the rope will pull out of the rice bags with no twisting, and the screws and 'biners will be used for anchors. 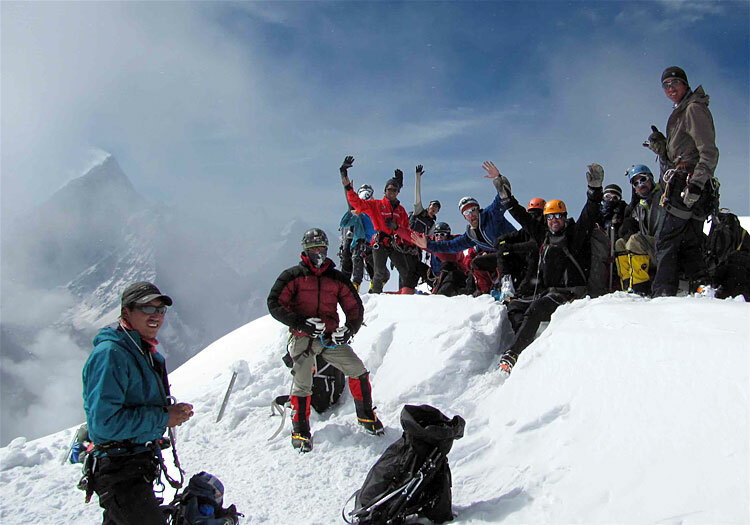 IMG guide Aaron Mainer reports from Lobuche Peak that Team 2 put 100% on the summit. Congrats! Some of the team will come back to EBC tomorrow, while others will take a rest day at Lobuche BC. Max and Team 3 did training today at EBC and are moving down to Lobuche BC tomorrow. 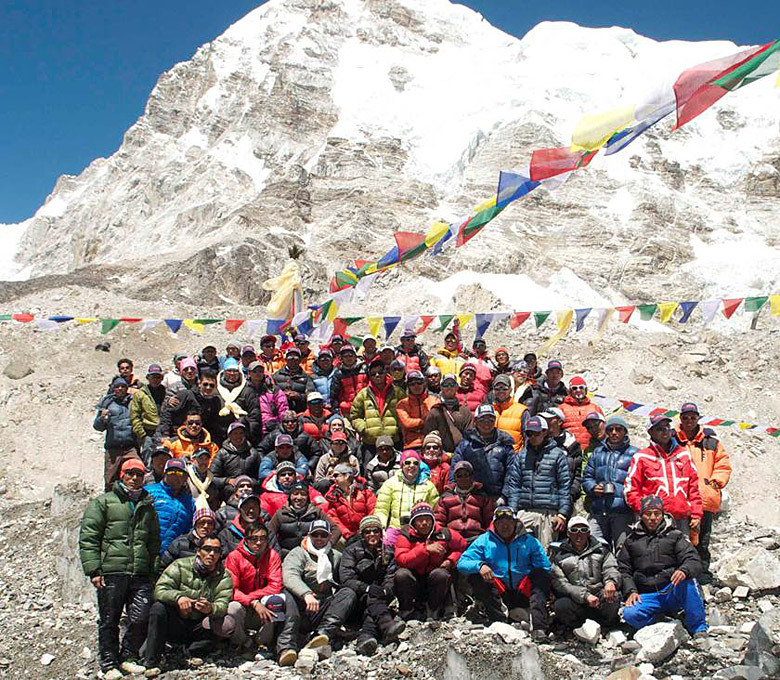 The IMG sherpas did another big push today to Camp 2, carrying 29 more loads up there. Also today, we sent Camp 2 cooks Pema, Tashi, and Thile Bhote, along with Phunuru and 11 sherpas to Camp 2 to start setting up four big kitchen and dining tents and many smaller sleeping tents. Their plan is to work on Camp 2 for a couple days, then drop down and set up Camp 1 tents in preparation for our members. The guided and hybrid climbers (Team 1) are all back to EBC now from Lobuche, and will be leaving early morning tomorrow for an Icefall shakedown. 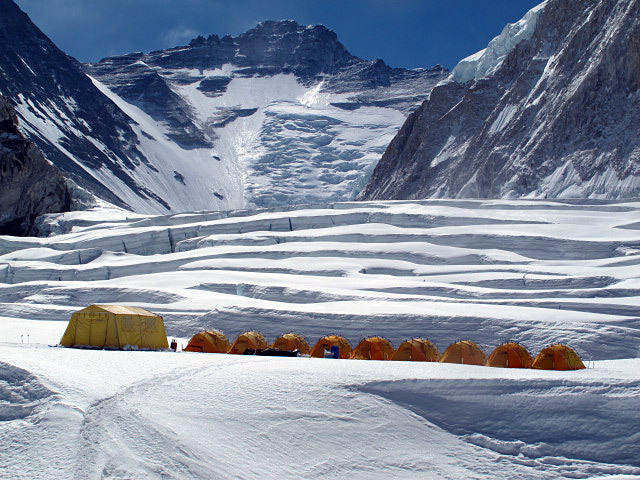 Their plan is to go partway to Camp 1 and practice with the ladders, and then come back to Base Camp for a couple more days of acclimatizing. 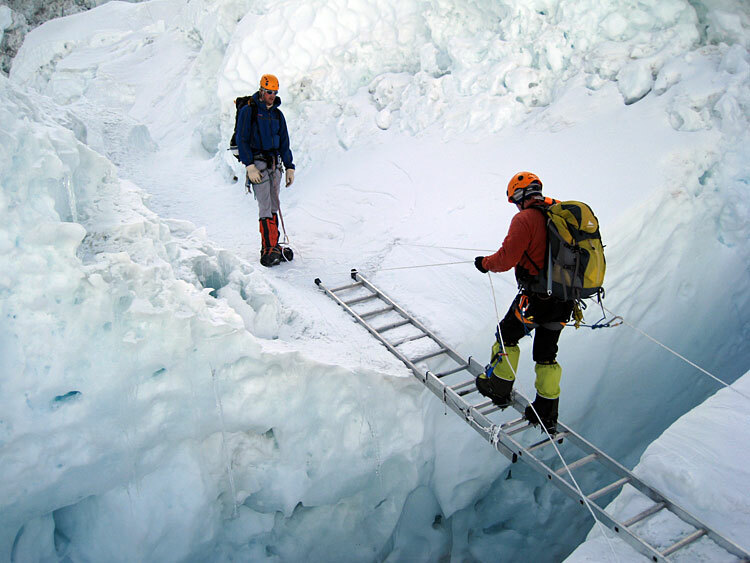 All this is so that when they eventually head up the Icefall "for real" they will be as well prepared and acclimatized as possible. IMG guides Max Bunce, Jenni Fogle, and their team of Classic, Lhotse and Lobuche climbers and trekkers arrived today at EBC. Congrats! They'll take it easy tomorrow and go through their gear review. 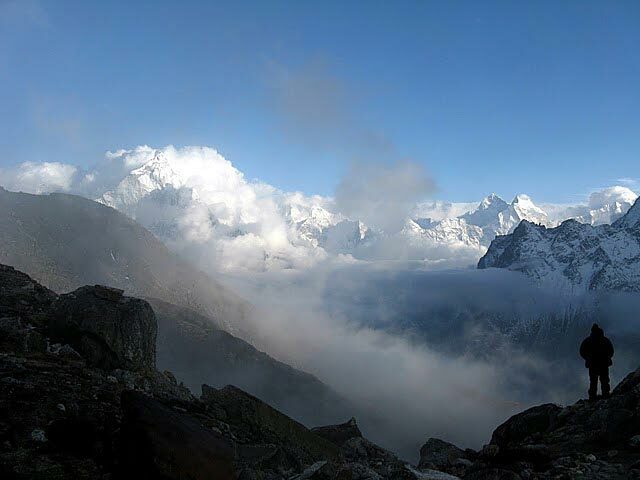 Down on Lobuche Peak, Team 2 is moving to High Camp and the Team 1 climbers will be moving back to EBC. We had 47 Sherpas make another big carry to Camp 2 today, and most of them will take a rest day tomorrow. 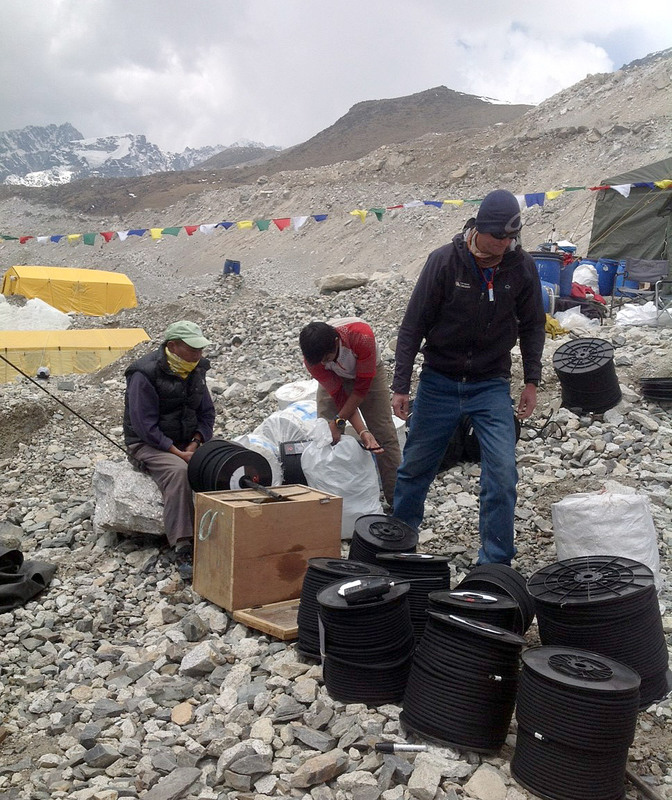 Today Greg, Jangbu, and the sherpas unpacked the 9200 meters of 10mm fixed rope that will be placed up high in the coming weeks. So, everything is rolling on schedule. 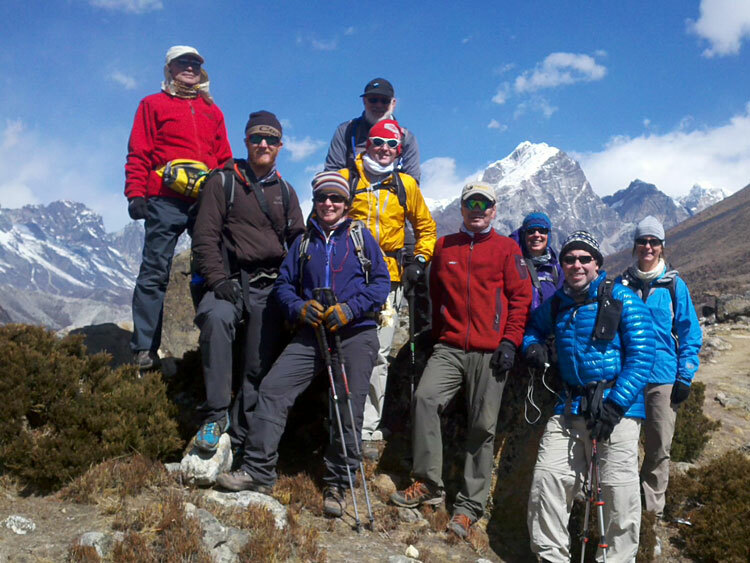 Base Camp Training with the Sherpa Team; Lobuche Peak Summits! 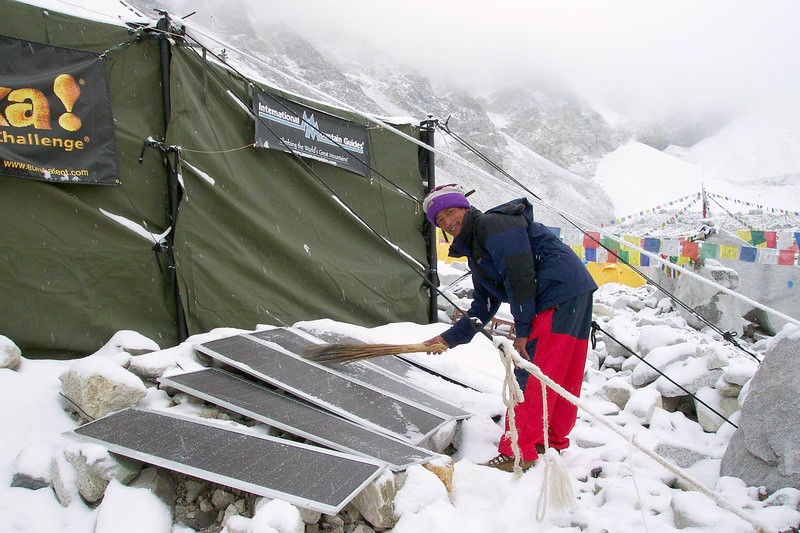 The IMG sherpas have been working closely with the Classic climbers at Base Camp to make sure everyone is on the same page with their gear and techniques. 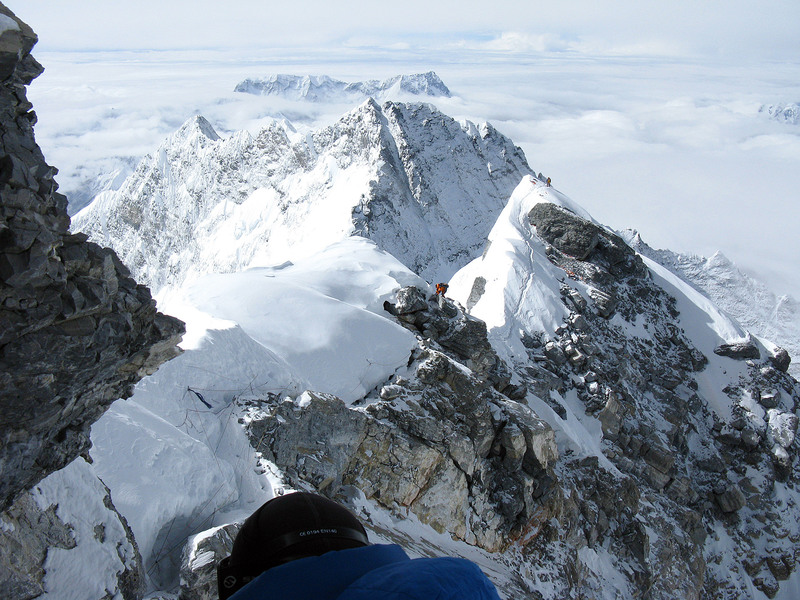 Then, it is down to Lobuche Peak to give it all a double check before hitting the Khumbu Icefall for the first time. Most of our sherpas are now graduates of the Khumbu Climbing School, and some of them, like Phunuru, have trained and worked with US National Park Service ranger teams on Denali and Mt. Rainier. The group here all have a minimum of three years with IMG and work as hard as any group that I have had the pleasure to be involved with. Ang Jangbu and I are very proud of them. 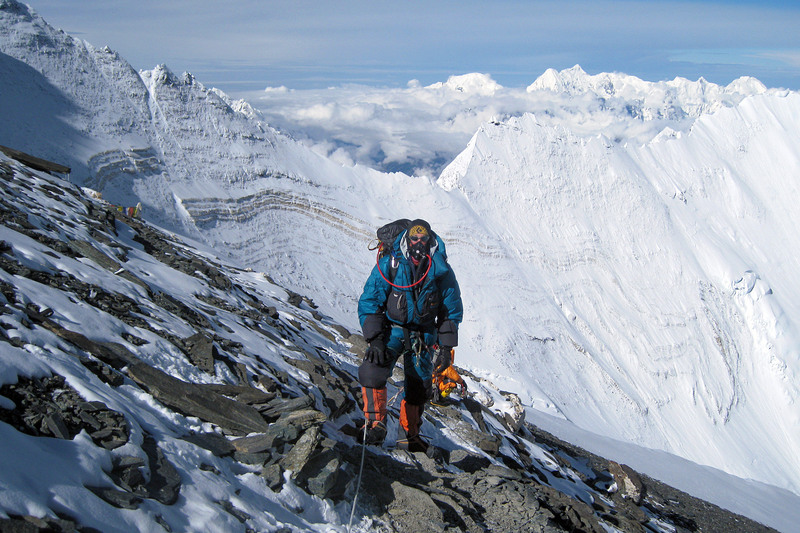 Down on Lobuche Peak, Mike and Justin report 100% success for the guided and hybrid climbers (Team 1). Sounds like they had a great day of climbing. 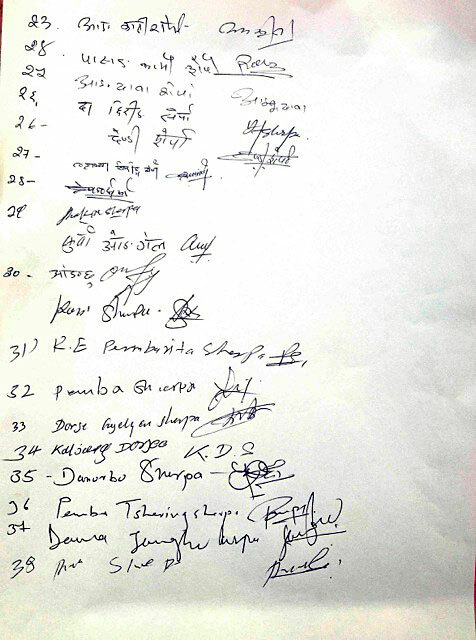 They will take a rest day at Lobuche BC before coming back up to Everest BC the following day. Classic climbers and trekkers (Team 2) are heading down to Lobuche BC tomorrow, while Max, Jenni, and Team 3 will be arriving in Everest BC. Up on the hill today we had 47 sherpas make it up to Camp 2 and back to BC with loads. They report the route in the Western Cwm was good climbing conditions but that it was very cold up there. They wanded the route well with flagged bamboo garden stakes and report not too much fresh snow on the trail (the wind scoured a lot of it away). We have another 47 sherpas heading back to Camp 2 tomorrow. IMG leader Greg Vernovage reports that it was snowing and blowing at Base Camp last night (in his words, "just like in Alaska") prompting a decision at 9pm to postpone the big Sherpa carry today to Camps 1 and 2 (the sherpas normally leave BC very early, before dawn). It was a good decision, as it sounds like some sherpa from other teams tried to go to Camp 2 today but turned back at Camp 1 due to the stormy conditions in the Western Cwm. During the day, today, the weather improved and the winds died down, and now (evening time) everything has calmed. The team are ready to head back up to Camp 2 in the early morning tomorrow with a lot of bamboo wands to mark the trail with all the fresh snow. Down at Lobuche Peak Justin Merle reports that the guided and hybrid climbers were able to move up to high camp and are all set for their own early morning pre-dawn departure tomorrow for the 20,000 foot summit of Lobuche (actually they go to the false summit, as the real summit is very difficult to reach). 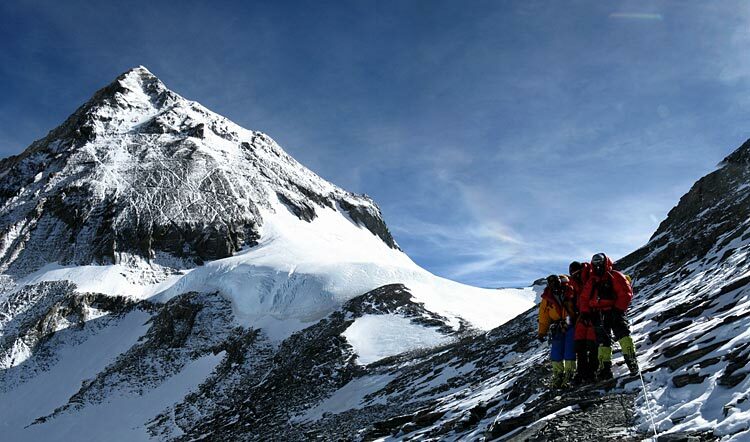 At Base Camp, the Classic team had a good day of organization and training today, and tomorrow they will head a short way up in the Icefall for some practice crossing ladders. 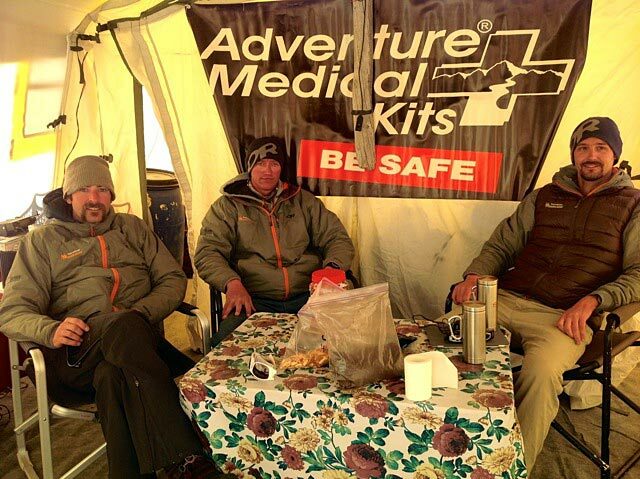 Greg Vernovage reports that the classic climbers and trekkers (Team 2) arrived to Everest Base Camp today. The weather continues to be cold and windy at EBC, with some fresh snowfall. The jet stream is currently parked over Everest with 100mph wind at the summit, but the forecast has it improving by the weekend. Tomorrow we have 2 sherpas heading up to C1 and 45 sherpas heading to C2 to continue stocking those camps. 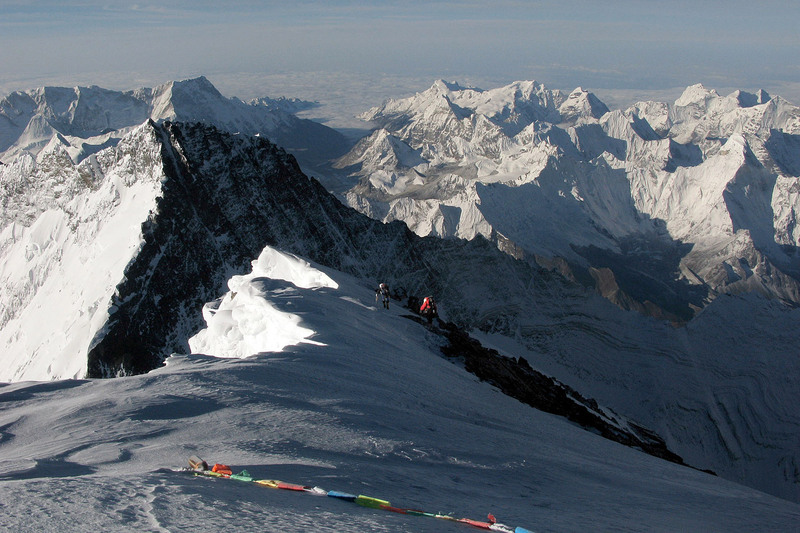 Down on Lobuche Peak, Justin Merle reports that the first team is preparing to move to high camp tomorrow. The third team is now ensconced at Lobuche BC for a couple days of acclimatization. So far so good! I pulled into camp yesterday in time for the Team 1 puja, and Jangbu and I spent the rest of the day getting to know the lay of the land here in our 2013 Base Camp. It was great to see all of the Sherpa in one place! They did a great job today, getting all 49 loads moved up to Camps 1 and 2. 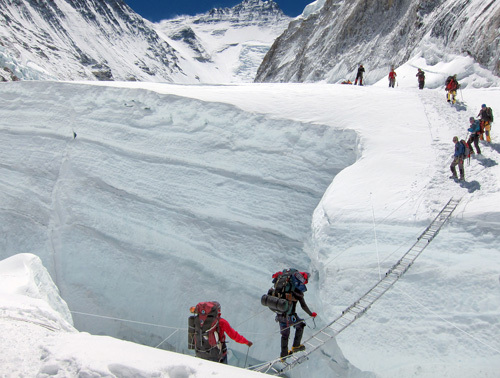 All Sherpas will take the day off tomorrow and head up the next day with big loads. Phunuru and Ang Pasang are doing a great job organizing the loads for the Sherpa carries. Camp 2 cook Shyam is working on the kitchen gear and food to go up the hill. After 48 hours of network issues, our Bgan internet terminal is now fully operational. 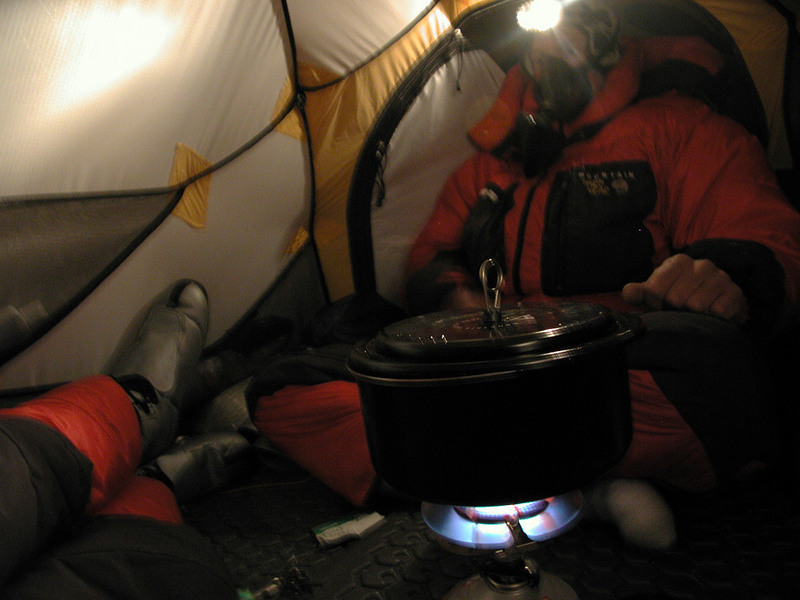 We have gusting, strong winds in Base Camp, and it is quite chilly up here! 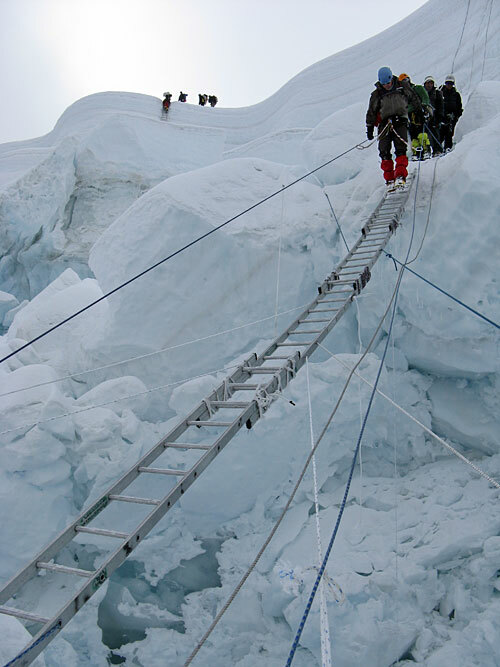 Guides Hamill, Merle, and Anderson joined the Team 1 (guided and hybrid) climbers today training with their personal Sherpas out on the glacier, getting all rigged up for the fixed ropes. They will head out in the morning for Lobuche Base Camp along with the Hybrid trekkers, who continue downhill heading back to Kathmandu. 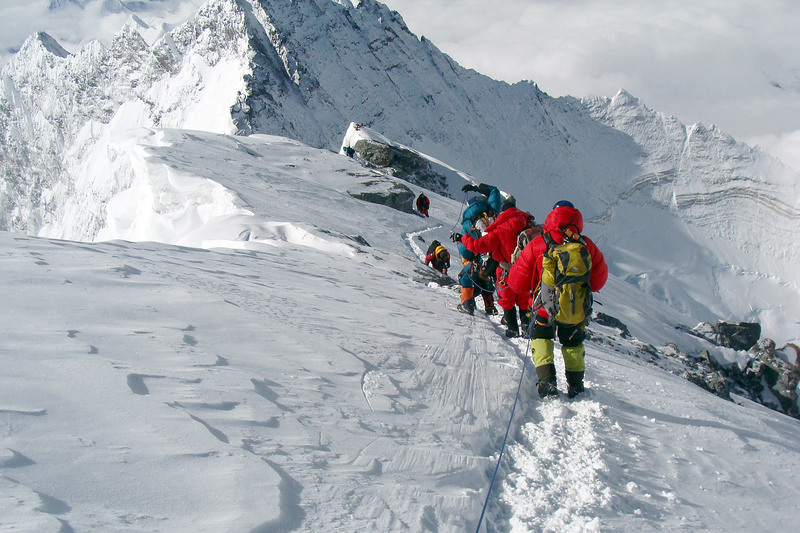 Along the way they will pass the Team 2 (Classic climbers and trekkers) on their way up to EBC with guide Aaron Mainer. 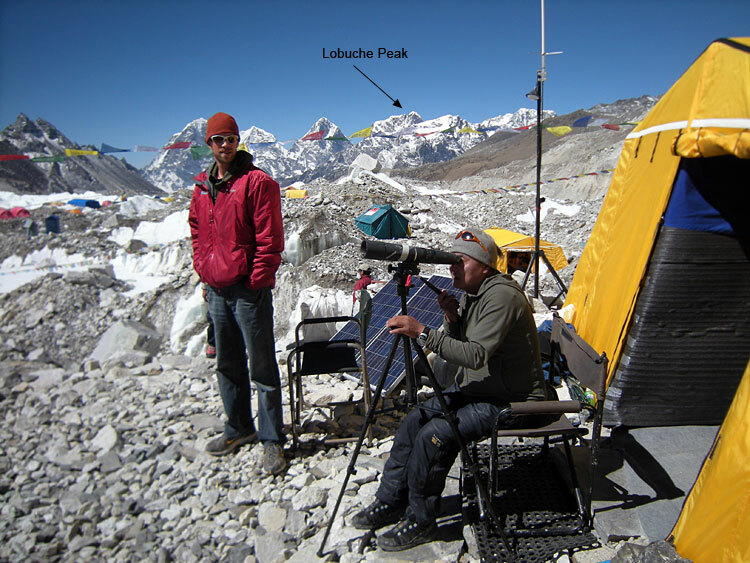 Team 3 with guides Max Bunce and Jenni Fogle will move up to Lobuche Base Camp in the morning from Pheriche. Sounds like everyone is doing well and is on schedule. 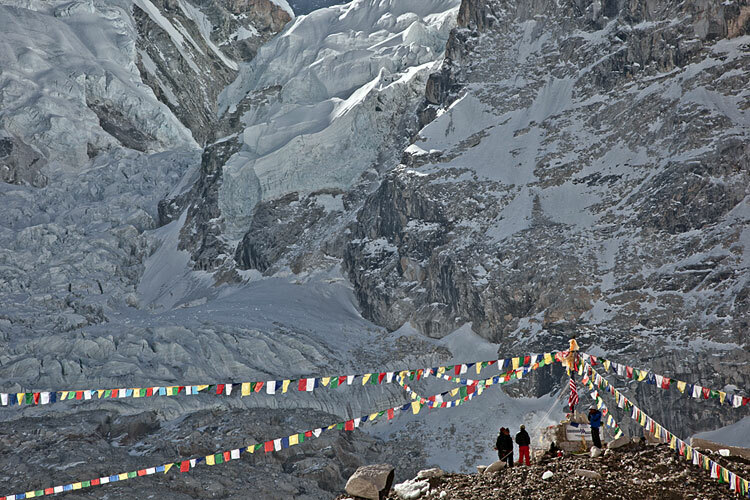 Ang Jangbu reports that the first team has arrived to Base Camp safe and sound and that the sherpas had their first of the puja blessing ceremonies today. This is a big milestone for the expedition and marks the beginning of the climbing. Team 1 will take a couple days now at Base Camp to acclimatize and prepare their gear, then head down to tackle Lobuche Peak. Tomorrow we have 27 sherpas headed to Camp 2 and 22 sherpas headed to Camp 1 to start building those camps. Mike Hamill sent a nice team photo, taken right after the puja. 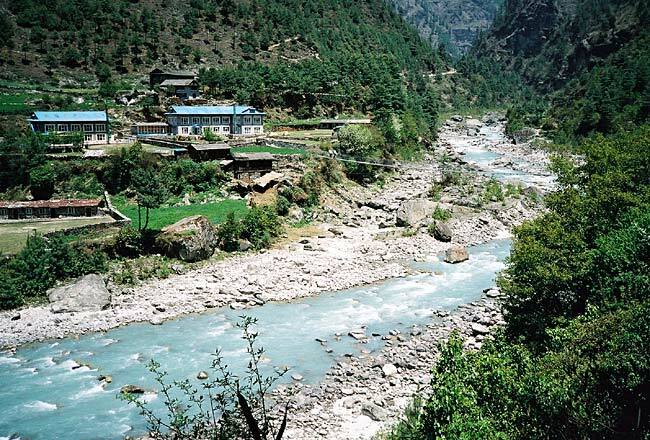 Down the valley, Team 2 is at Lobuche Base Camp and Team 3 are all in Pheriche. So far so good! All is well up here at Everest Base Camp. I got here at 10:30 am yesterday and was able to do some work in the communication tent getting the Bgan internet connected. Cell phone reception is not so good up here now, and it's pretty windy and cold here this morning. 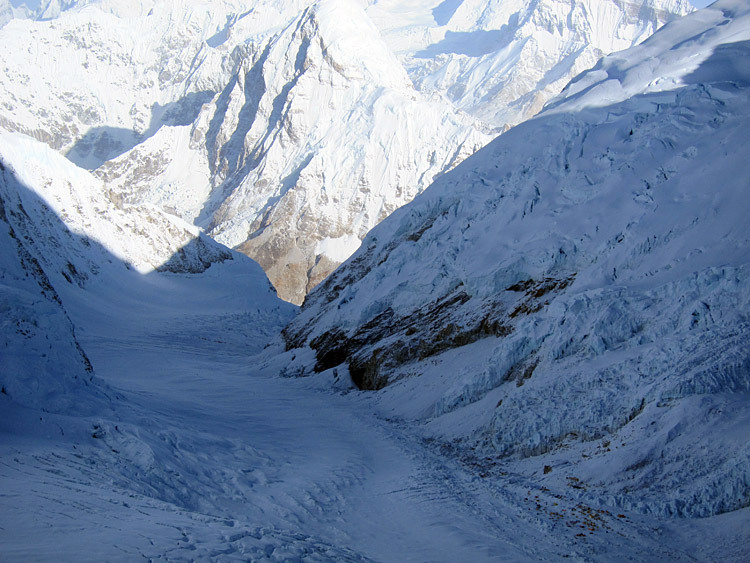 Big news is the Icefall Doctors finished fixing the route to Camp 1 yesterday. 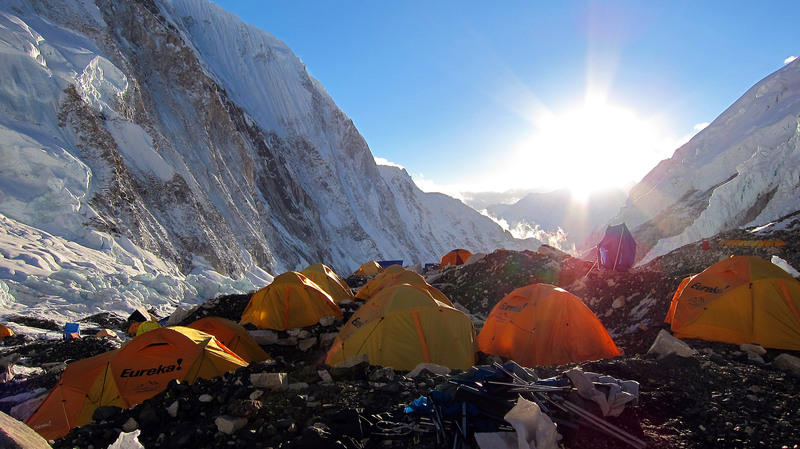 We sent 3 Sherpas to Camp 1 and 2 this morning to claim our site. Chewang Lendu, Ang Kami and Nima Tshering left 4:30 this morning and reached Camp 1 at 7:45. They claimed our Camp 1 site and then continued to Camp 2 to claim the site up there. They departed Camp 2 at 10:40am and made it back down in time for lunch. Talked to Justin at Lobuche base camp on the radio this morning and sounds like everyone on the first team is doing well and taking a rest after an acclimatization hike up to the Lobuche high camp. 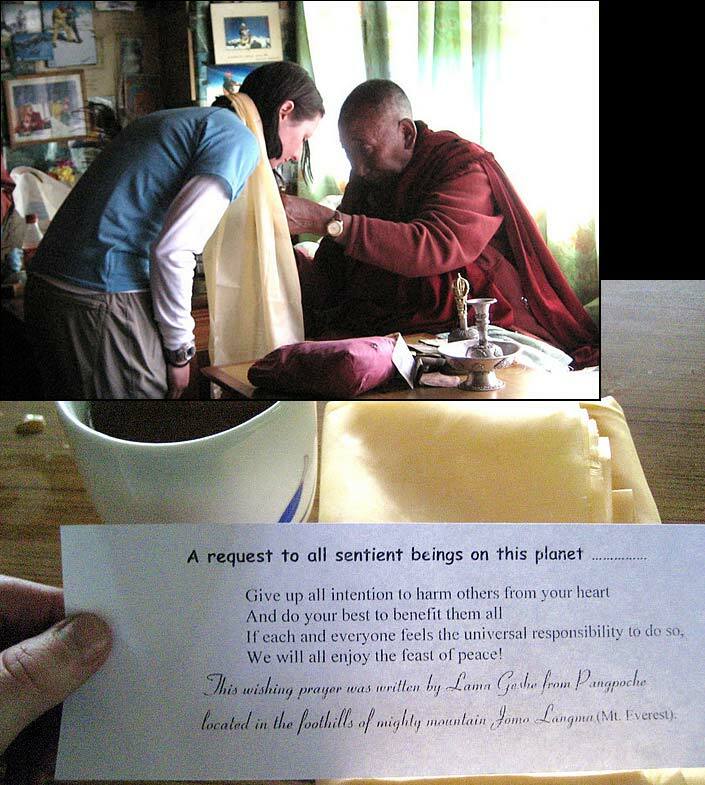 We have scheduled the first Puja for Monday morning, and the Lama from Pangboche is arriving here tomorrow evening. 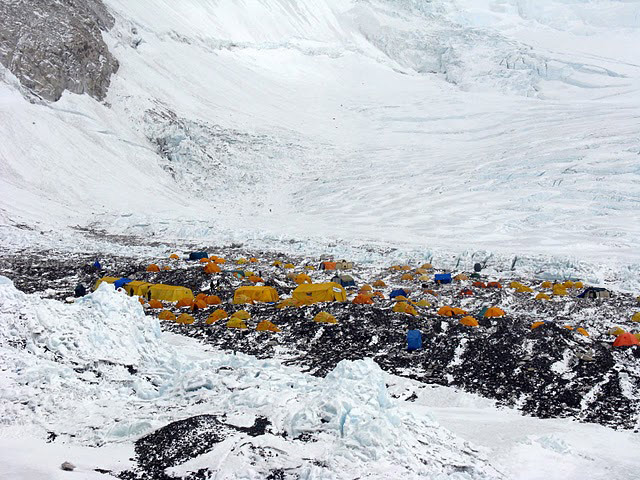 All the sherpas except for those hiking in with our teams are now here, and they have been setting up more tents. Ang Jangbu made it to Base Camp today after hitchhiking another heli ride up to Gorak Shep. It helps to have connections! 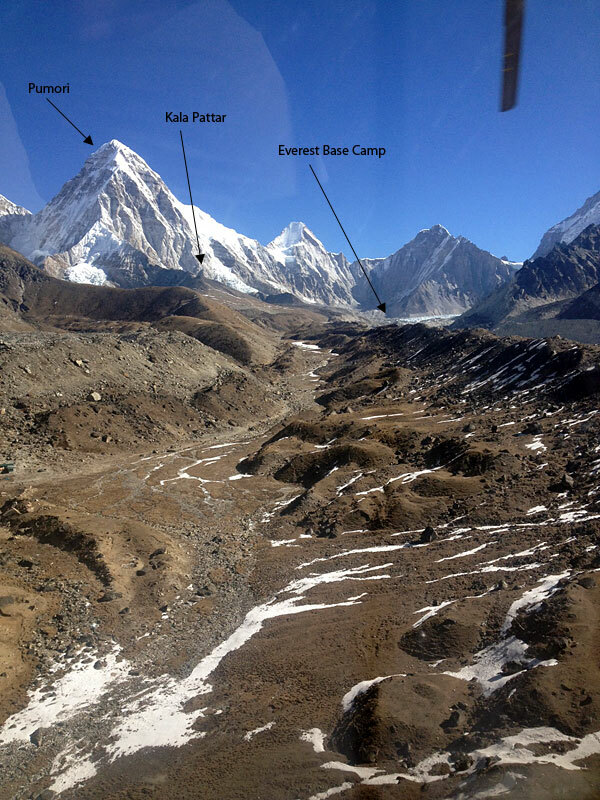 He sent a nice photo he took from the helicopter, from right above Lobuche village, looking up toward Pumori and the Base Camp area. For people who have been there before, you can pick out the trail all the way to the top of Kala Patthar if you look closely! The rest of the expedition members are all doing well, with team #1 all together at Lobuche BC, team #2 at Pheriche, and team #3 in Namche. 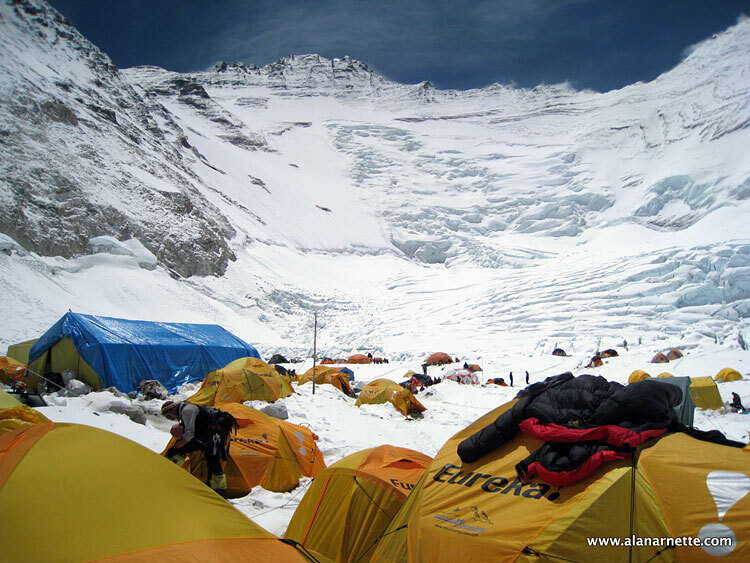 Jangbu reports that the Icefall doctors have now opened the route up the Icefall, and tomorrow the IMG sherpas will be heading up to claim campsites at Camp 1 and Camp 2. Good news! IMG leader Ang Jangbu reports that he had a nice trip into Khumbu this morning, flying to Lukla on Tara Air (fixed wing) and then hitching a ride up on a helicopter up to Pheriche. 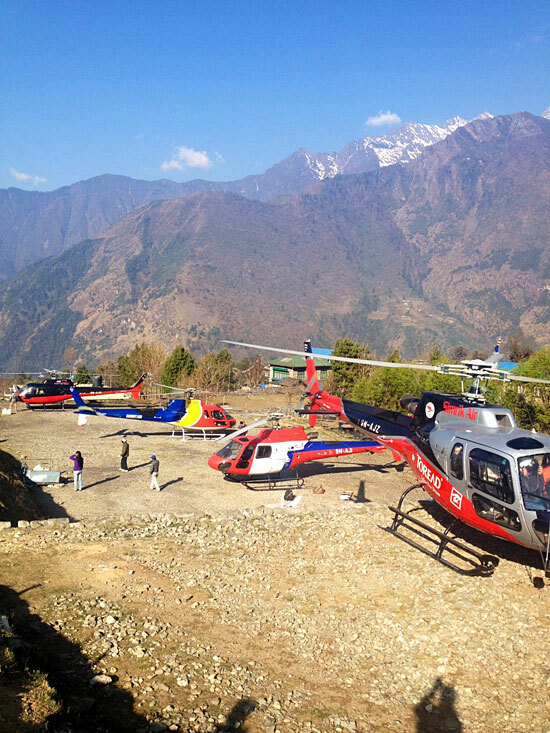 He sent a great shot of four helicopters at Lukla, representing four of the main charter-providers in Nepal. 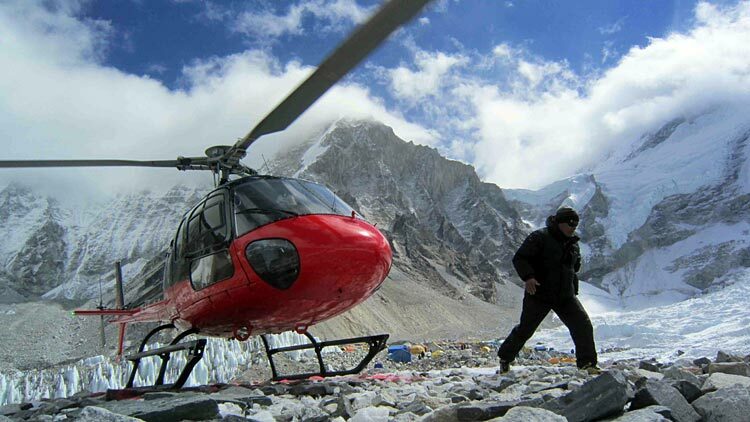 These companies generally fly the Eurocopter AS350, including the B3 model that flew to the summit of Everest in 2005. These high performance machines have become real game changers for high altitude flying into the Khumbu, making passenger shuttle-flights routine and rescue flights possible from above the Icefall (previously it required many hours and many people to get an injured climber down all the ropes and ladders). 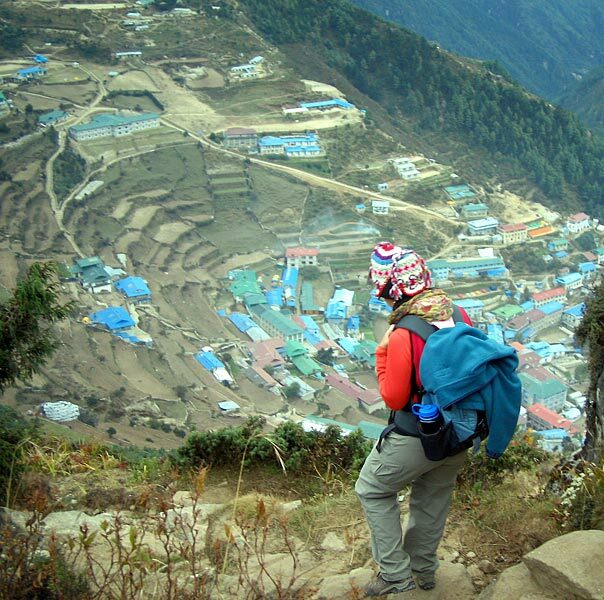 Up in the Khumbu Valley, Max and Jenni report that their #3 team is now in Namche and doing well. 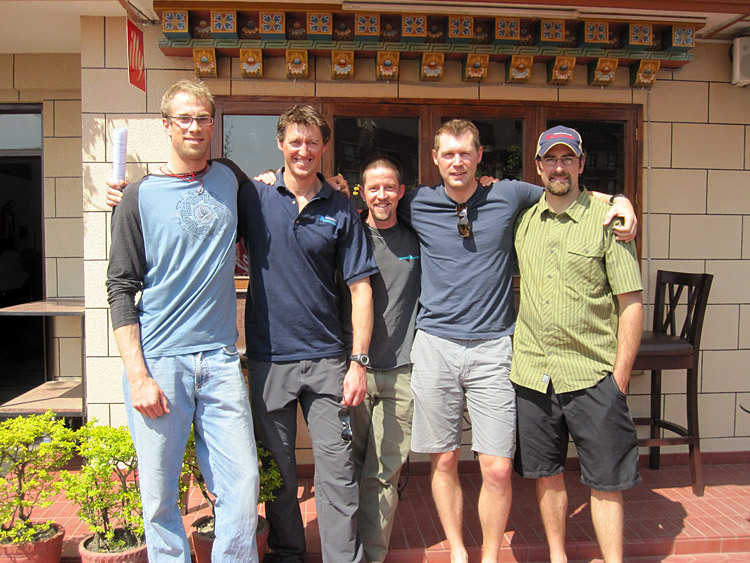 Greg and Aaron with the #2 team are in Deboche, getting ready to go to Pheriche tomorrow. Justin and Mike are heading Lobuche Base Camp today with the #1 team, and Peter is in Pheriche with a handful of folks who wanted to take an extra day to recover from some illness before heading up. So far, so good! IMG guides Mike Hamill and Justin Merle report that the first team had a good acclimatization hike yesterday in the Pheriche area yesterday, and tomorrow they are ready to make the jump tomorrow up to Lobuche Base Camp. The temperatures will take a dive, and they will feel like they are truly in the mountains now! 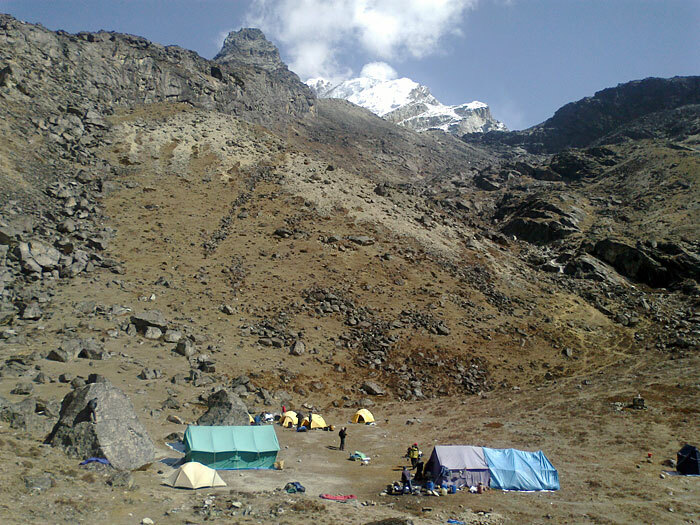 Up at Everest Base Camp, Phunuru sent a photo of the camp. 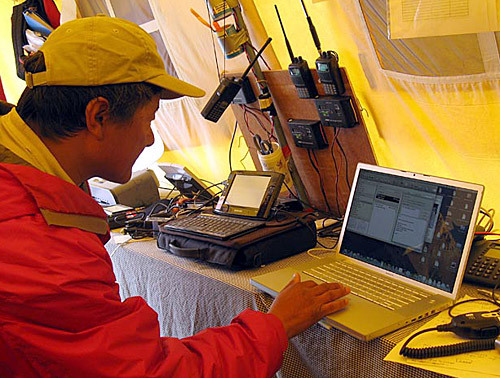 The Sherpas have the VHF radio set up at EBC, so they are able to talk easily to the team in Pheriche. Sounds like the team has been doing a great job getting the camp set up and now have most of the platforms constructed and tents up. 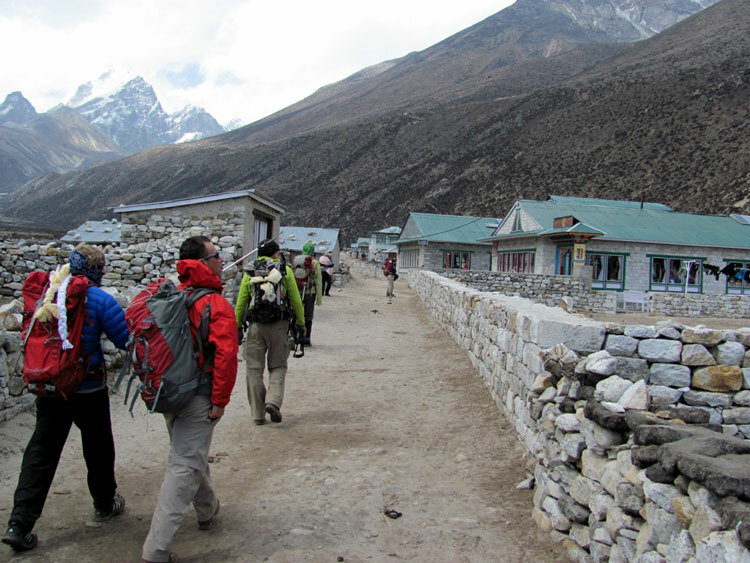 Greg Vernovage reports that the Second Team is taking their second acclimatization day in Namche, visiting the Sherpa museum, and doing some shopping. 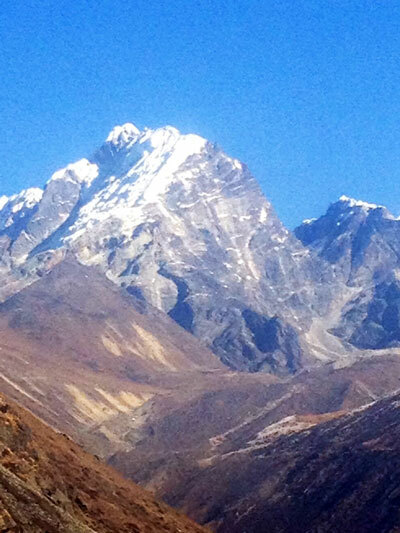 The weather has been excellent, and the team got some great views of Everest from up by Syangboche. Further up the valley the first team with Mike and Justin are moving up to Pheriche today and going to see Lama Geshe at Pangboche Monastery on the way. The third team, with Max and Jenni, landed in Lukla this morning with all of their duffels and are on the way to Phakding. IMG guides Jenni Fogle and Max Bunce report that our third and last team have all safely arrived to Kathmandu and are packed and ready for the Lukla flight early tomorrow. Today the team did gear checks and last minute errands, and then enjoyed a team dinner this evening. 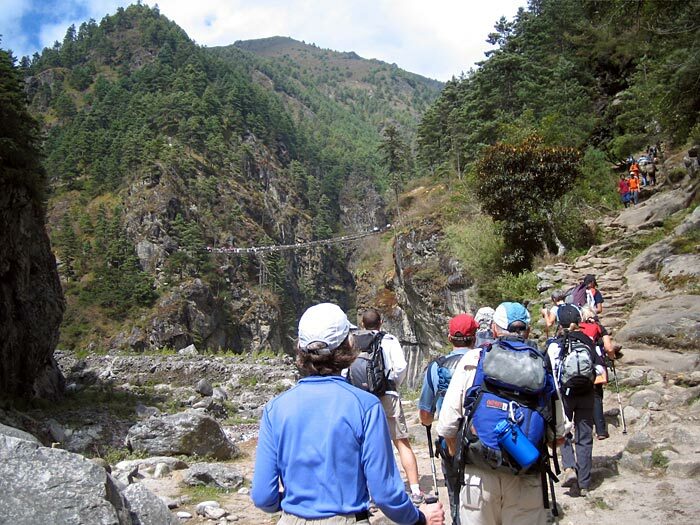 This group includes a nice mix of Base Camp trekkers and also Everest, Lhotse, and Lobuche Peak climbers. 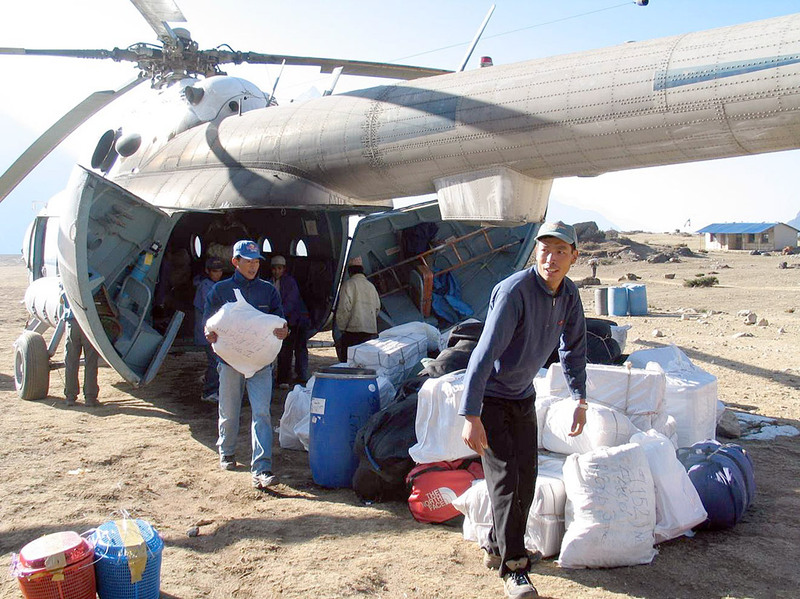 Ang Jangbu reports that all the remaining baggage, additional oxygen, and supplies have now been flown/portered up to Syangboche and that Ang Pasang is coming down with the yaks to collect these remaining loads and move them to Base Camp. Higher up the hill, the first team is enjoying an acclimatization day in Deboche and the second team is taking an acclimatization day in Namche. 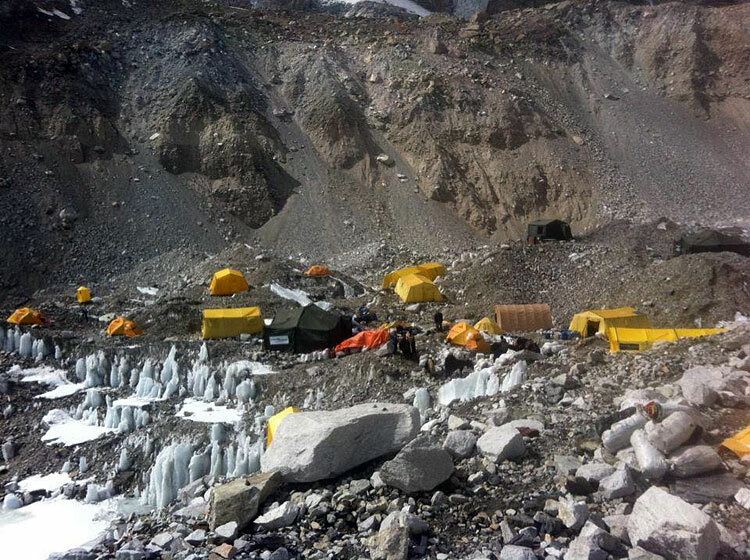 Up at Base Camp Phunuru called down to report that he and Lhakpa from HRA staked out a heli pad location and that in the coming days the climbers and sherpas will be working to improve this site (normally it is built up on an ice hump, so the helicopters have a clear shot down the glacier on takeoff). It sounds like the Icefall Doctors are making good progress with the Icefall route and that they are getting close to reaching Camp 1. IMG guide Mike Hamill reports that all's well up in Namche (at about 11,300 feet). After a couple days of acclimatization and hiking, the first team is ready to head for Deboche in the morning. Today was market day for the local people, so lots of traders came to town selling their wares. 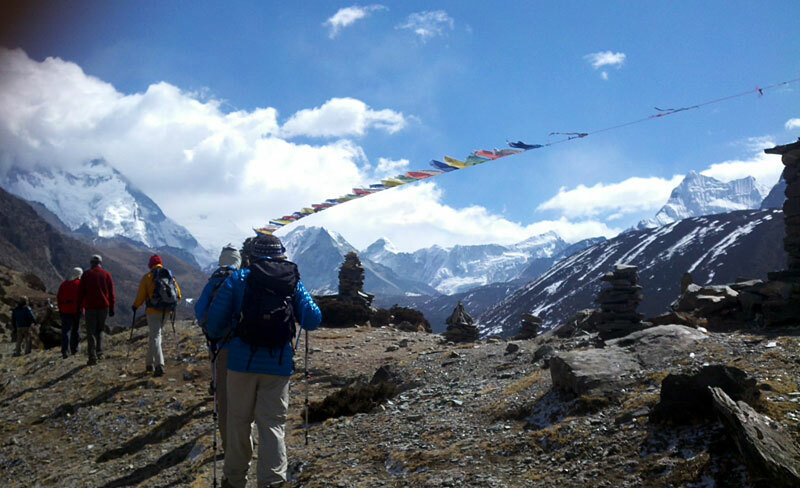 Down in Phakding, Greg Vernovage reports that the second team had a good flight to Lukla and nice hike today. 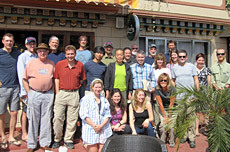 They are all doing well and will be heading up the famous Namche Hill tomorrow. The third team is now arriving in Kathmandu, and their IMG leaders Max Bunce and Jenni Fogle are assisting with their final preparations and gear checks. So far so good! IMG guides Greg Vernovage and Ang Jangbu report another busy day in Kathmandu. The second crew finished their gear checks and preparations today, and had a nice team dinner this evening. They are all ready to go for the early wake up tomorrow morning so they can make it to the airport in time for the Lukla flights. 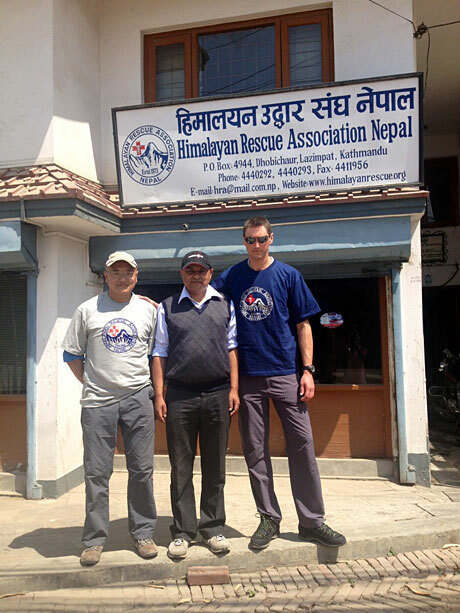 Also today, Jangbu and Greg visited the Himalayan Rescue Association (HRA) which is the organization that operates the clinics in Pheriche and at Base Camp. 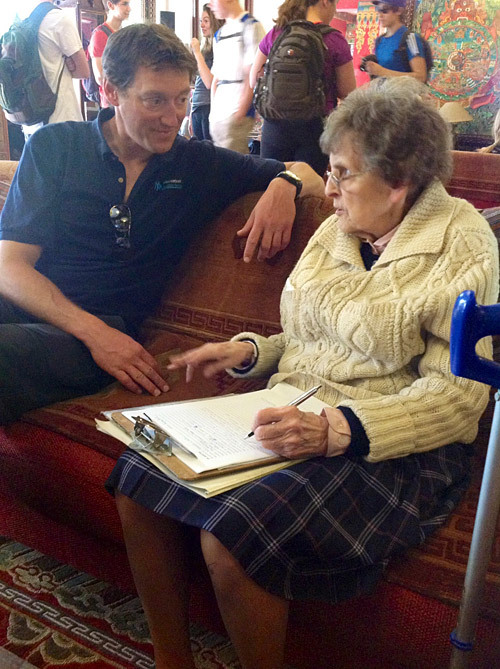 IMG has been a longtime supporter of Dr. Luanne Freer and the Everest Base Camp Medical Clinic. 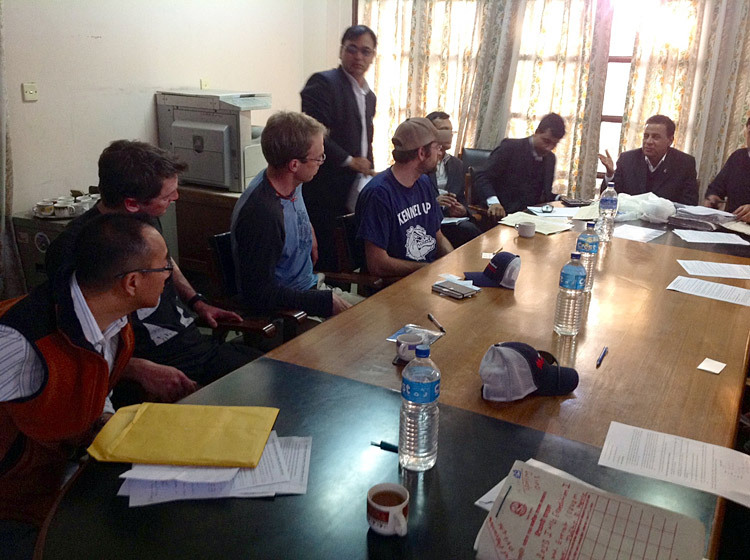 All IMG climbers and Sherpas are subscribed to the HRA service, which provides for consultation and support from the HRA docs up at Base Camp. Good news on several fronts: Ang Jangbu Sherpa says the weather was excellent yesterday which allowed all the first team's luggage to get flown in to Lukla. 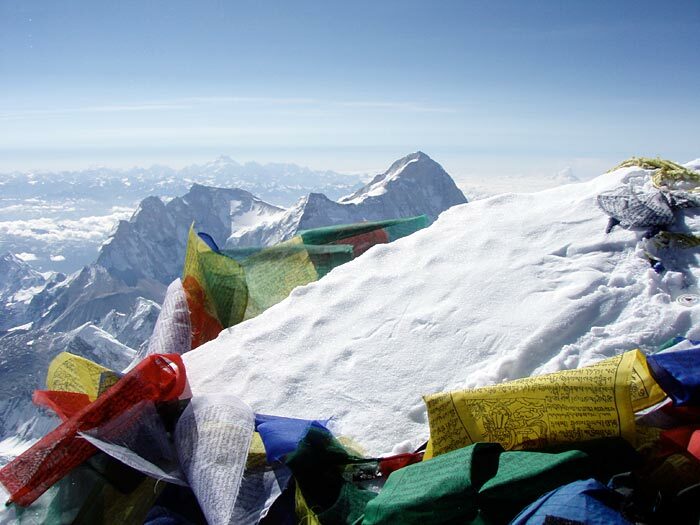 Also, the oxygen and gear that was previously sent to Phaplu was successfully flown up to Syangboche. 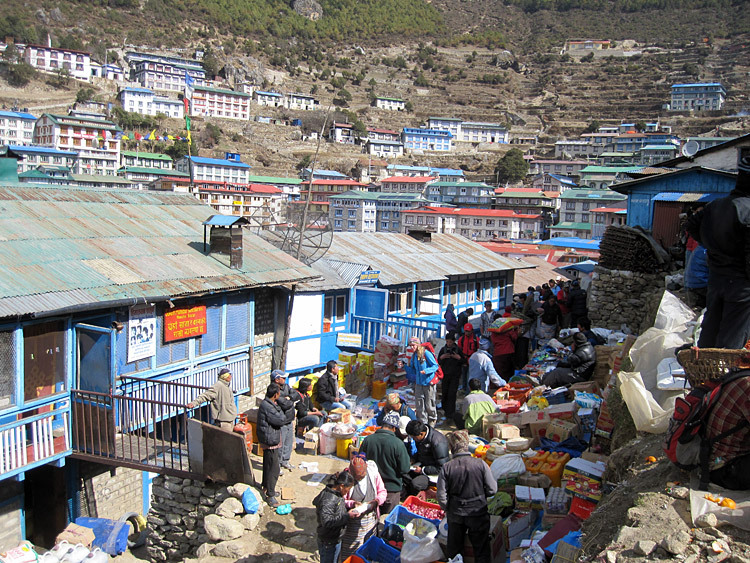 After spending last night in Phakding, the first team are now on their way to Namche. Today IMG guides Peter and Justin will meet with sirdar Ang Pasang and register with the SPCC in Namche to pay the Icefall fees. 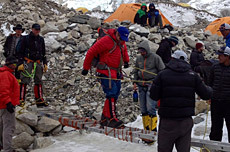 Up at Everest Base Camp the IMG Sherpas report that most of the team's big tents have now been erected. 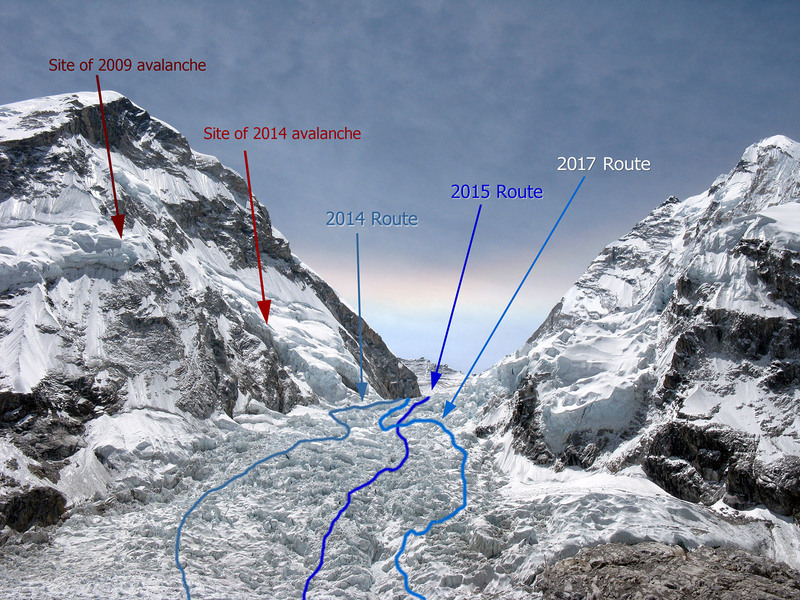 Also, that the Icefall doctors have been making good progress, and have now pushed the route well above the "Popcorn" section of the Khumbu Icefall. 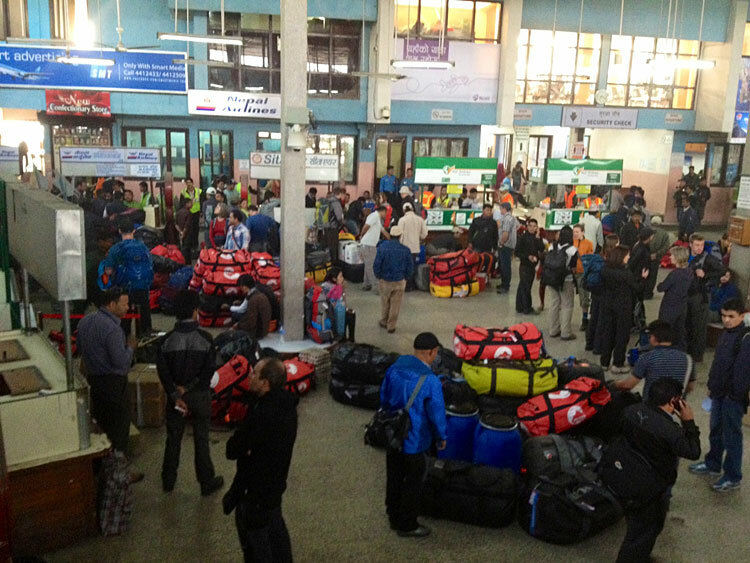 Back in Kathmandu, guides Greg and Aaron report that the second team is now arriving and getting their gear organized. So far, so good! First team ready to fly to Lukla! Ang Jangbu reports that our Kathmandu crew sent another 60 loads of gear to Phaplu by truck with Purna Shrestha, one of our cooks. 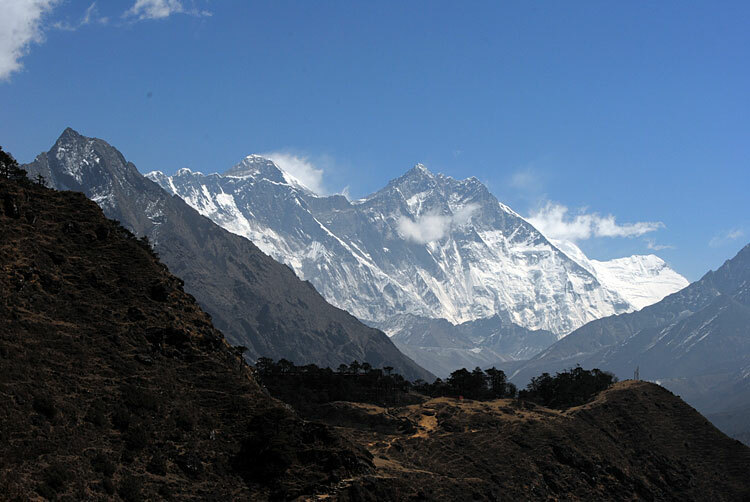 From there it all gets flown to Syangboche, and then goes by yak to Everest BC. 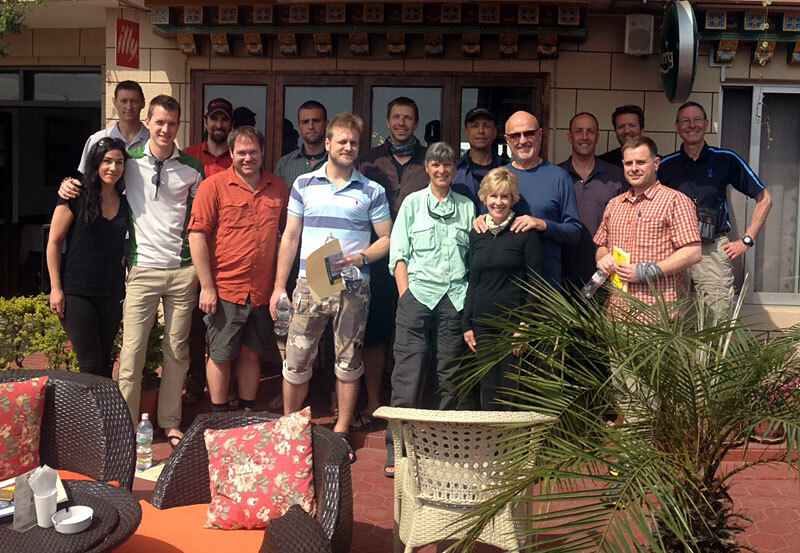 In Kathmandu, the IMG leaders had a chance to meet again with historian Liz Hawley. It is always great to see Liz again and get the latest news. 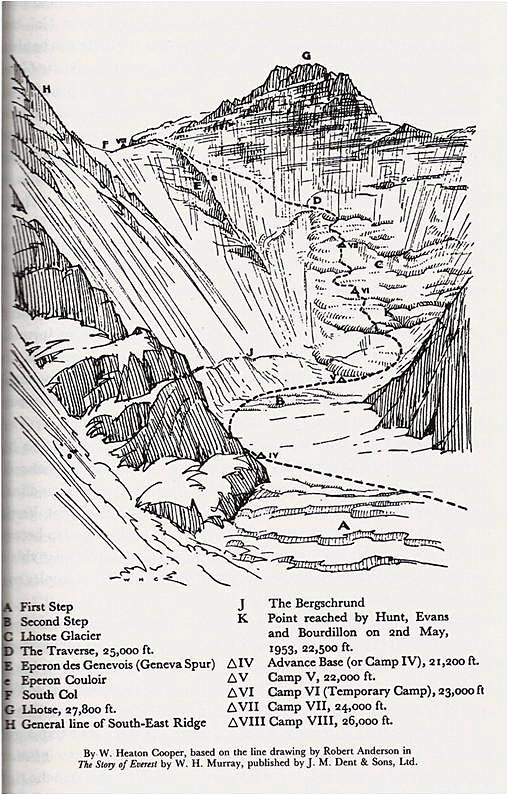 If you are interested in the definitive Himalayan climbing history, see her Himalayan Database which is the product of Liz's research and Richard Salisbury's database skills. Greg Vernovage reports that the team spent the day doing gear checks and then enjoyed a team dinner together. Everyone is doing well, has arrived with all their luggage and are ready to head for Lukla in the morning! 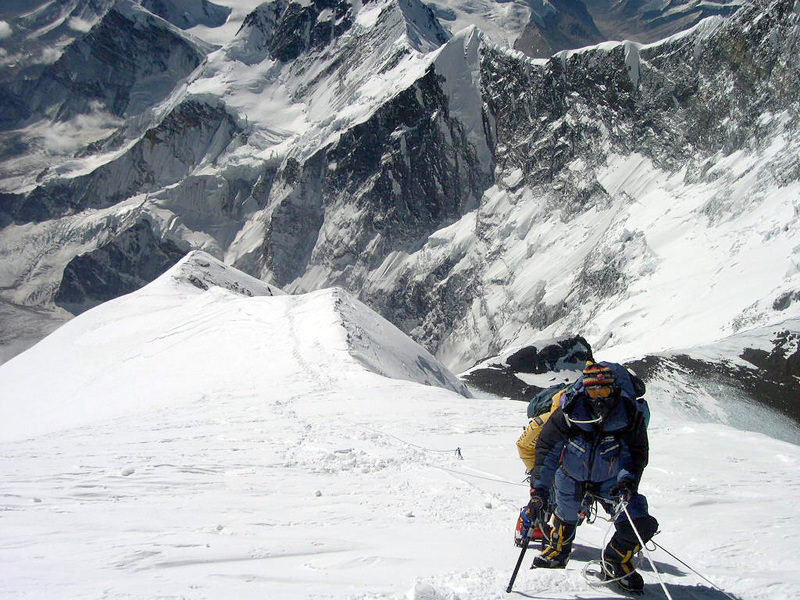 Everest and Lhotse climbing permits issued! 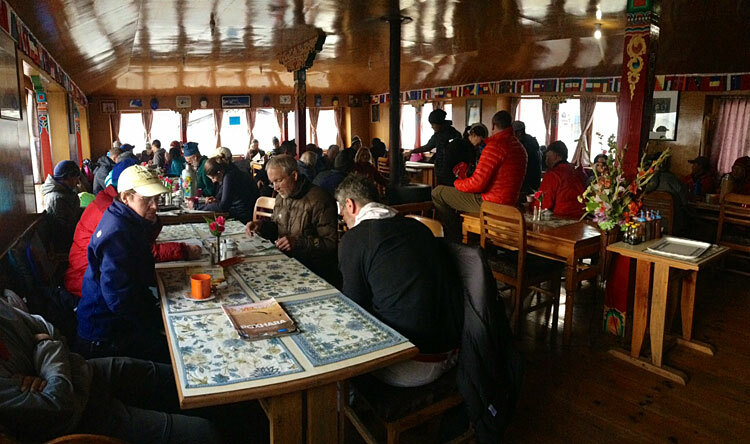 Yesterday was the day for the mandatory briefing at the Ministry of Tourism, required for all expedition teams. At this meeting the formal permits were issued and the team met their Liaison Officers who are assigned to monitor the team while climbing. It is mostly ceremony, some business, and always fun to actually get the paper in your hand! Members of the first team (hybrid and guided climbers) have been arriving today to Kathmandu, and tonight they will convene for the first of the three "welcome dinners" we are hosting for our teams. Despite a few flight glitches along the way, it sounds like most people have been arriving on schedule with their bags. So far, so good! 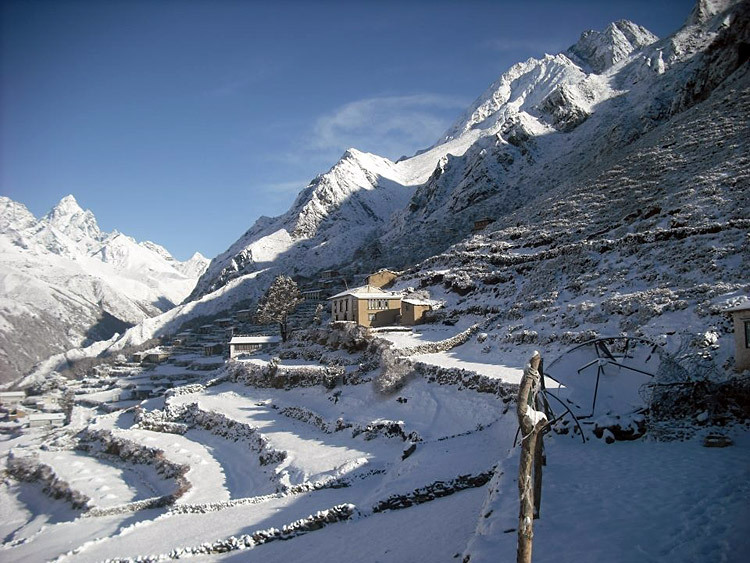 More snow in the Khumbu! Ang Jangbu forwarded this photo of Phortse village, taken yesterday. 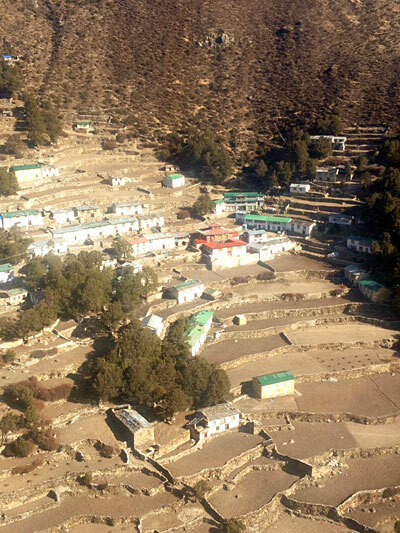 Phortse, at an elevation of about 12,500 feet, is the home of many of our IMG Sherpa team. The Khumbu area continues to get plenty of snow and rain this winter, which is good news for the climbers (and farmers), but the trekkers better have their boots and gaiters! IMG expedition sirdar Ang Pasang called from Everest Base Camp to report that our advance sherpa team of 14 sherpas and 3 cooks have now established our Base Camp! Now, they are hard at work, with lots of tent platforms to build and tents to erect. After deciding exactly where to set up the tents, Ang Pasang is heading back down to get ready to receive the next shipment of loads being sent from kathmandu and headed up the hill. He said base camp area is looking pretty good, but that the terrain has changed a lot just since they were up there in December to reserve the campsite. Every day the Khumbu Glacier continues to move and melt, and the tents will need to be reset over the course of the expedition. There are several other teams that are also starting to move into EBC now, including the SPCC (Sagarmartha Pollution Control Committee) team. SPCC is the organization that prepares the Icefall, and their sherpas (known as the Icefall Doctors) had their puja on Sunday March 17. So, this means that they are ready to start building the Icefall route. That is great news, meaning there with hopefully be no delays waiting for the Icefall route to get finished when our climbers arrive. 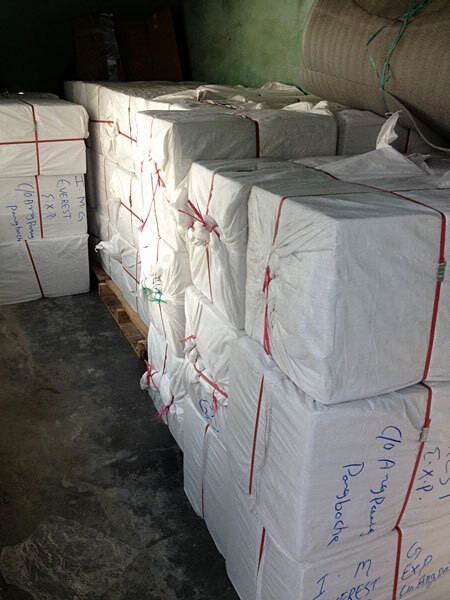 Our oxygen shipment cleared Nepal customs, and our Sherpa team has been busy getting it all repacked into yak loads for the trip to BC. Since the yaks do not read the warning labels on the oxygen cylinders, we need to make sure each bottle is well protected with additional foam and bubble wrap! Ang Jangbu reports that there is only one of the big MI 17 helicopters operating in Nepal these days, so we have had to rely on various transport methods for the three big loads already in the Khumbu: one went from Kathmandu to Lukla via fixed-wing charter, and the other two went to Syangboche (just above Namche) by smaller charter helicopters from the airports in Phaplu and Jiri. Now the Kathmandu team is getting ready to send the fourth big load via one of the above methods, depending on which aircraft are available. 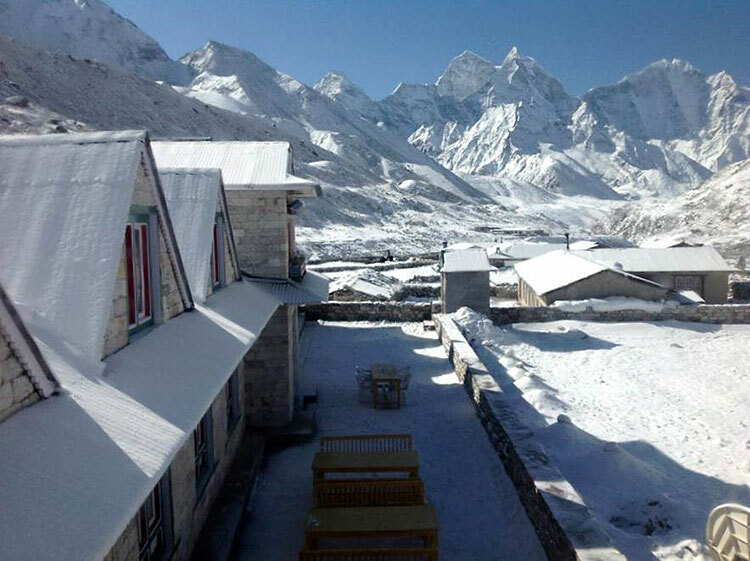 Ang Nuru Sherpa, owner of the Himalayan Hotel in Pheriche, sent a photo of his lodge this morning after a snowstorm yesterday (the pointy peak in the background is Ama Dabam). 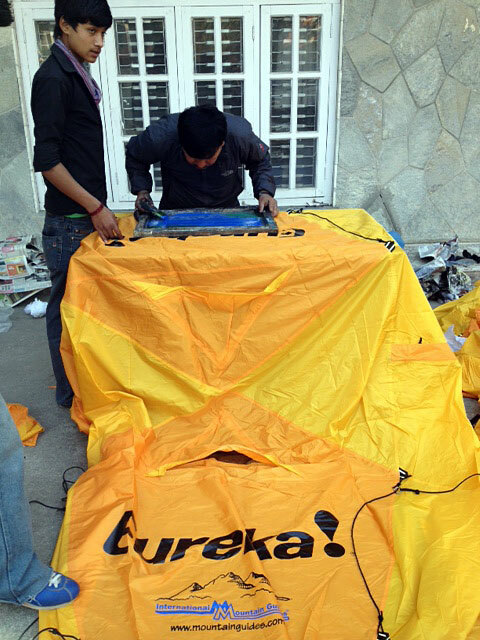 Our lead team of 14 Pangboche-based sherpas, headed up by Karma Rita, are packing loads today and will be heading up to Base Camp tomorrow to start building the camp. 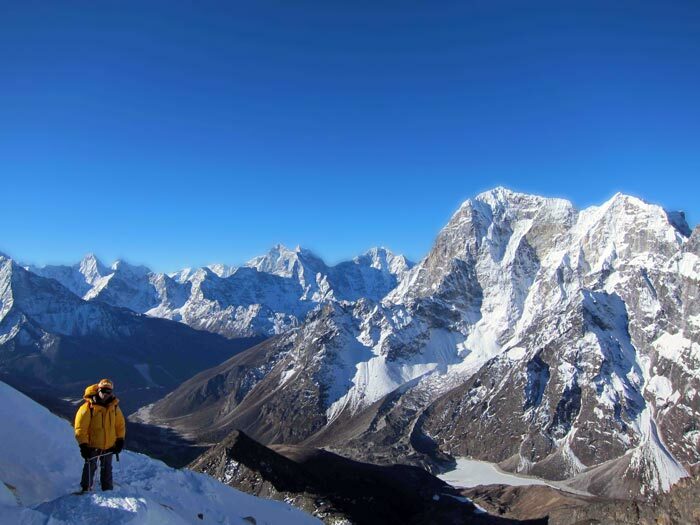 The sherpas report that Everest and the local mountains have received a good amount of snowfall this winter. 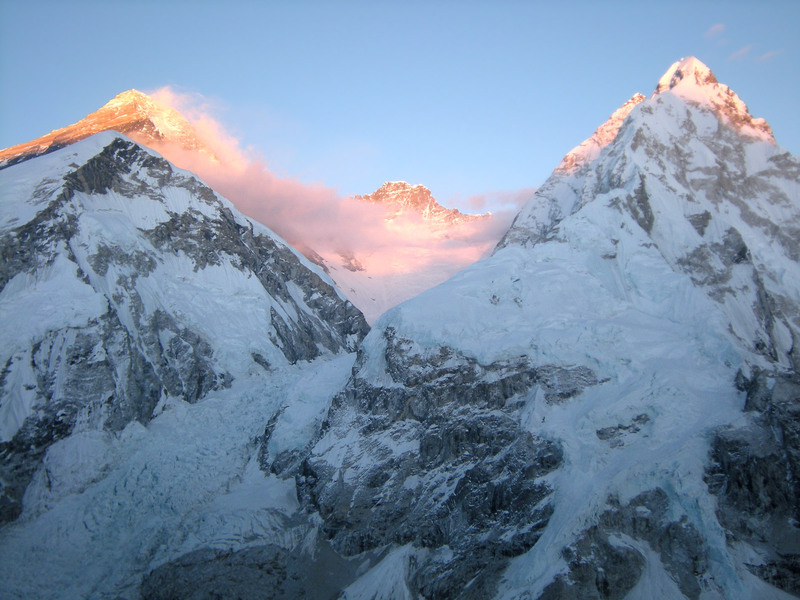 That is good news for climbers, potentially making the route is less icy and rocky (especially on the Lhotse Face). Of course, lots can change in the next couple months, but we are glad to hear that at least the winter so far has had some good snowfall! Yesterday was a bandh (strike) day in Kathmandu, so everything was shut down in town. The crew made good use of the day by repacking all the gear and boxes into porter loads. They also pulled out all the new tents and flys for IMG logo silkscreening. 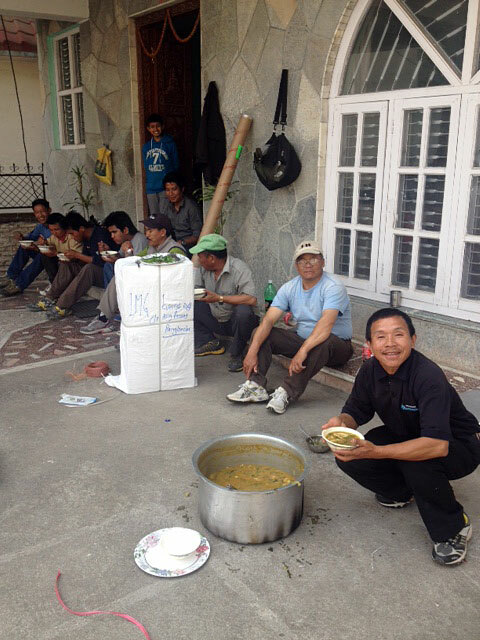 Jor Bahadur made Sherpa stew for the boys, and they had a good stew lunch! 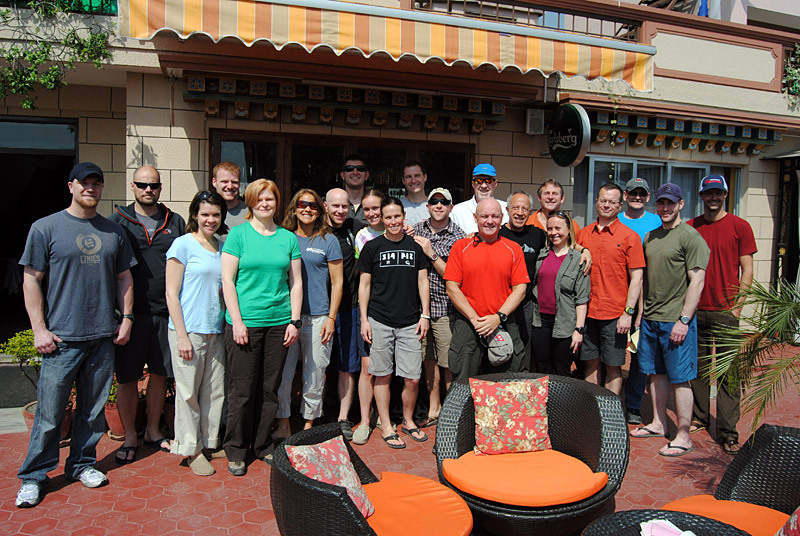 IMG's Everest 2013 Expedition Begins! 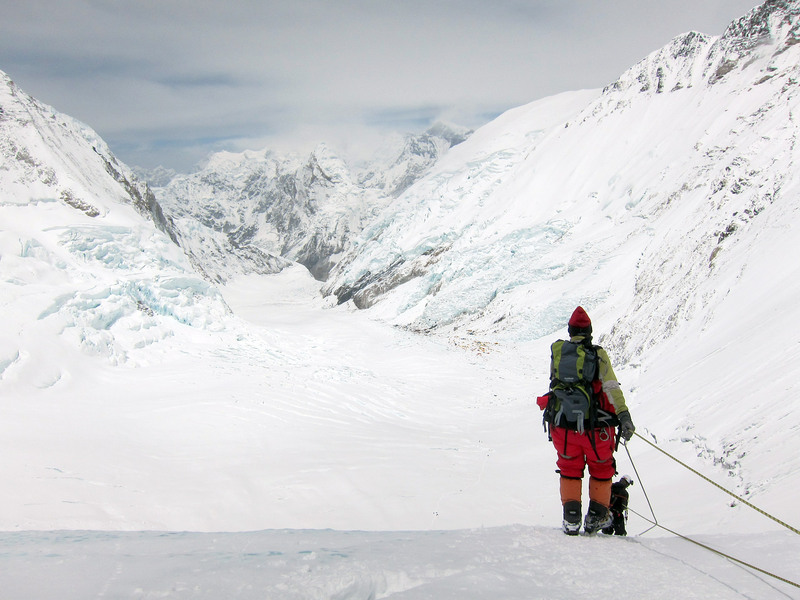 I've been working on the 2013 Everest expedition for the better part of the last year, and for me it is exciting to see all the planning become reality. This past week I was joined by IMG leaders Greg Vernovage and Mike Hamill for a big food packing session. 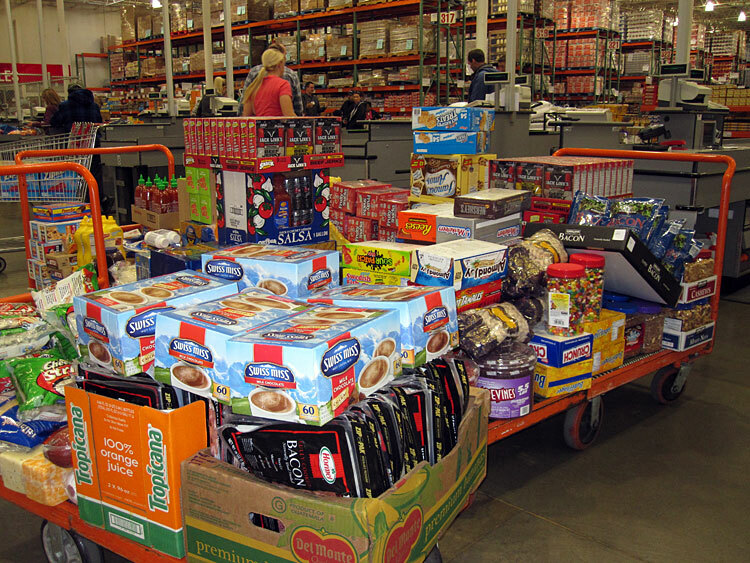 We started with the usual trip to Costco, where we filled more than a half dozen big carts with groceries. 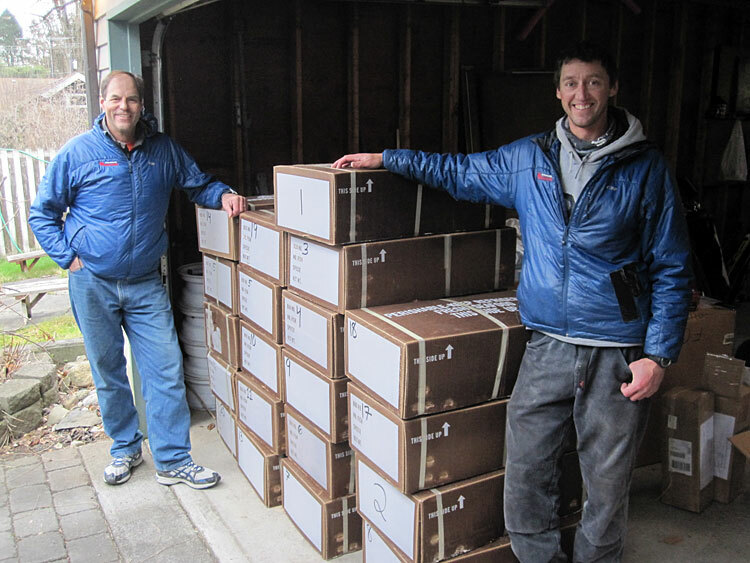 Then, it was back to the garage to strip the packaging (we sent a whole van load of cardboard to the recycle in Tacoma) and pack it all for airfreight. 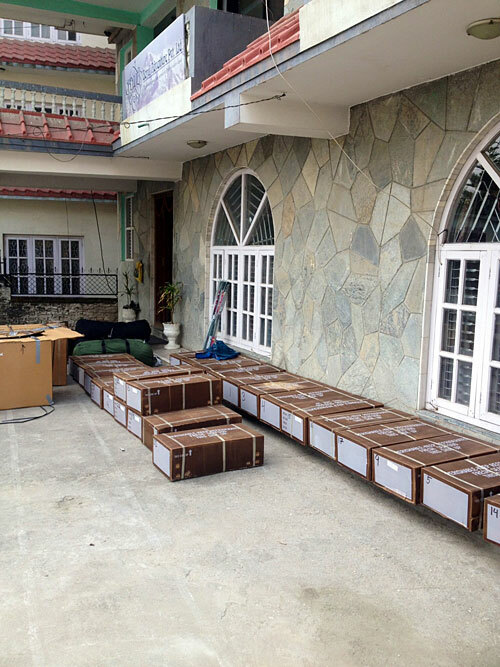 As we speak, our first shipment of food, tents, rope, and other gear has now landed in Kathmandu. 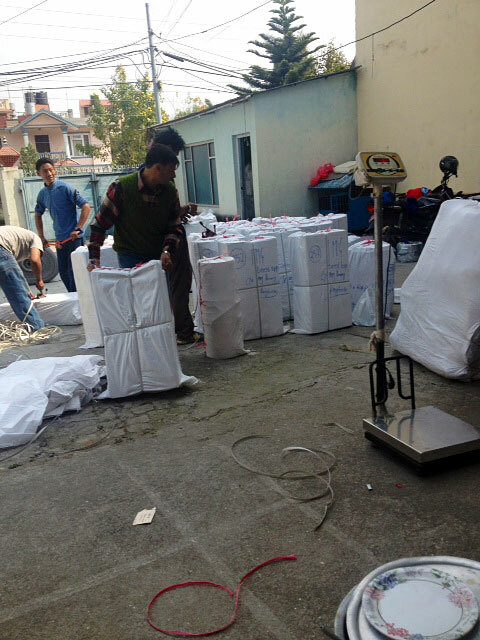 Over the coming weeks, we'll send additional supplies in preparation for the main event, and the members will be arriving in Kathmandu during the last week of March. We are rolling!